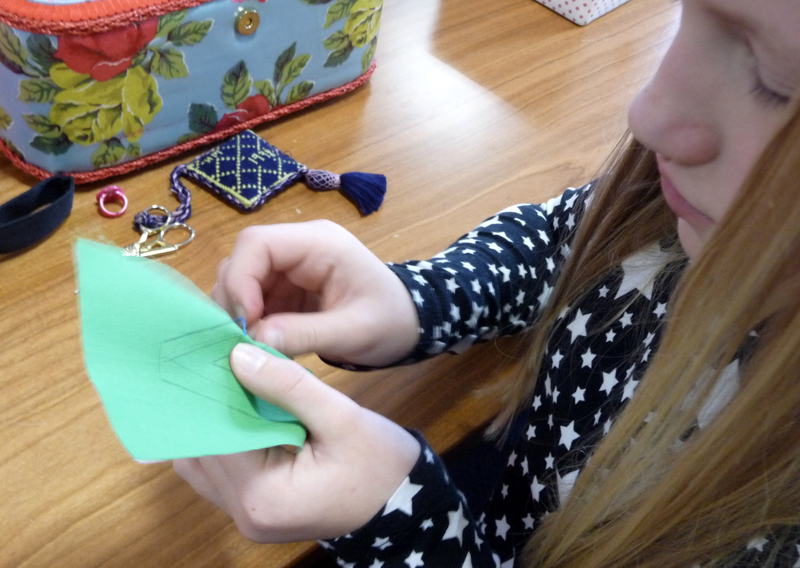 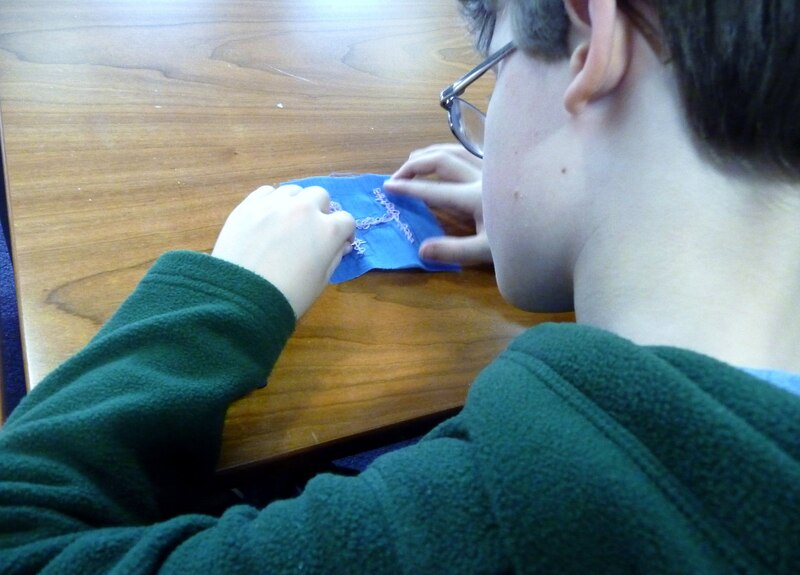 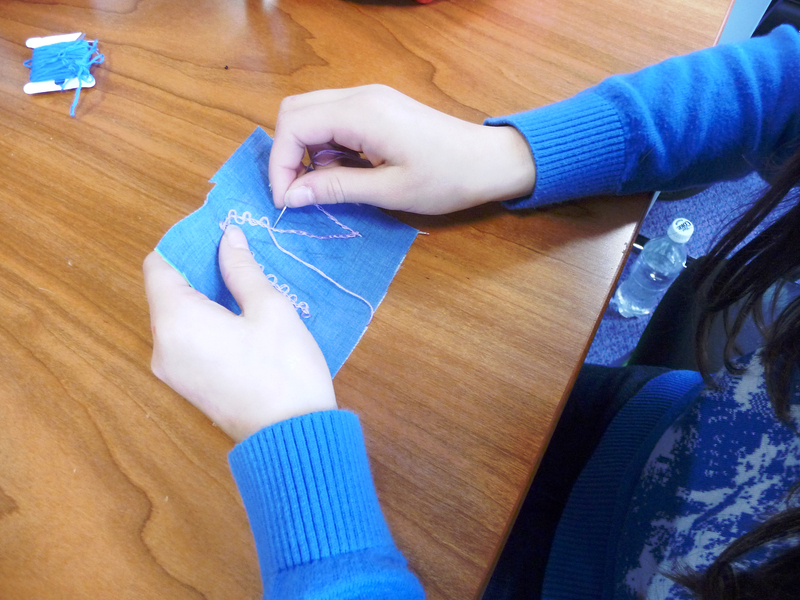 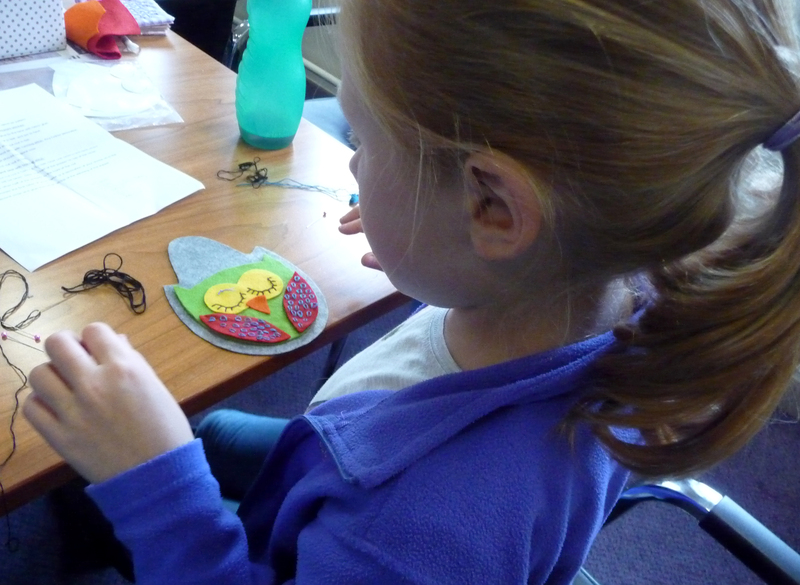 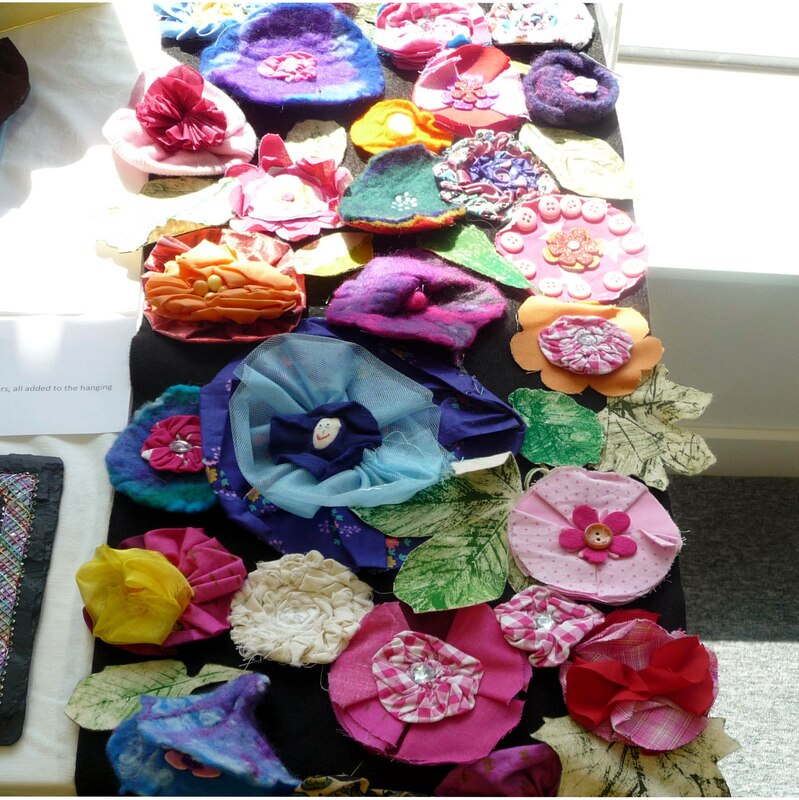 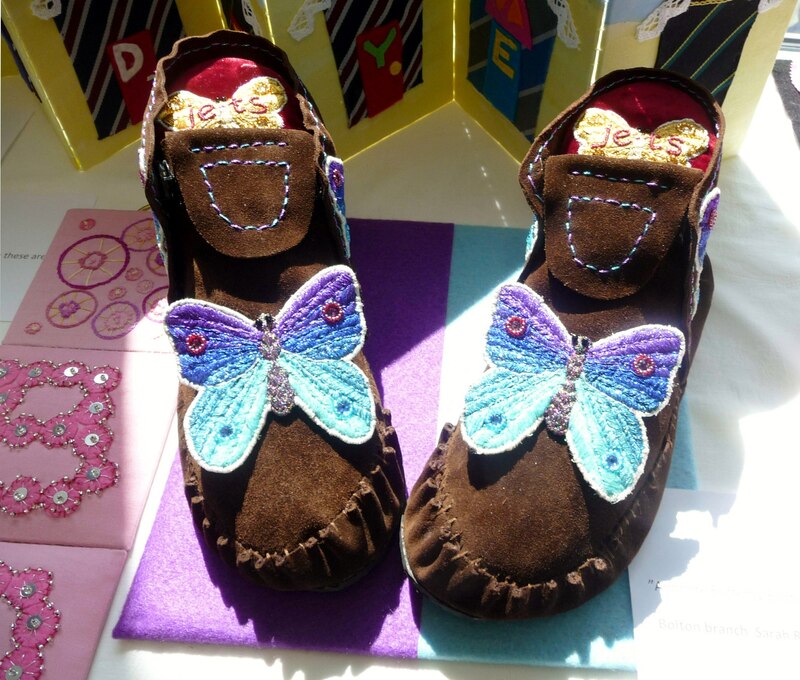 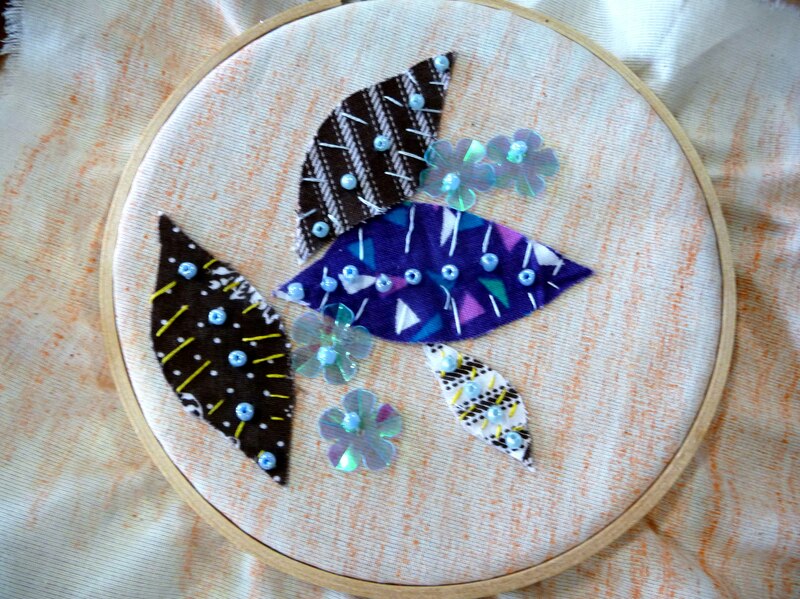 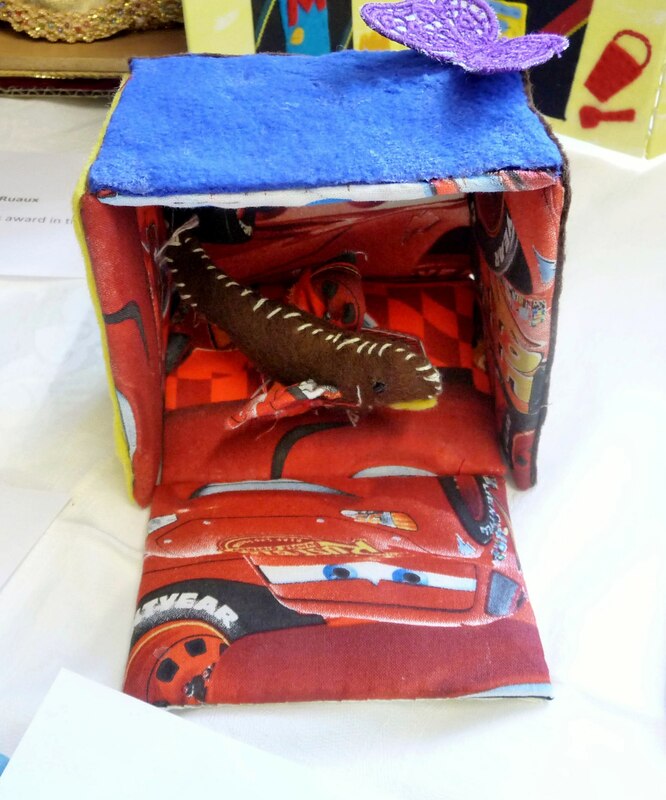 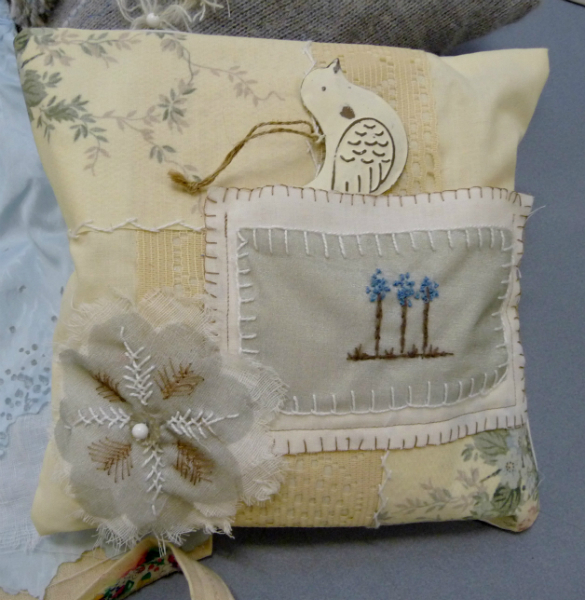 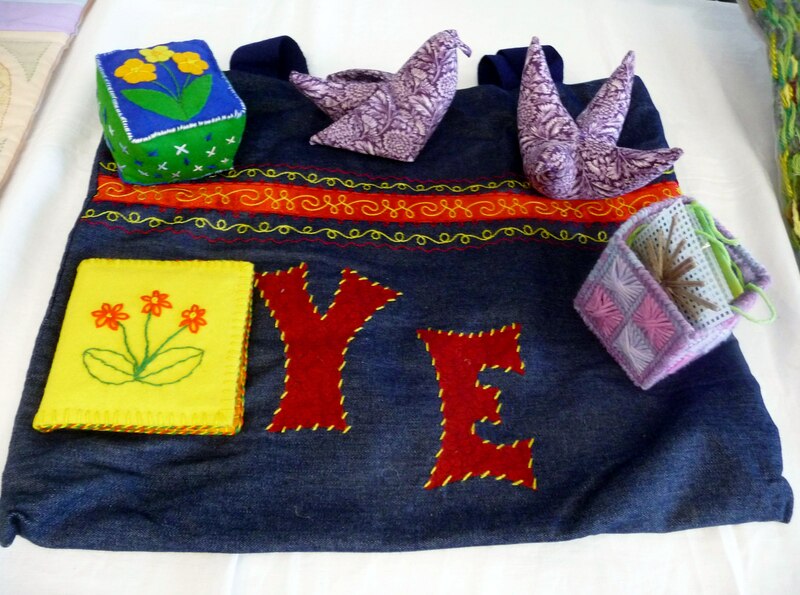 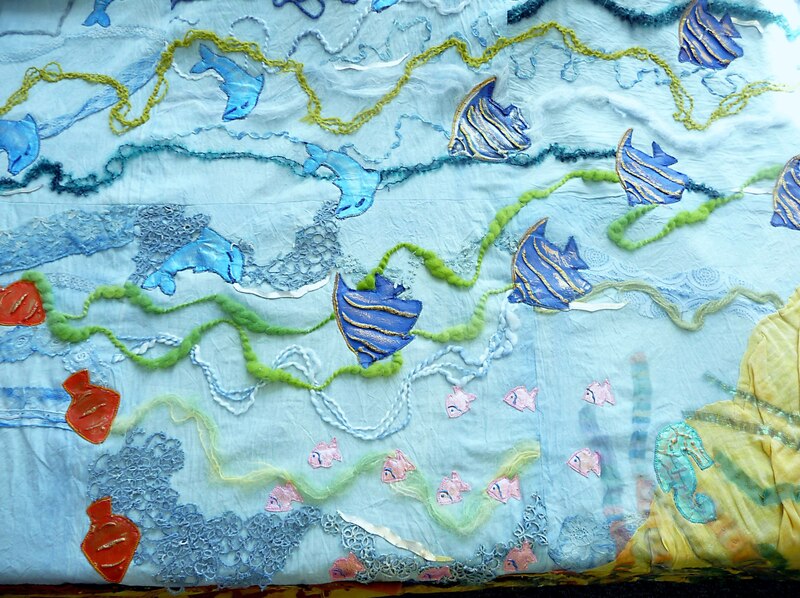 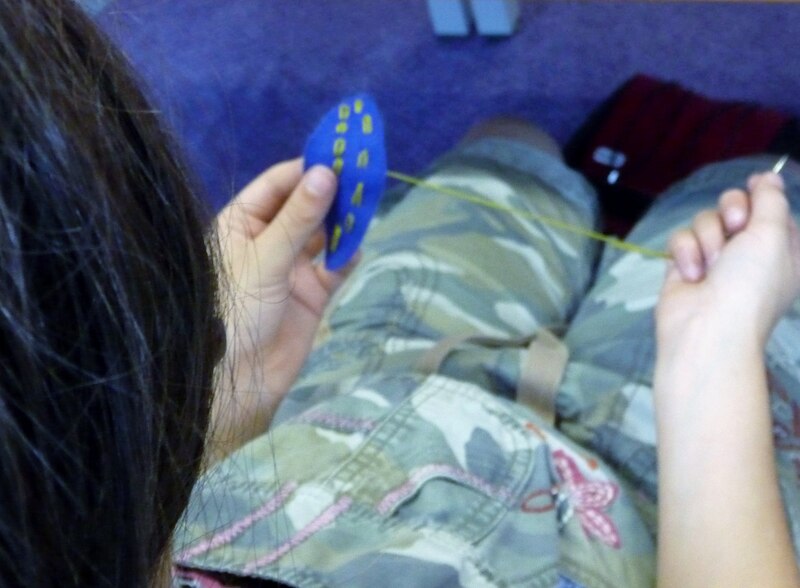 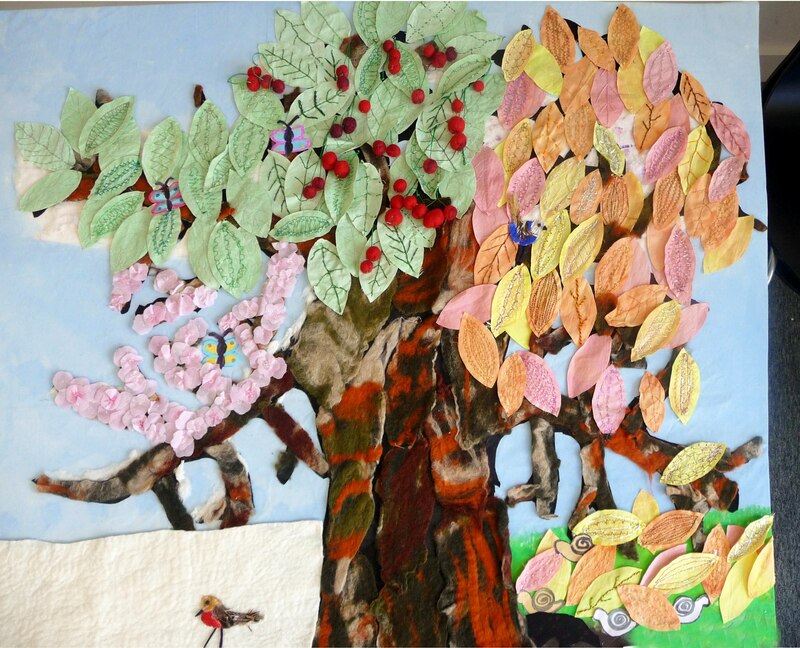 Young Embroiderers are members of The Embroiderers’ Guild aged 7 – 17 years. 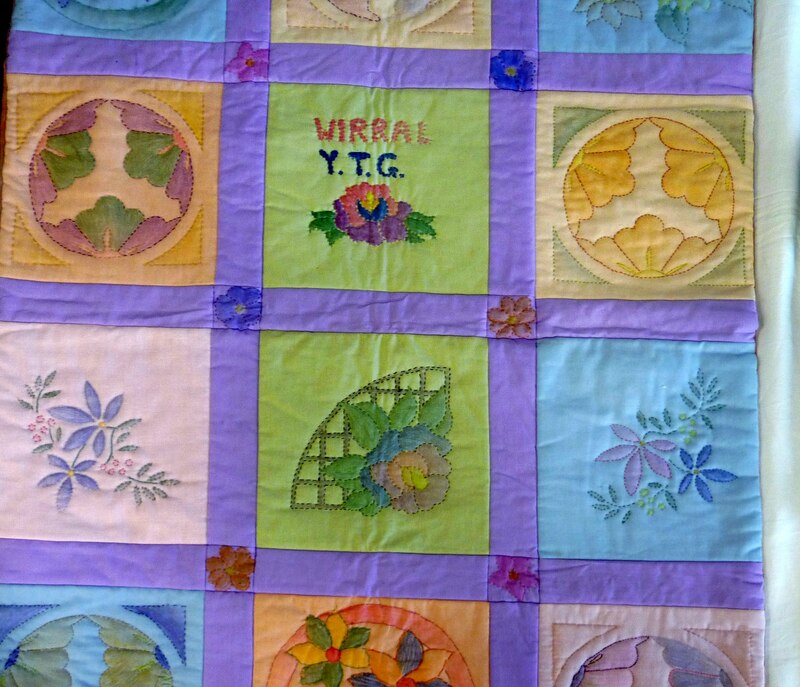 We meet monthly in Womens’ Hospital, Crown Street, Liverpool, L8 7SS. 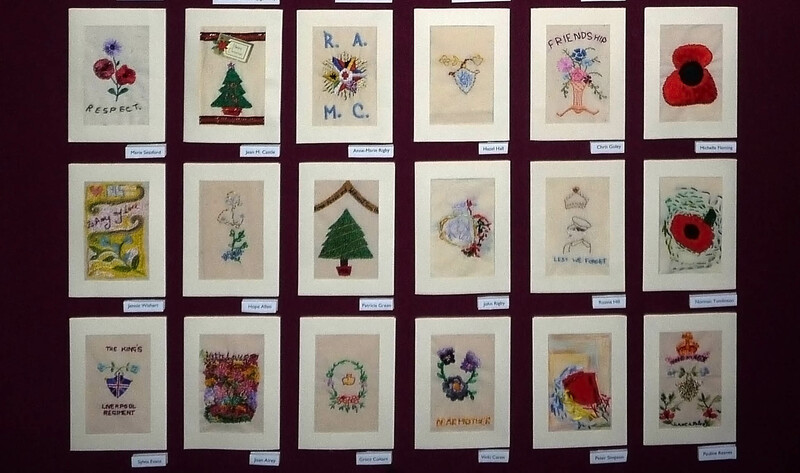 In December we do not have a meeting in Liverpool Women’s Hospital – instead we are invited to come to Merseyside Embroiderers Guild Christmas party in Ullet Road, Liverpool. 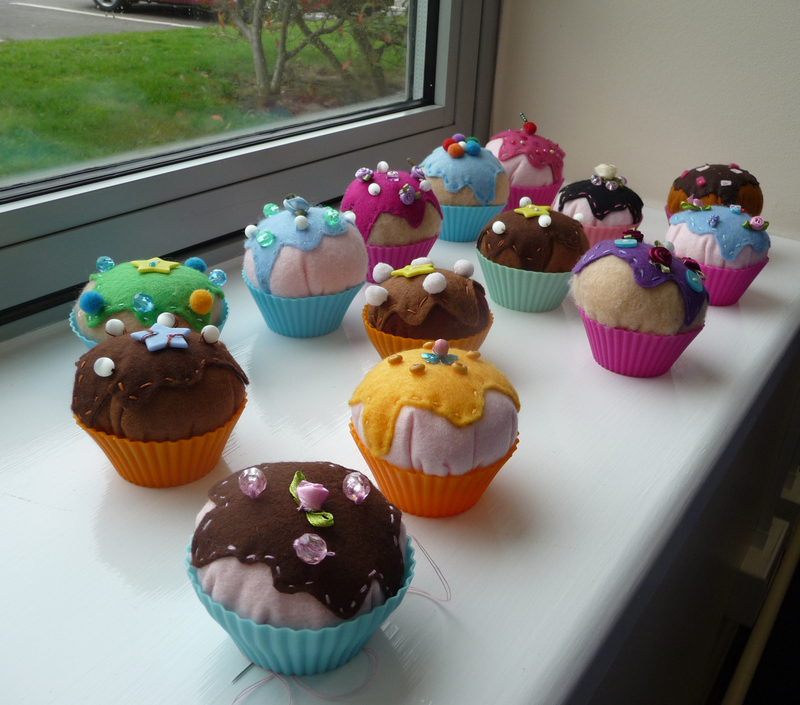 This year we had a competition which was called “Decorate Your Home From Home”. 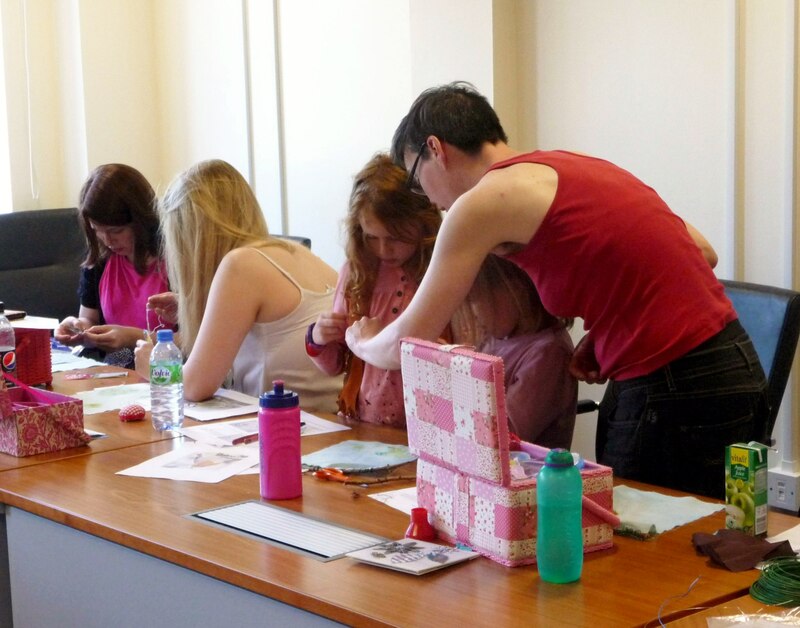 Each YE member was given a little wooden house to decorate as they wished, and everyone at the Christmas party voted for the winner, who was Emma Lewis, with her sewing themed house. 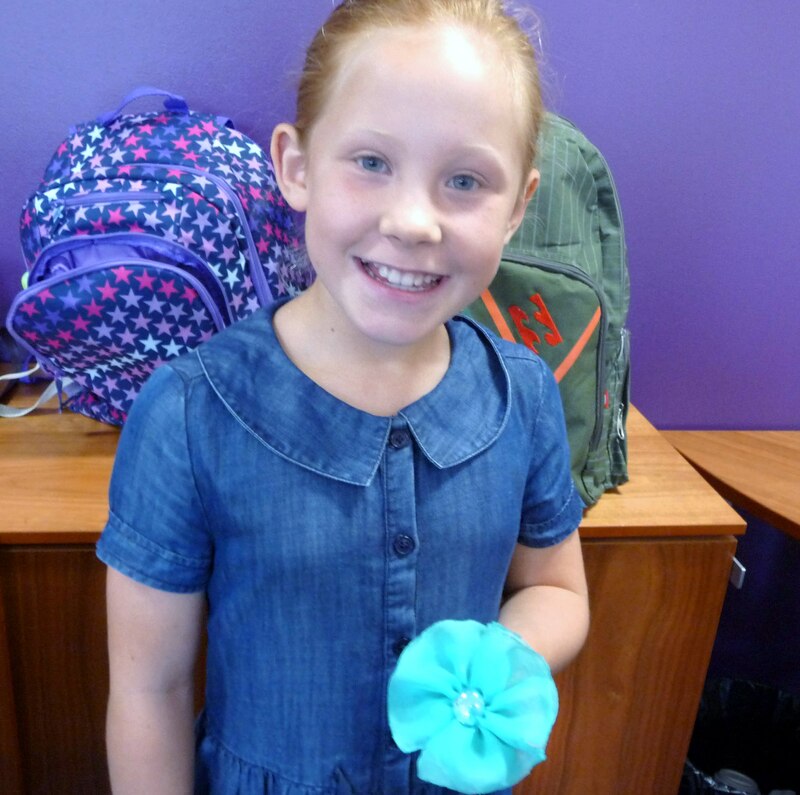 Congratulations Emma! 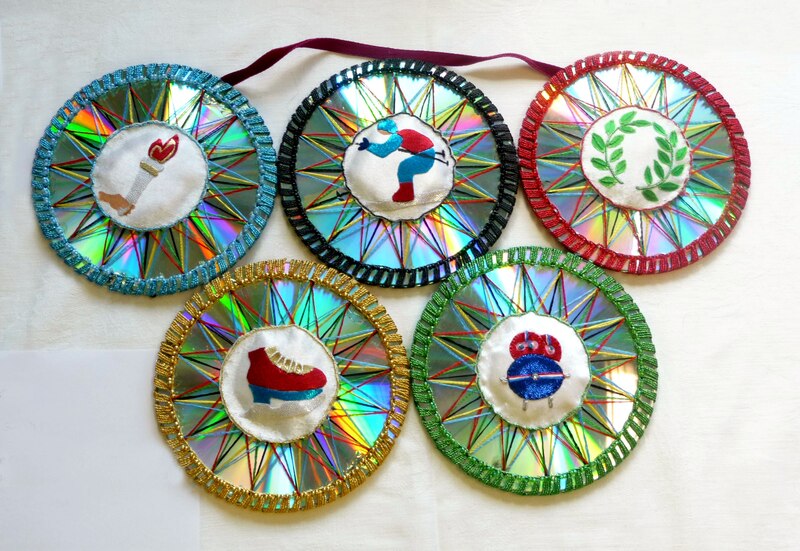 Also, at this time of the year we nominate the Merseyside Young Embroiderer of the Year and award them a Cup and the Sreepur Shield. 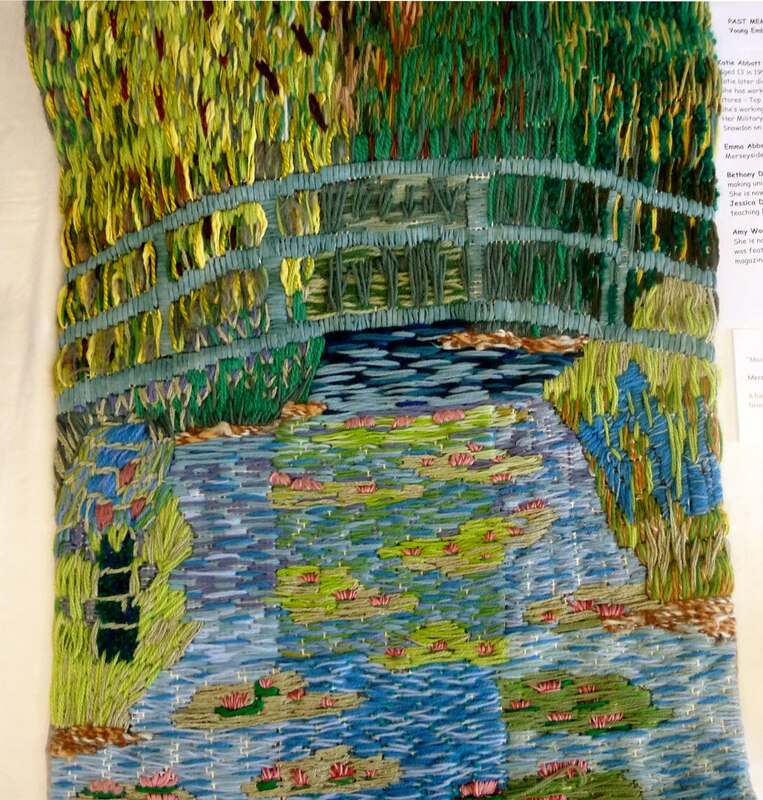 Our 2014 winner is Chloe Gray. 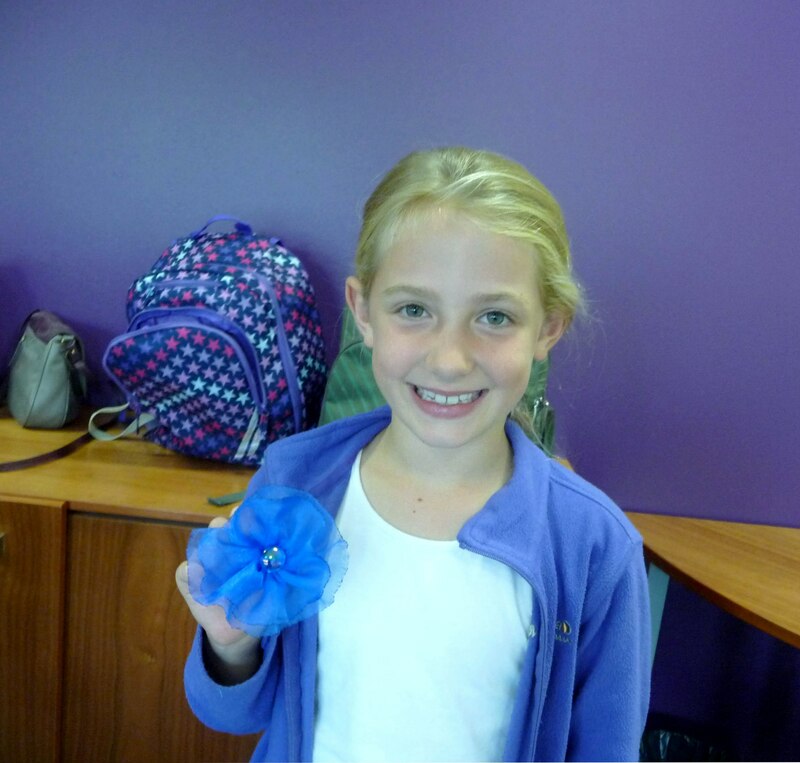 Congratulations Chloe! 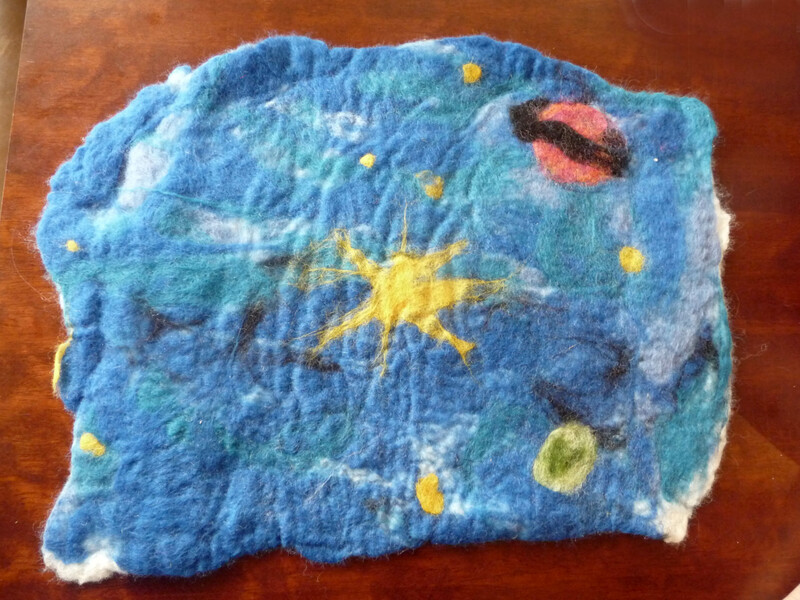 We learned how to do needlefelting today, and designed a black or white felt Christmas stocking which was needle-felted on one side and decorated with sparkle on the other side. 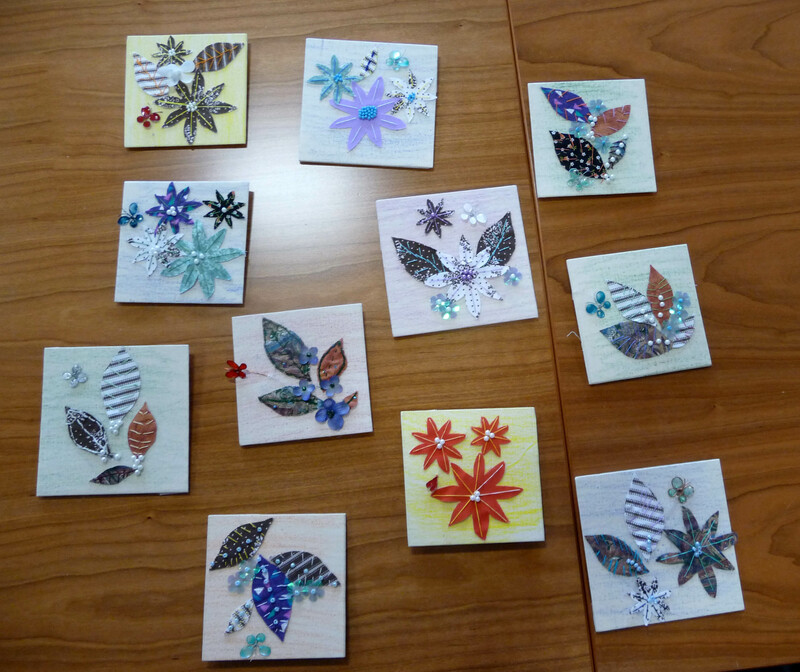 We also were each given a little wooden house to decorate at home in time for the Christmas Party. 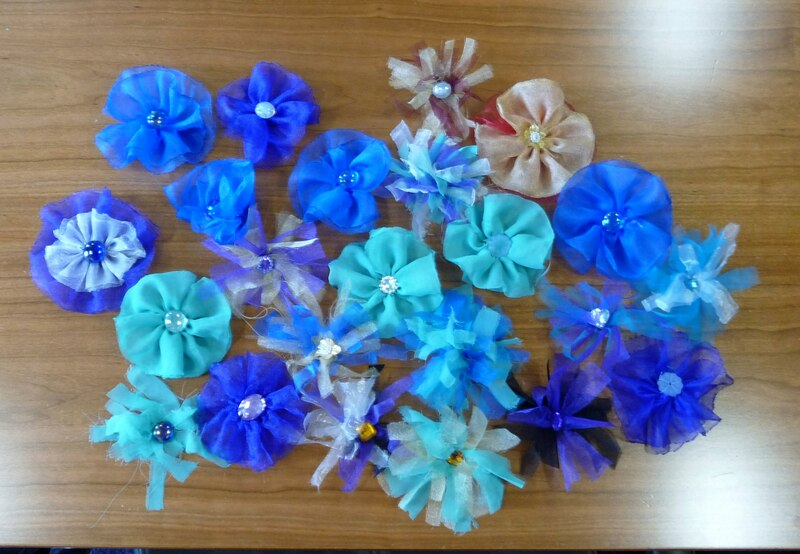 These will all be judged by the guests at the EG Christmas Party and there will be a prize for the winner. 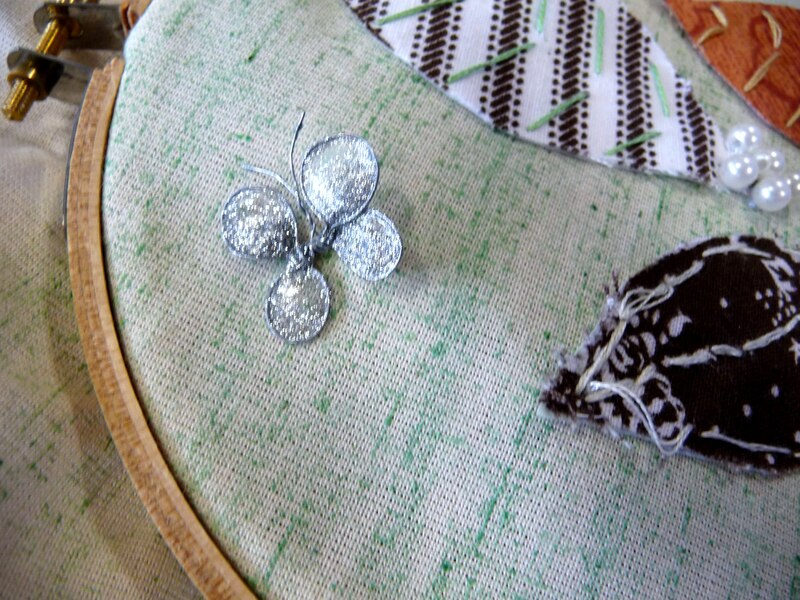 The competition is called “Decorate Your Home from Home”. 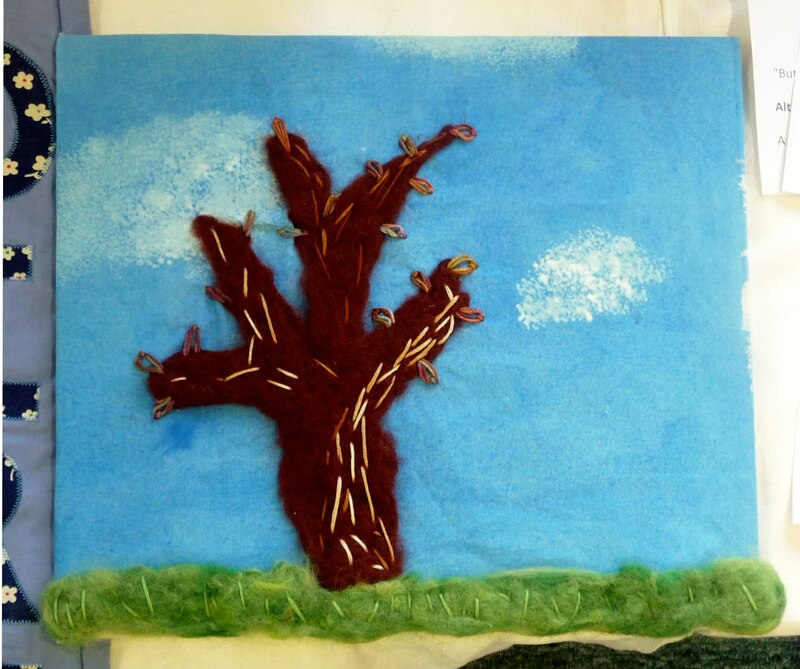 Here you can see some of our needle-felting photographs. 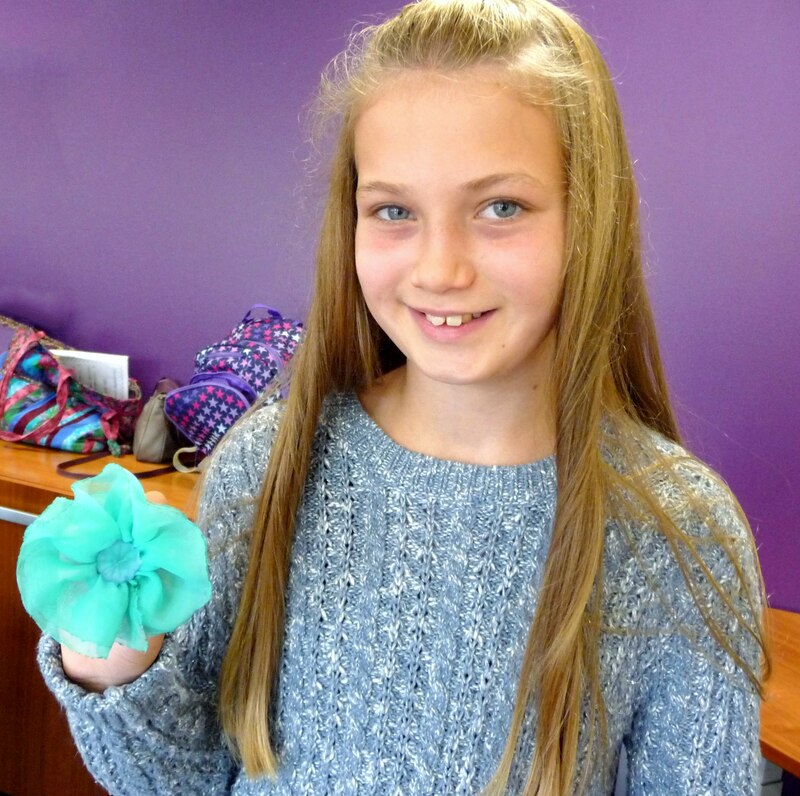 Today is International Day of the Girl, and Liverpool Women’s Hospital where we meet, is welcoming girls to lots of events in the hospital. 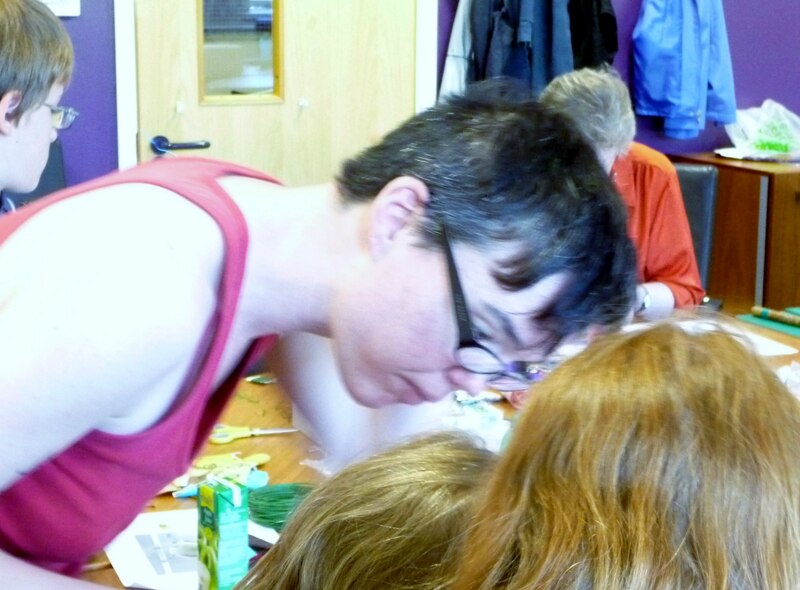 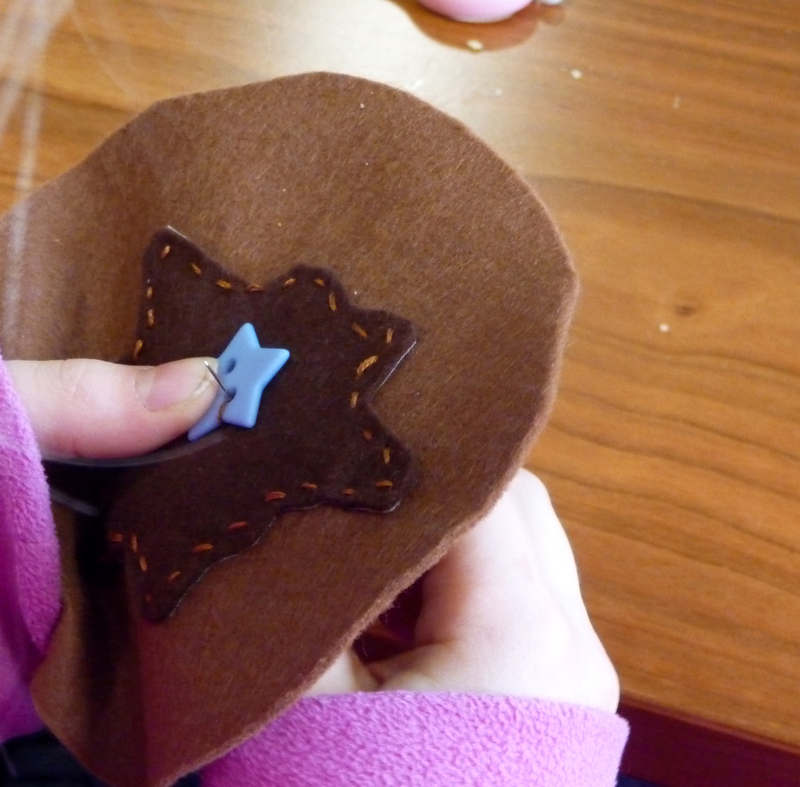 Our group were visited by Rainbow guides and Brownies who were interested to see what we were making. 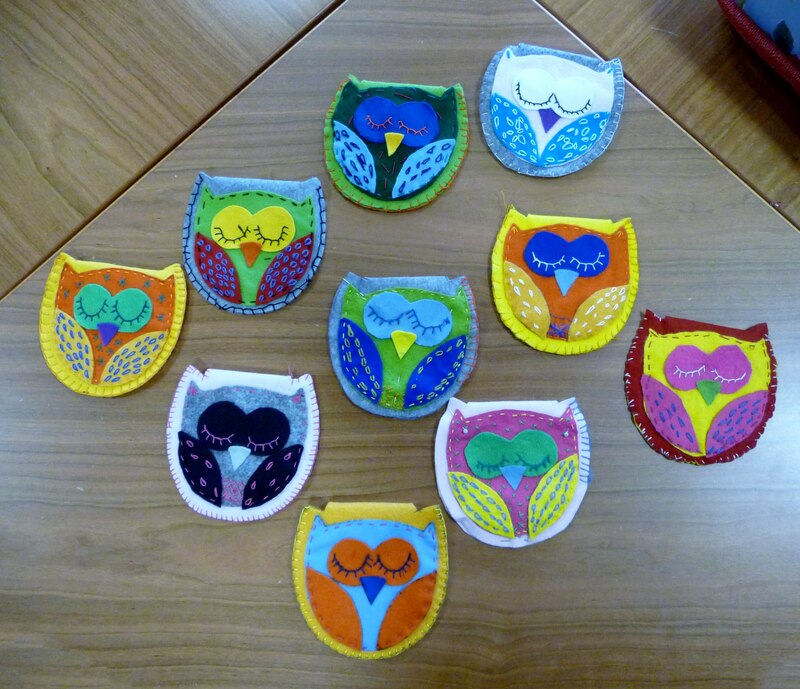 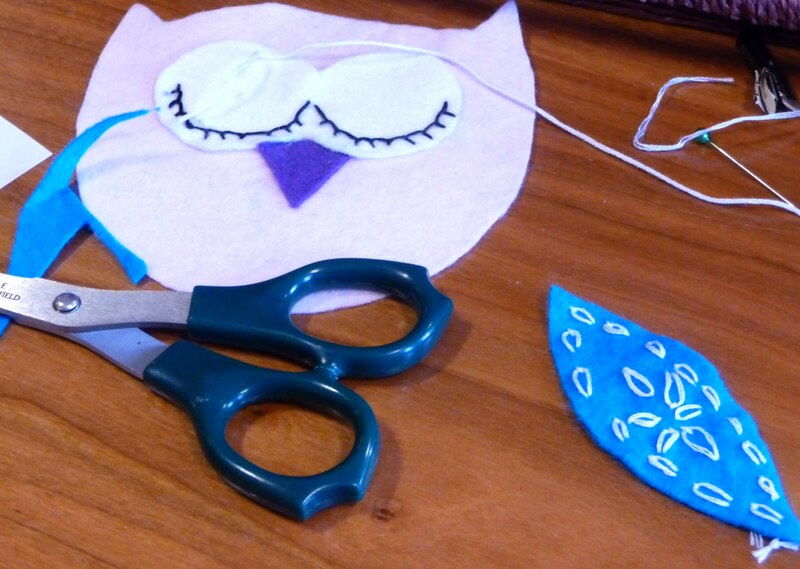 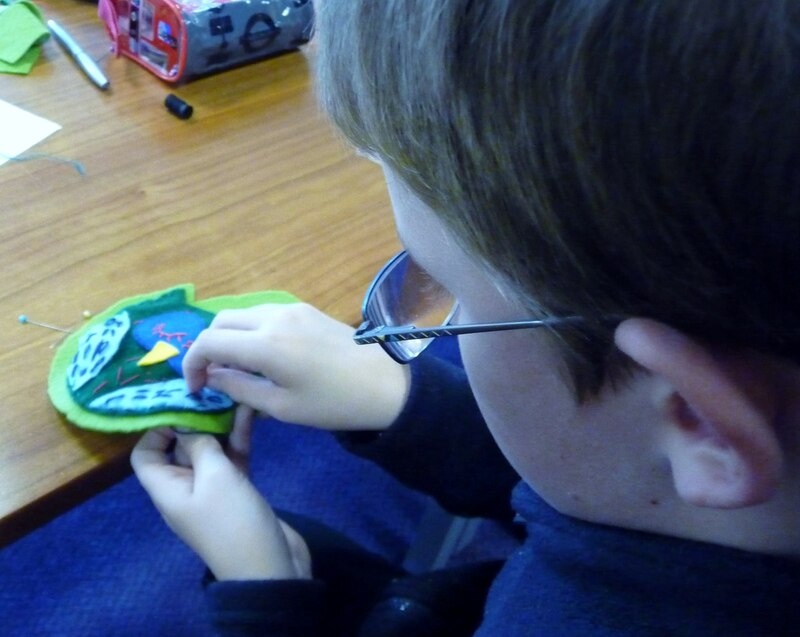 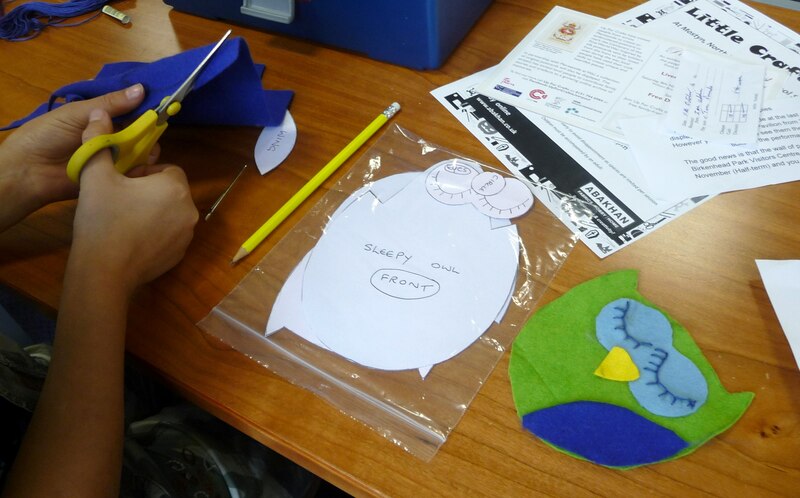 Today we made Sleepy Owl purses from felt, with embroidered feathers. 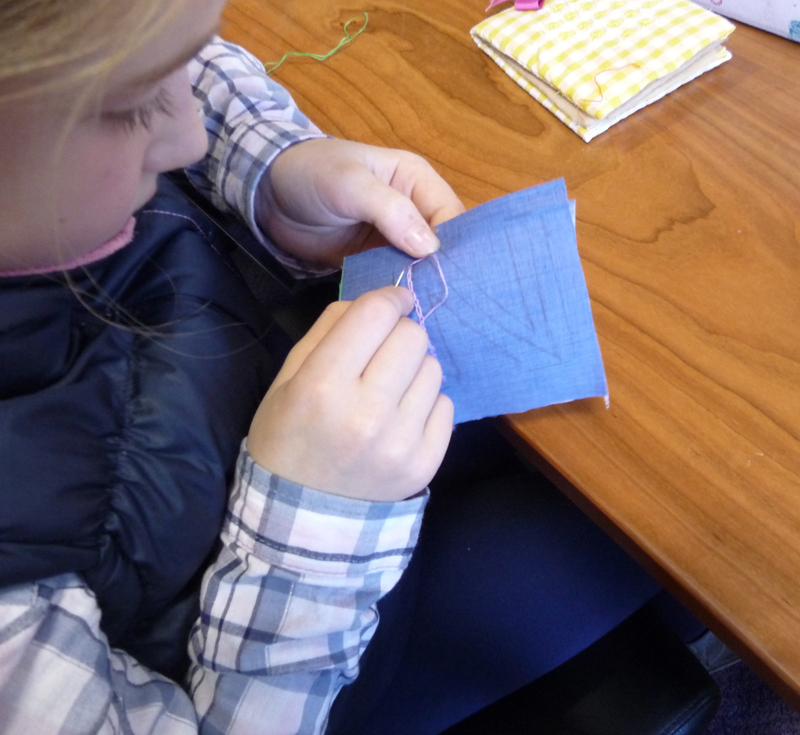 We used pattern pieces to draw round and followed step-by-step instructions, that we will take home and use again to make more purses. Have a look below at some photographs of our work. 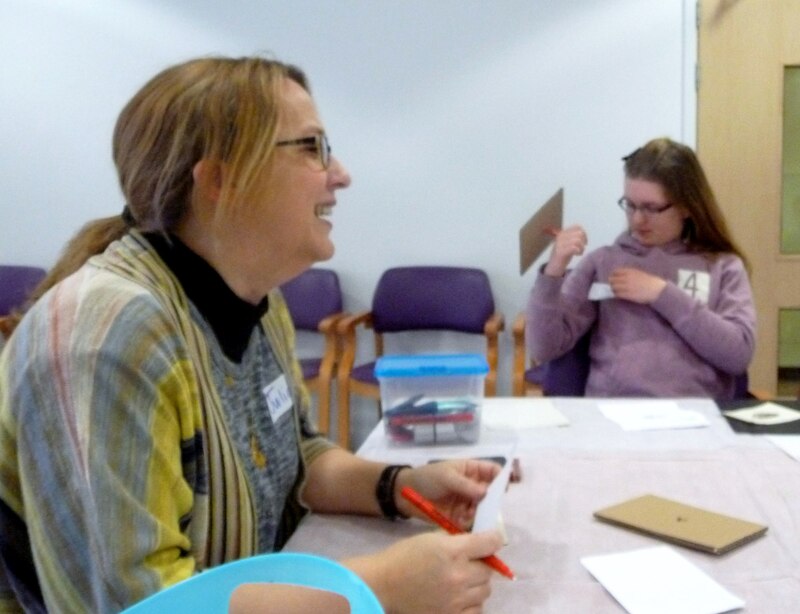 This is our first meeting back after the summer break, and we welcomed our young people back- including Grace who has returned after a gap of two years, It was lovely to see her. 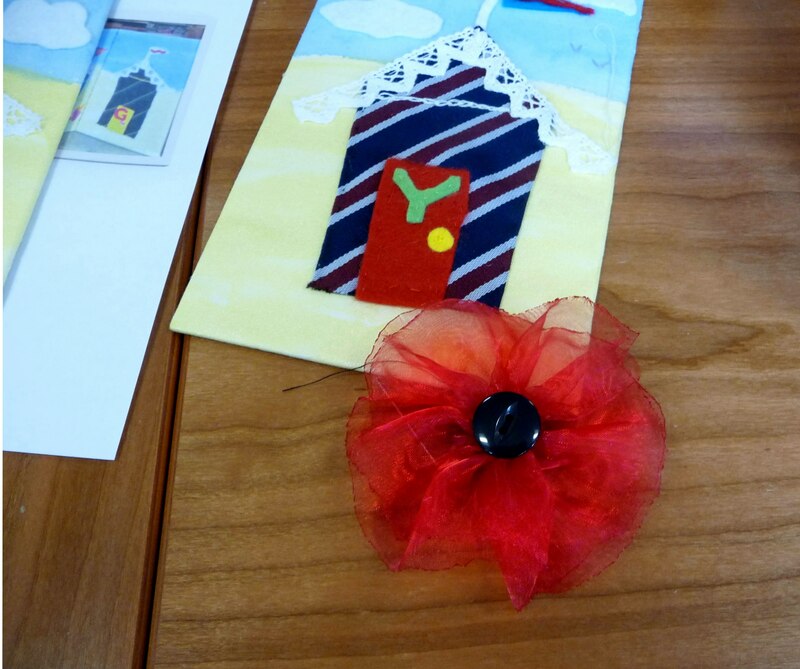 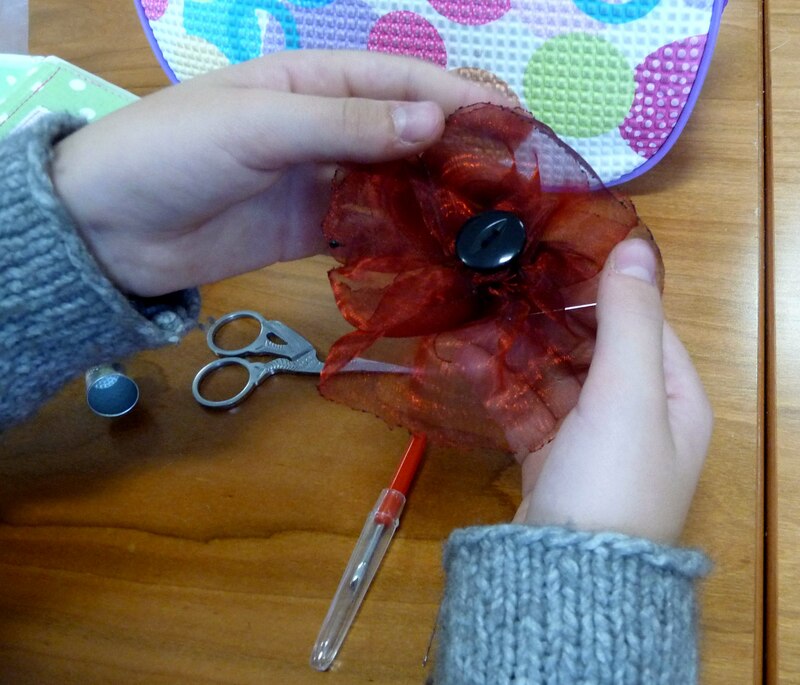 We were asked by “Hand in Hand” Theatre Group to make poppies to help decorate a wall of the Floral Pavillion, New Brighton for their Festival of War, Peace and Remembrance to be held on Saturday 22nd October 2014. 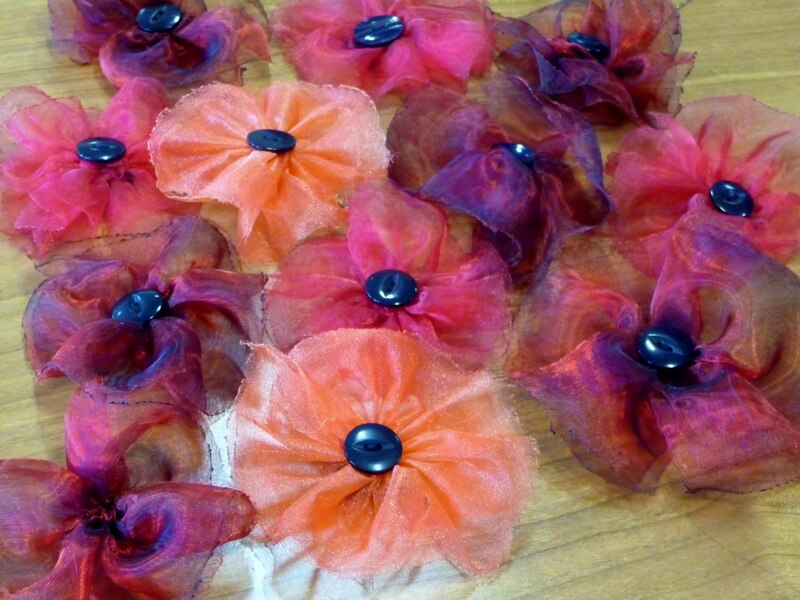 We made these from gathered chiffon with a button centre, and they make a lovely display as you will see from the photograph below…..
Our Group then used colors of their choice to make more chiffon poppies, and also chiffon flowers using a rag rugging technique to make flowers to take home. 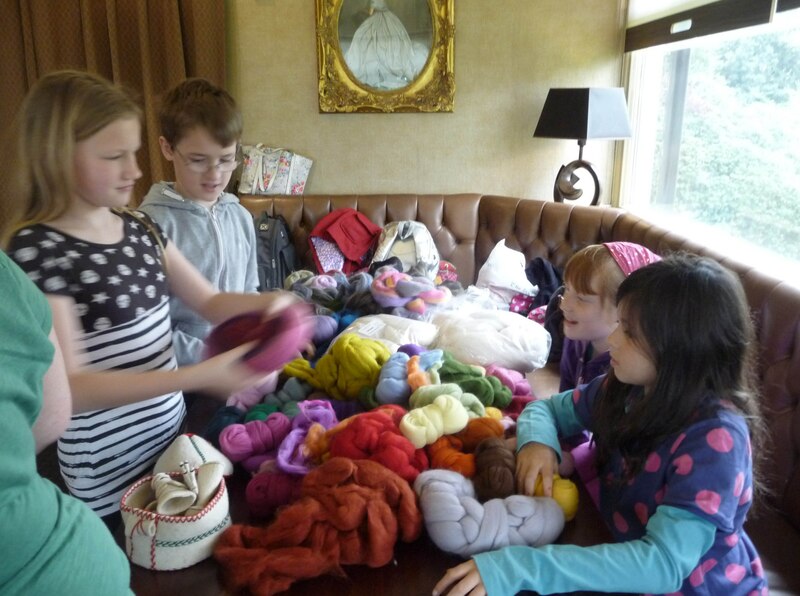 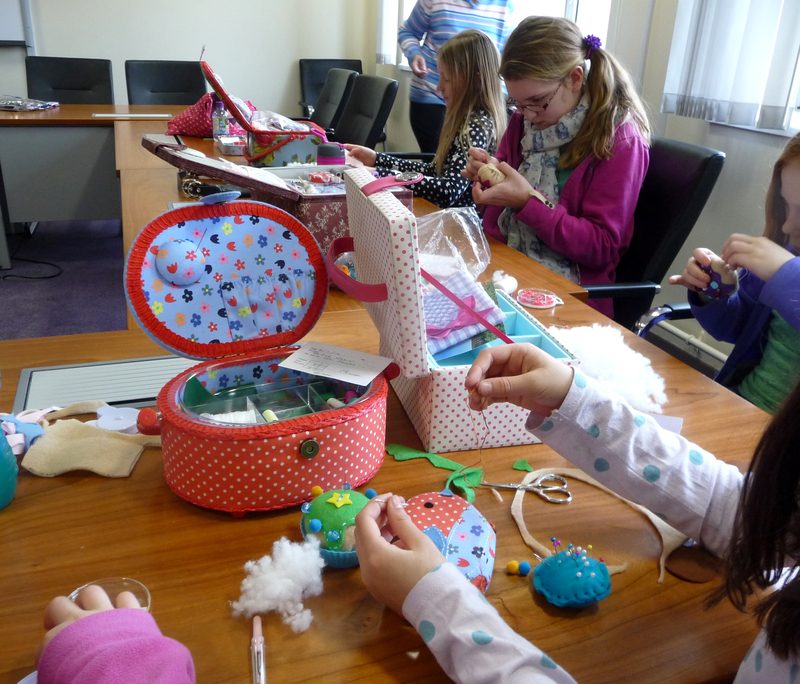 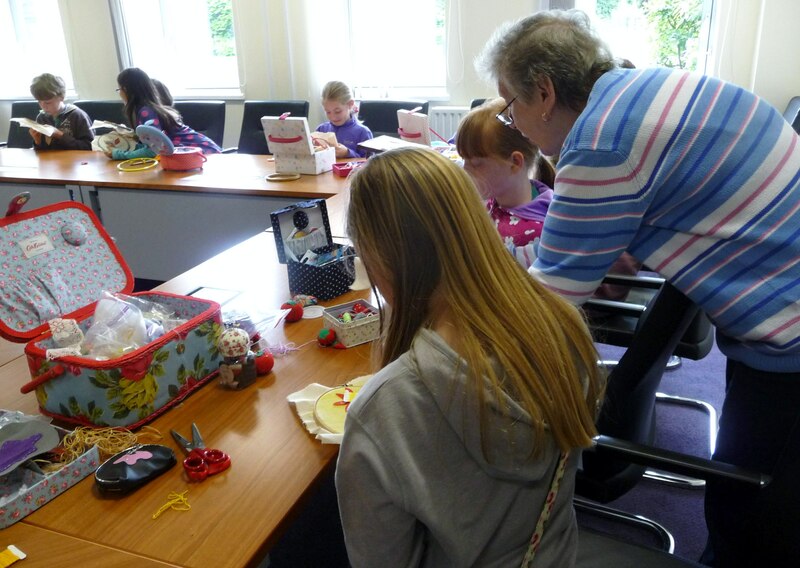 There is no meeting of Young Embroiderers in August. 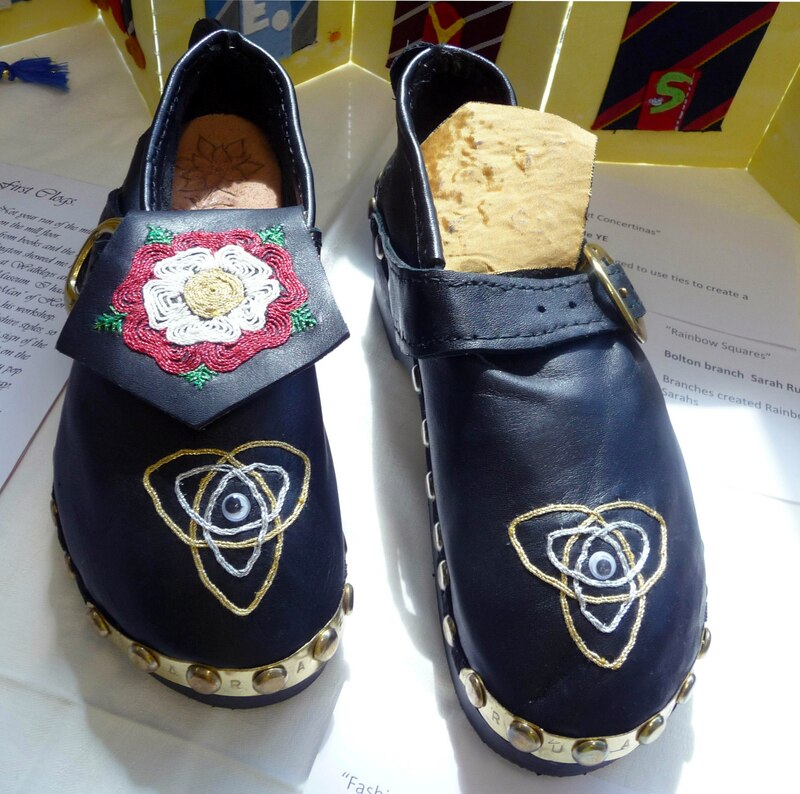 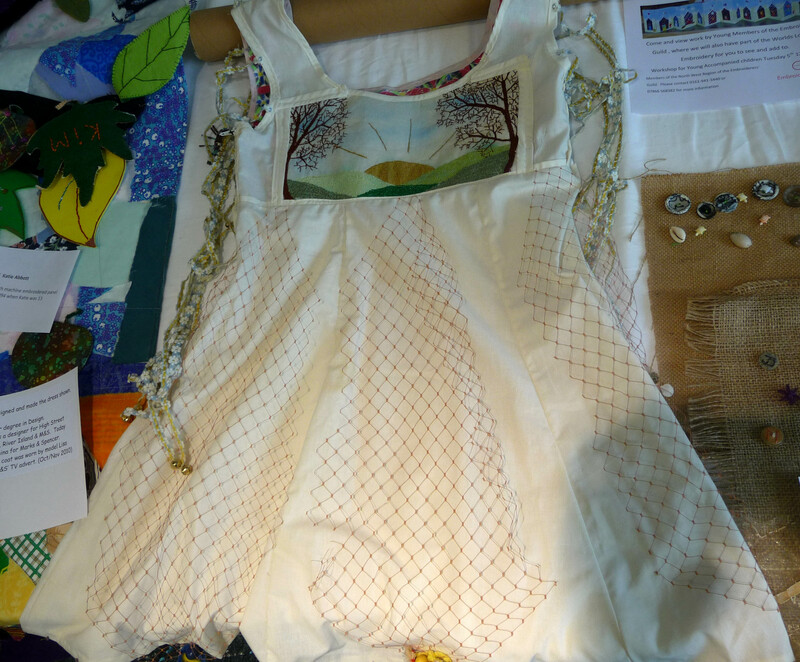 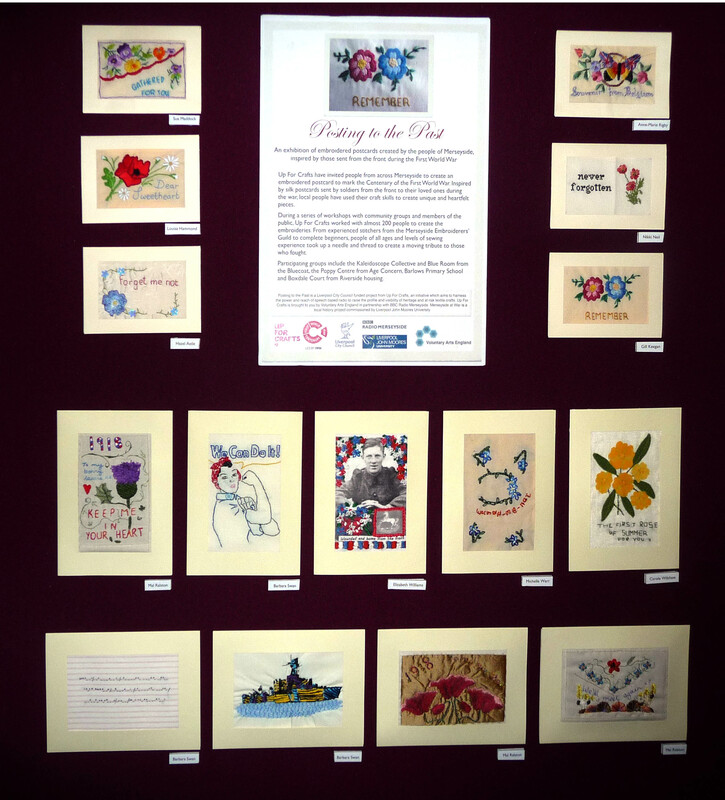 Val and Hilary went to see the Young Embroiderers work from all over North West England at the YE 40th Anniversary exhibition in Urmston Library, and here are a few photographs so you can see what embroidery young people in other areas have produced. 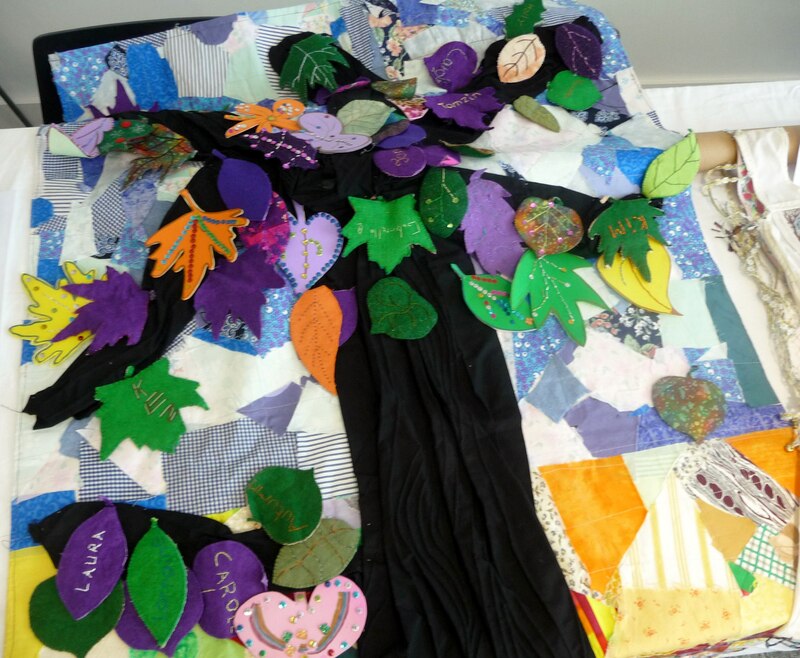 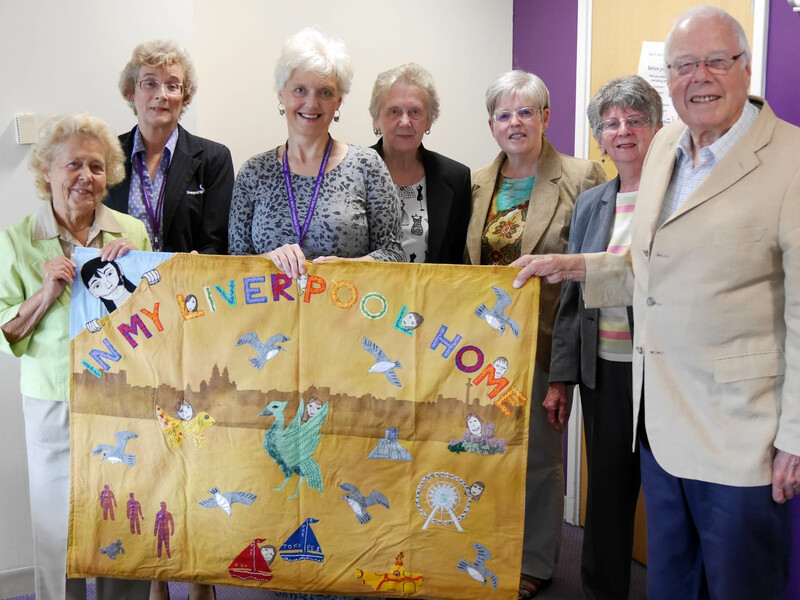 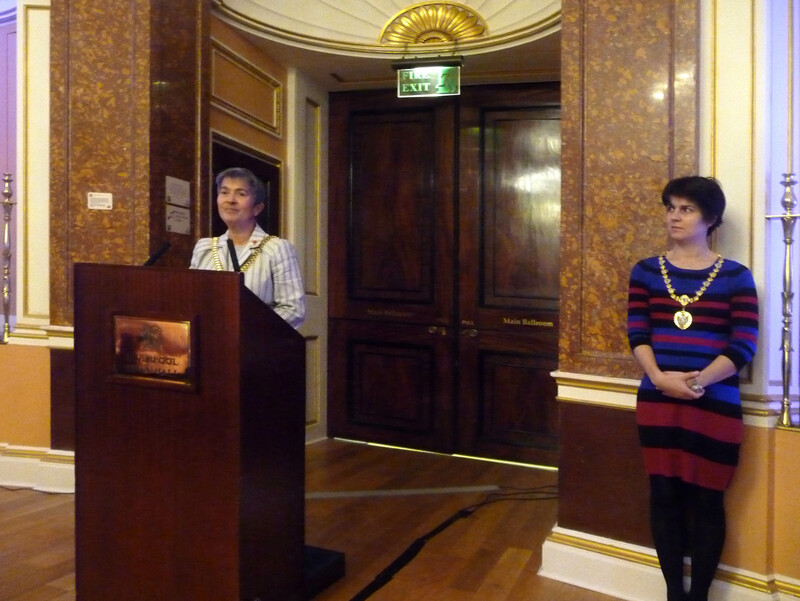 On 22nd August the hanging “In My Liverpool Home”, which was commissioned by Liverpool Decorative Fine Arts Society, and which we embroidered early on this year, was presented to Liverpool Women’s Hospital. 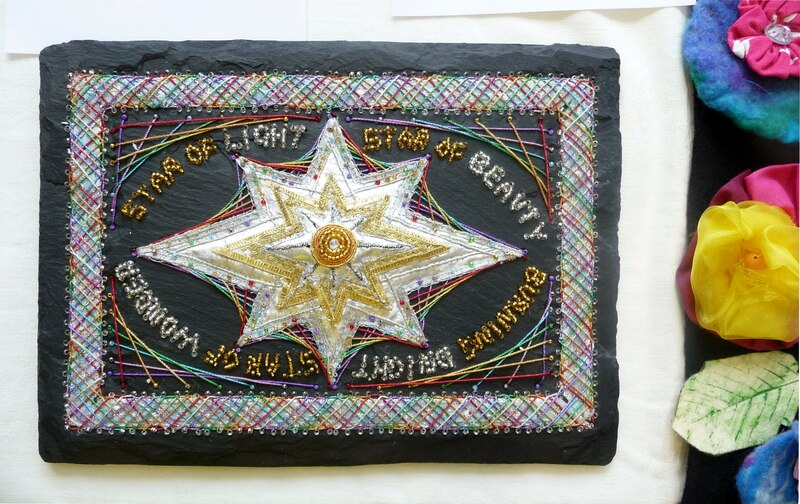 It will be situated in the main ground floor corridor opposite “Happy Planets”, another embroidered hanging made by Merseyside YE. 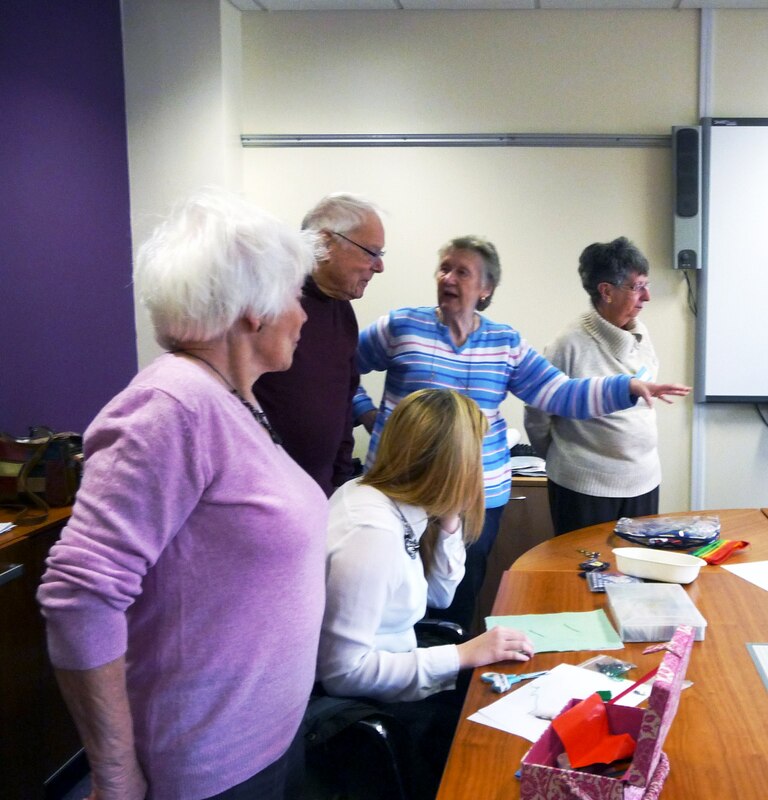 I hope you will go to see them both when you come in for our next YE meeting, but in the meantime here is a photo of the presentation. 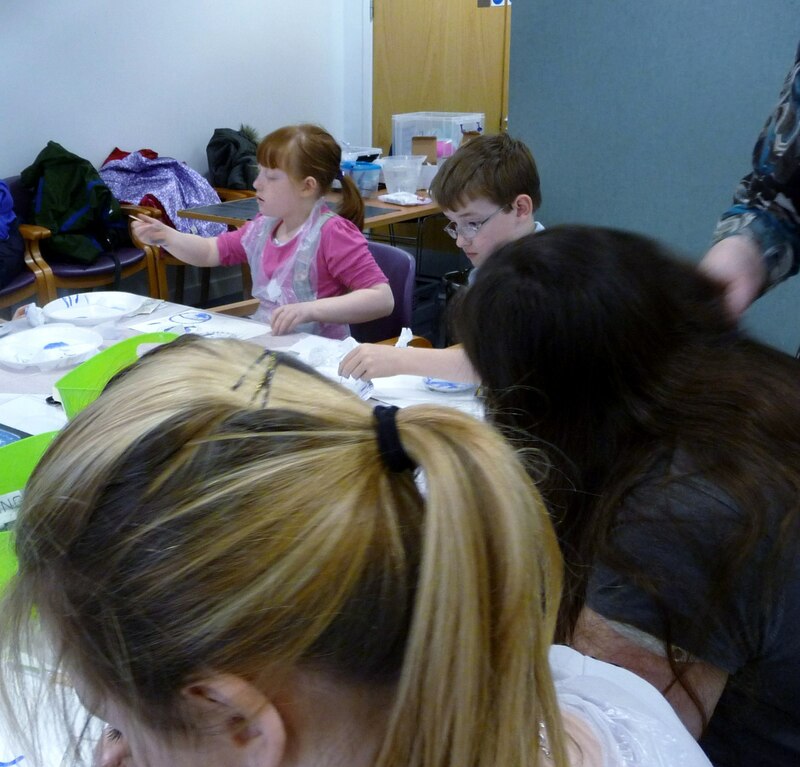 This is our last session before our Summer Break, and it was a very busy day. 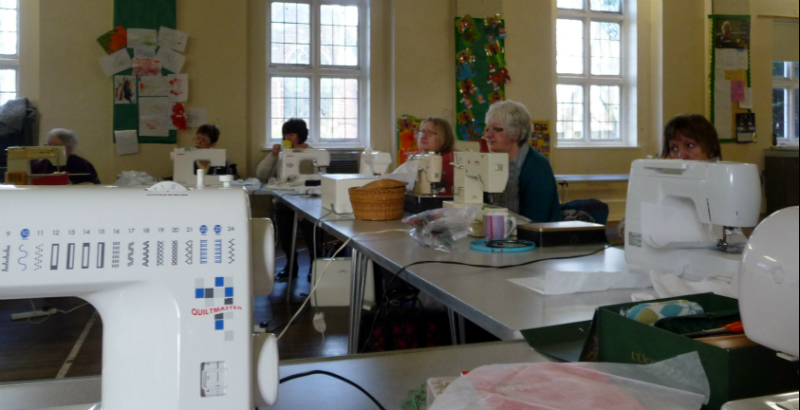 We had a full class, and also welcomed two new members – Zoe and Hannah. 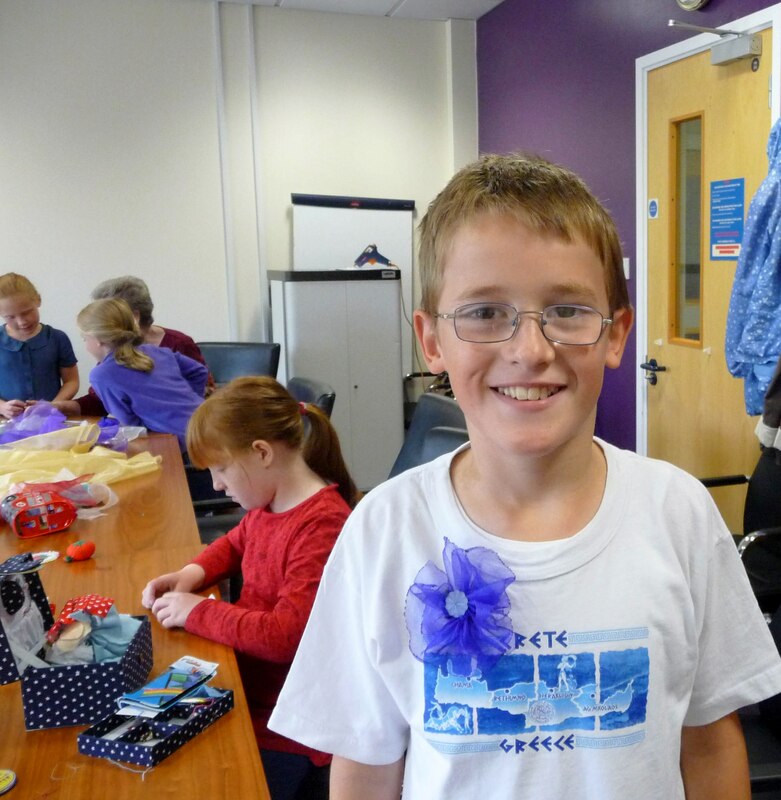 We hope they both enjoyed the day and will return again in September. 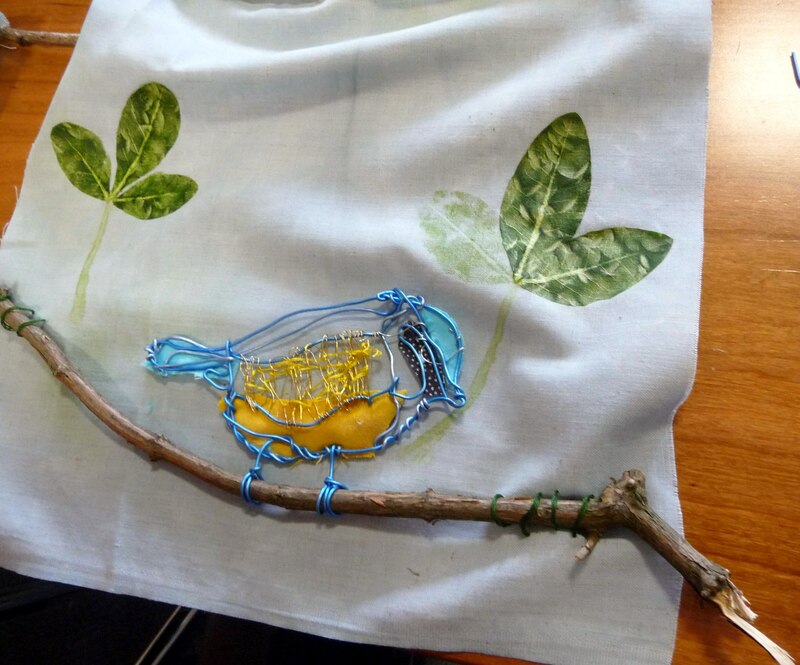 We also had a guest Tutor today, who was artist Clare McCormack, and we made 3D wire birds on a background printed by leaf pounding. 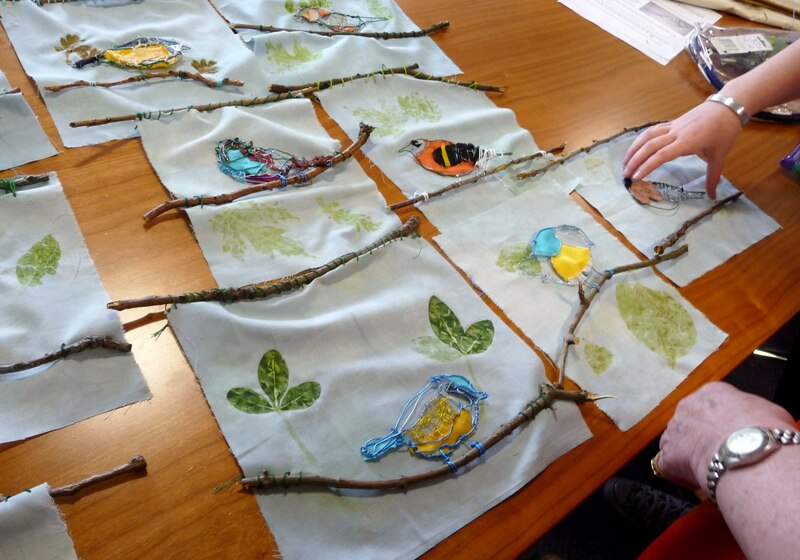 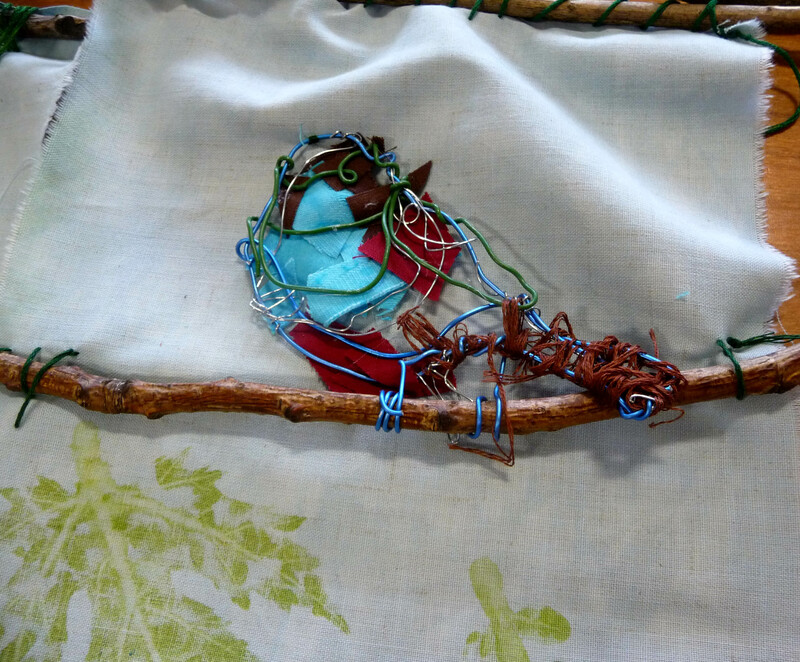 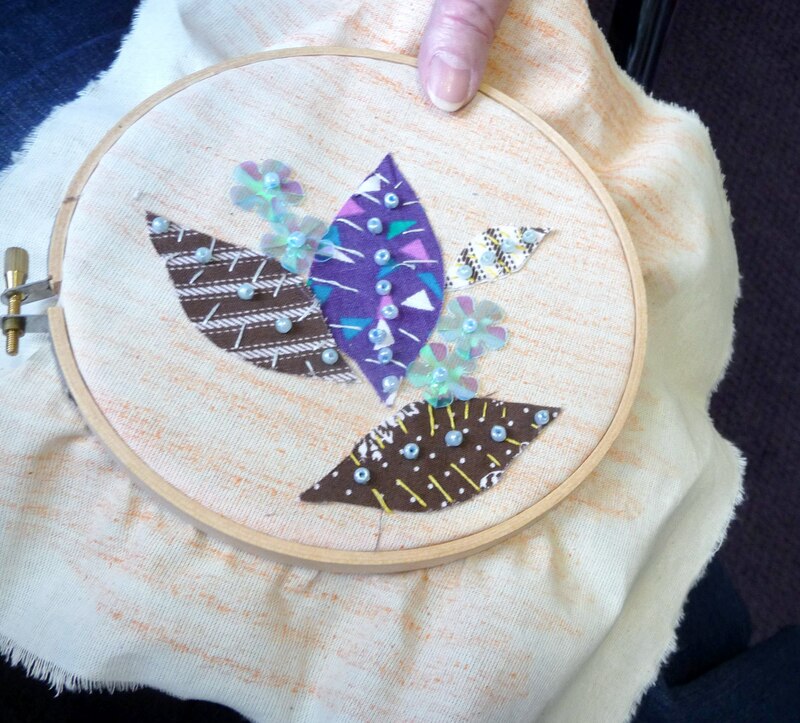 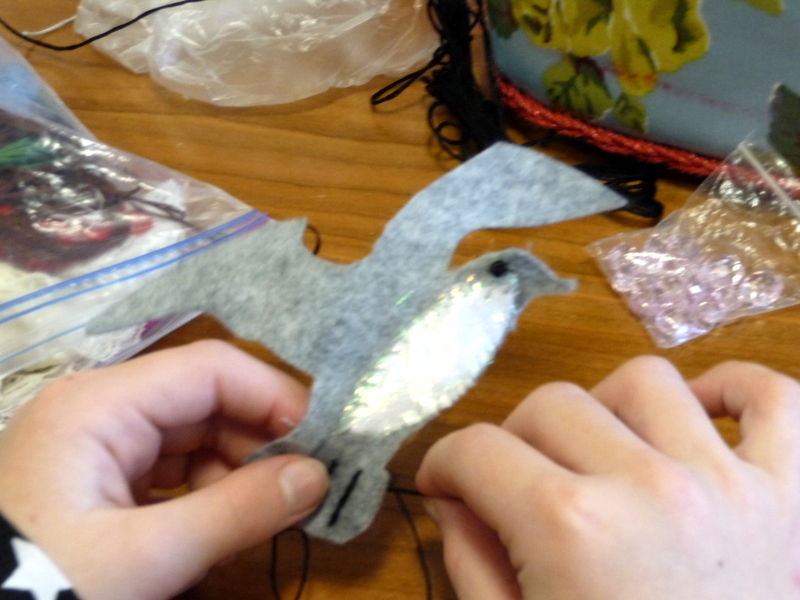 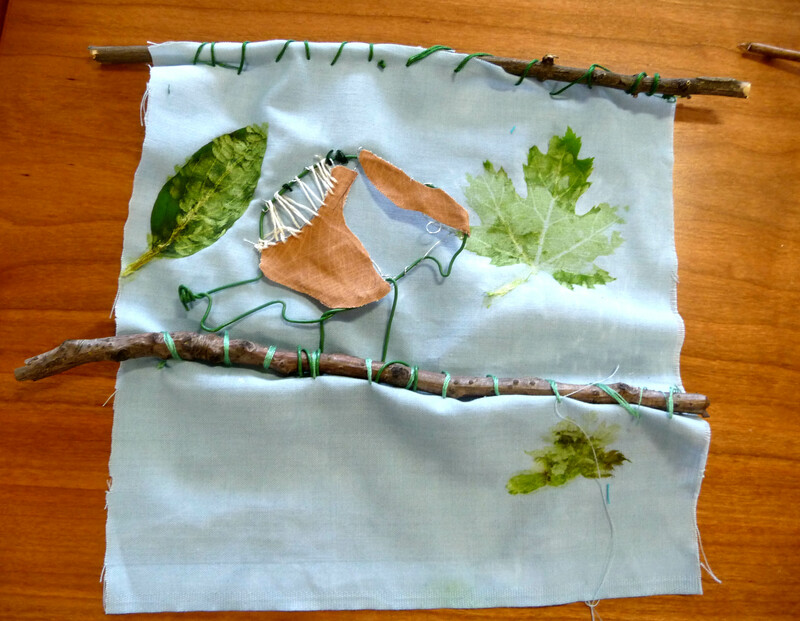 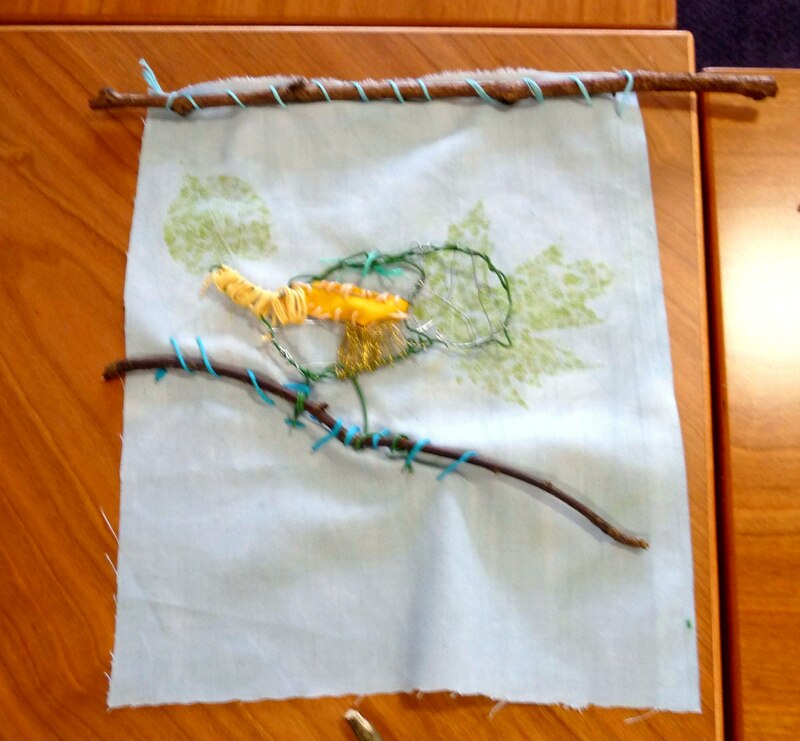 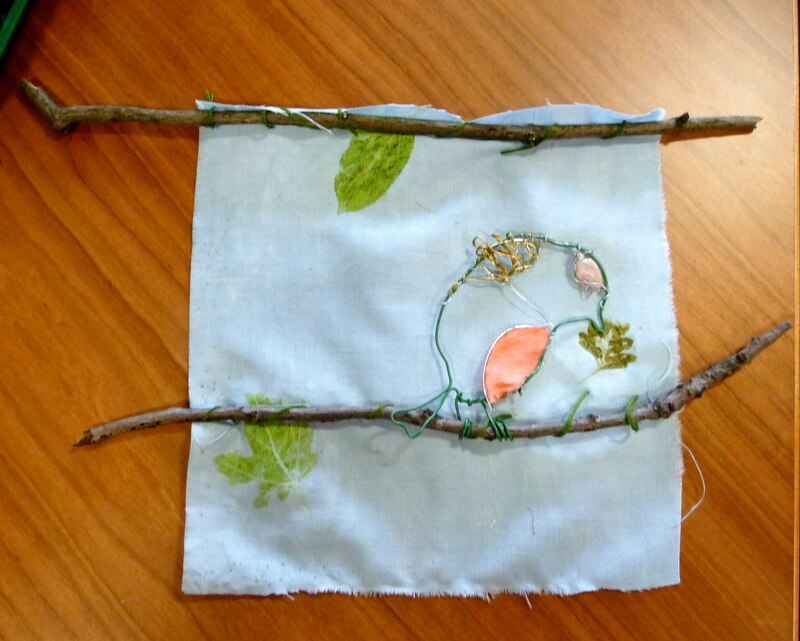 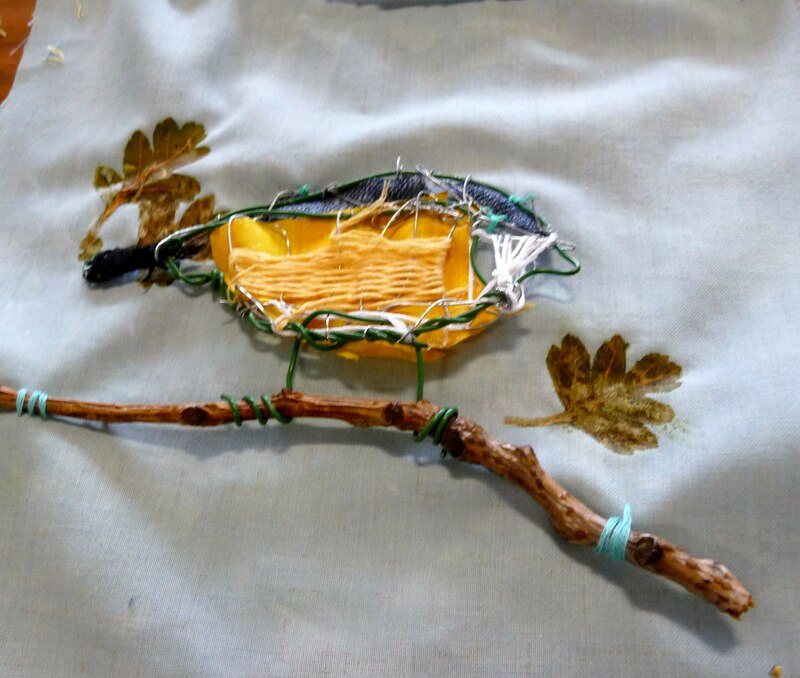 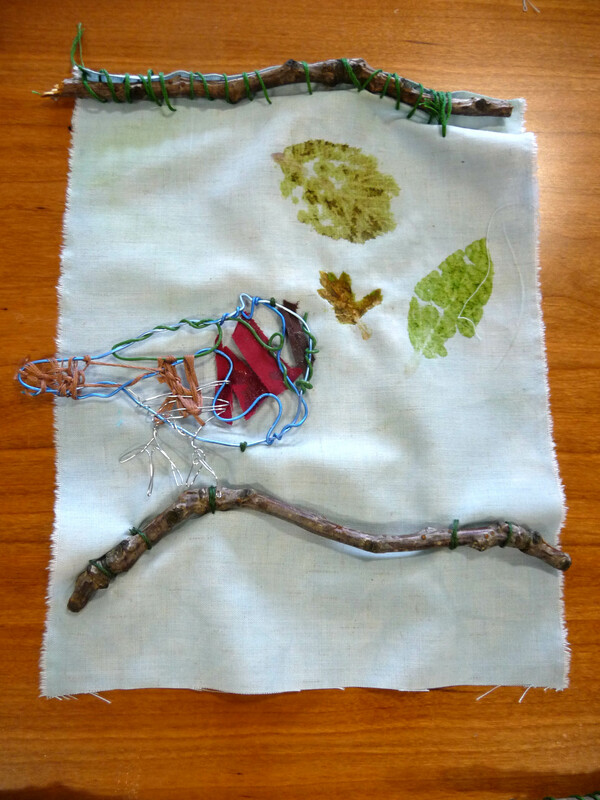 The birds had fabric inserts and weaving as well to keep our group busy. 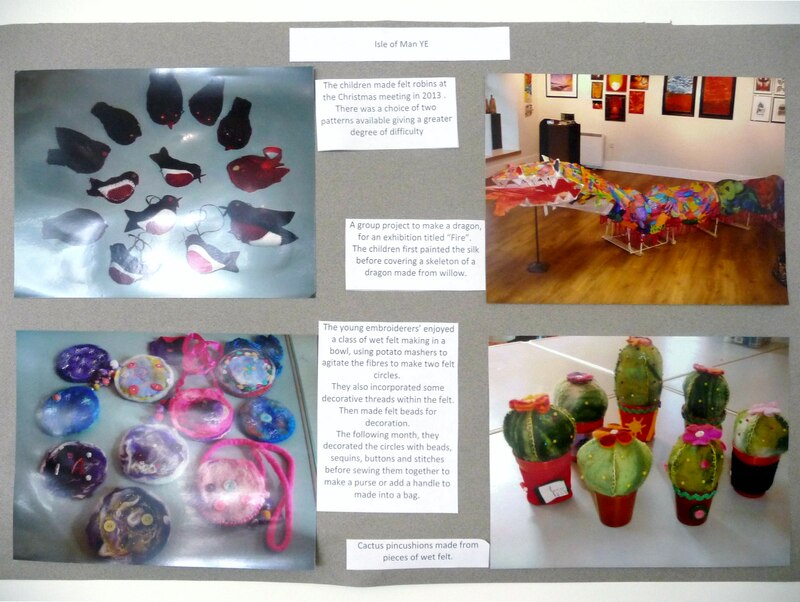 There were some fantastic results as you will see on the photos below. 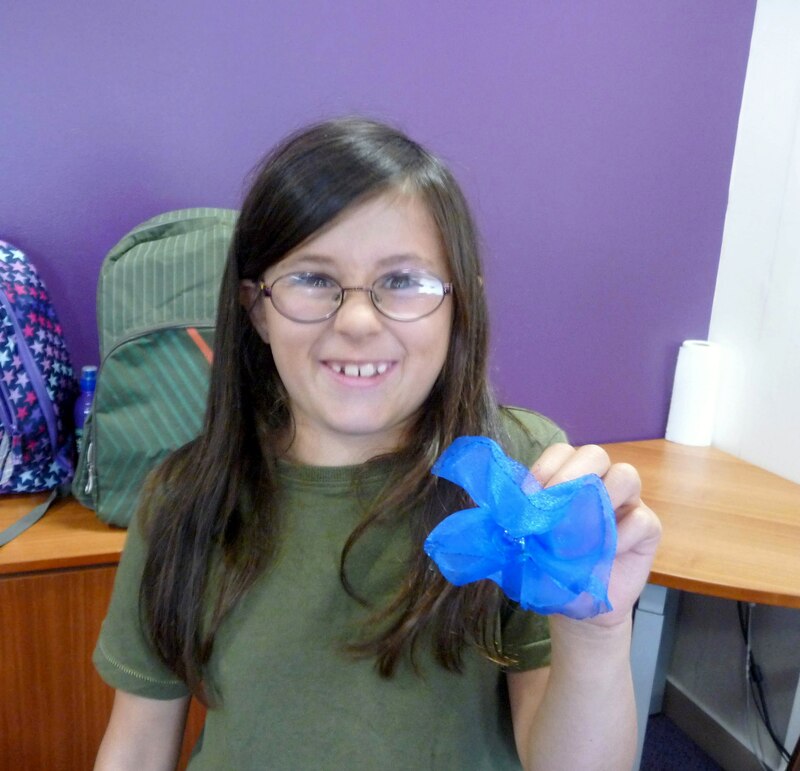 We welcomed three new members today, Ruby, Zac, and Annaliese. 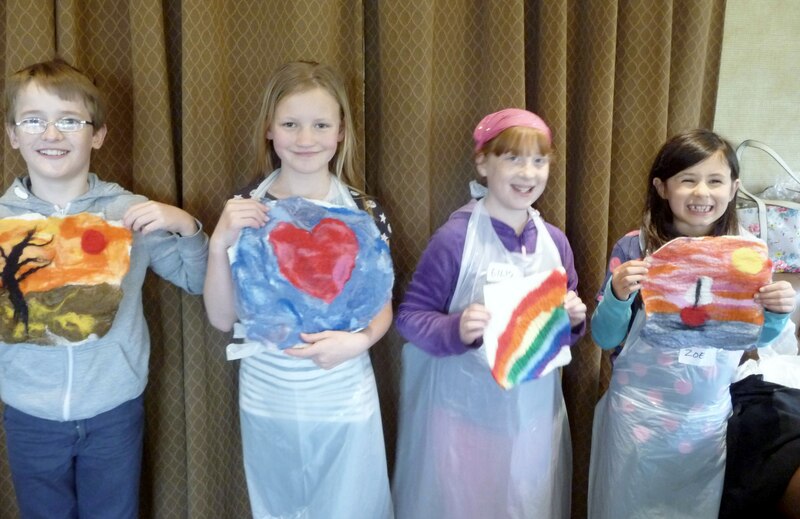 We hope they enjoyed the day and will return next month for more fun. 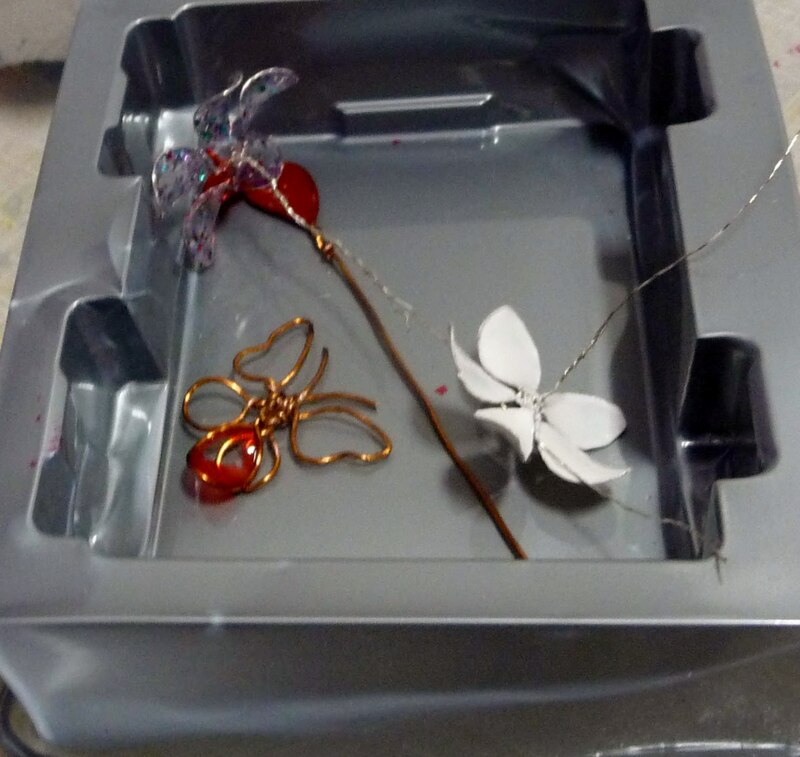 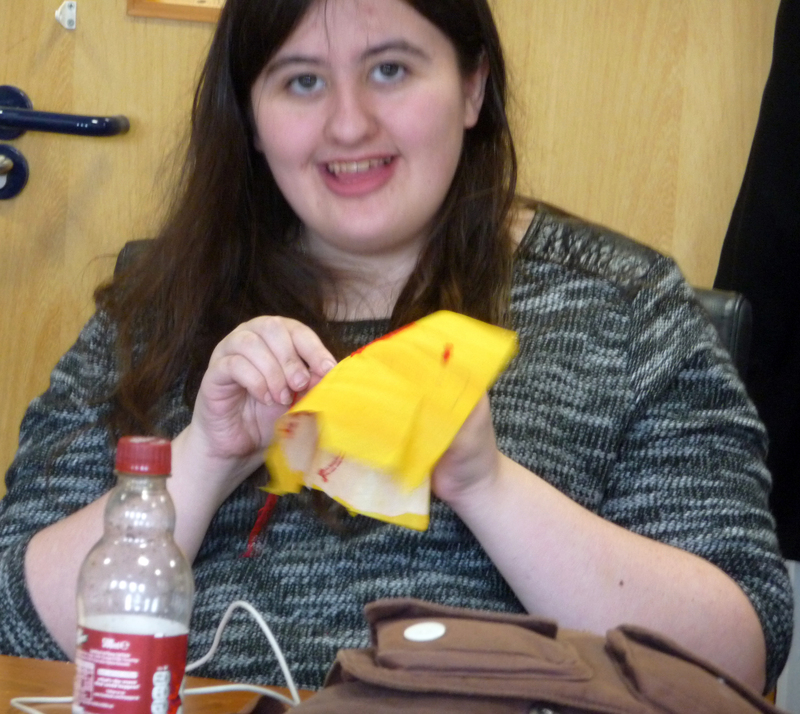 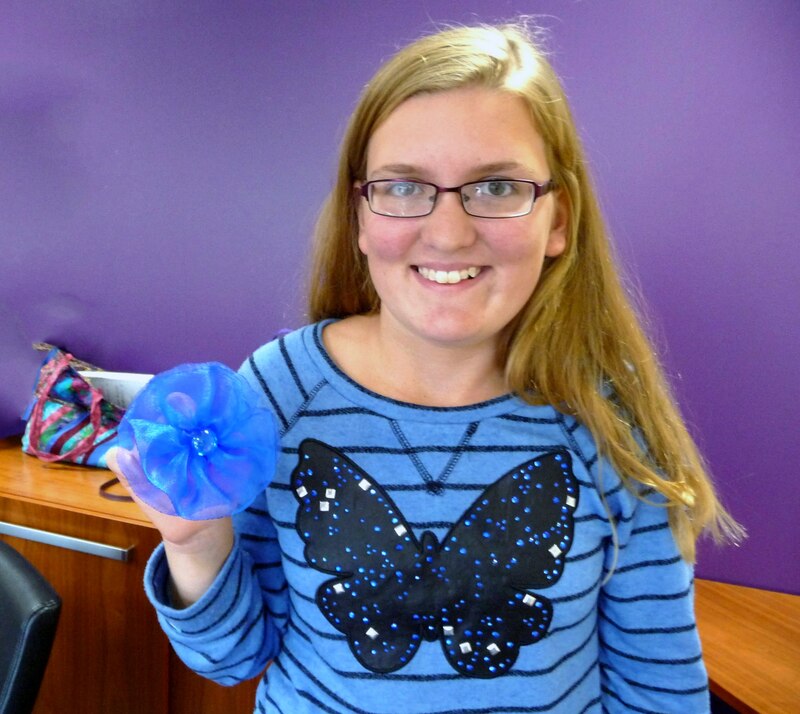 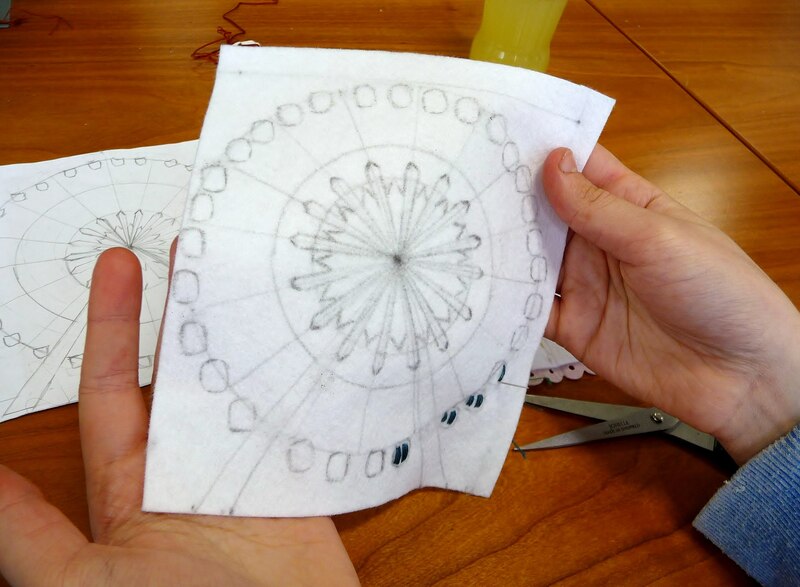 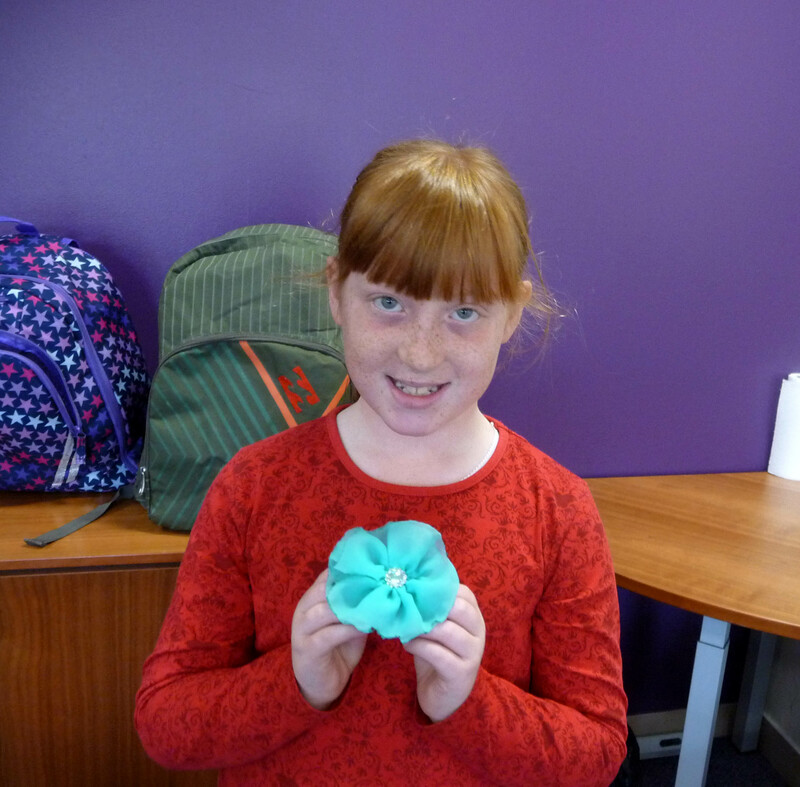 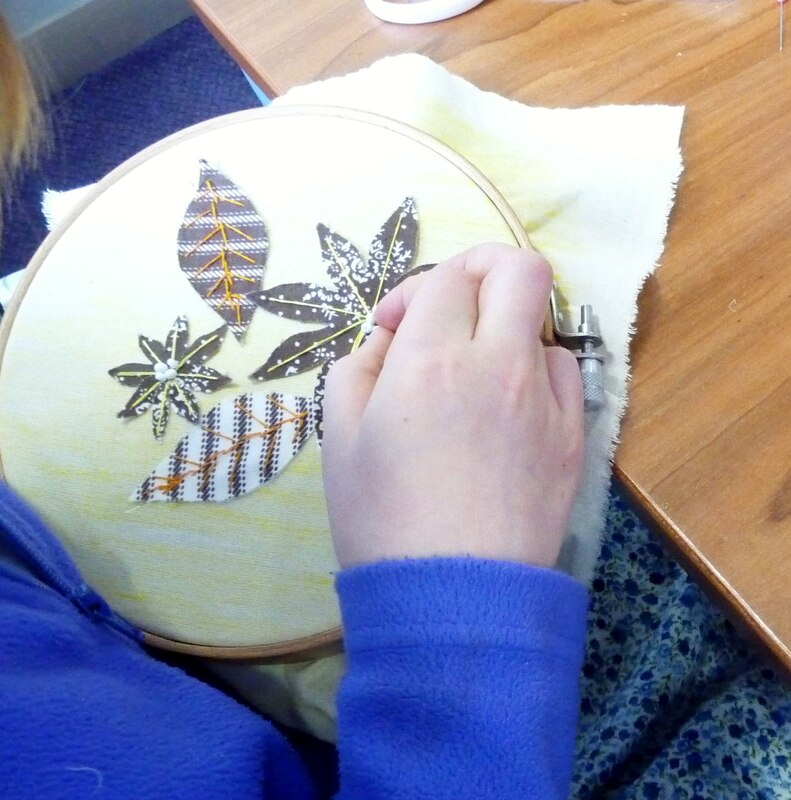 Today Sophie, a senior member of YE, took the lead in helping the group to make very attractive flowers and butterflies with wire and nail varnish to add to the appliqued flower pictures they embroidered. 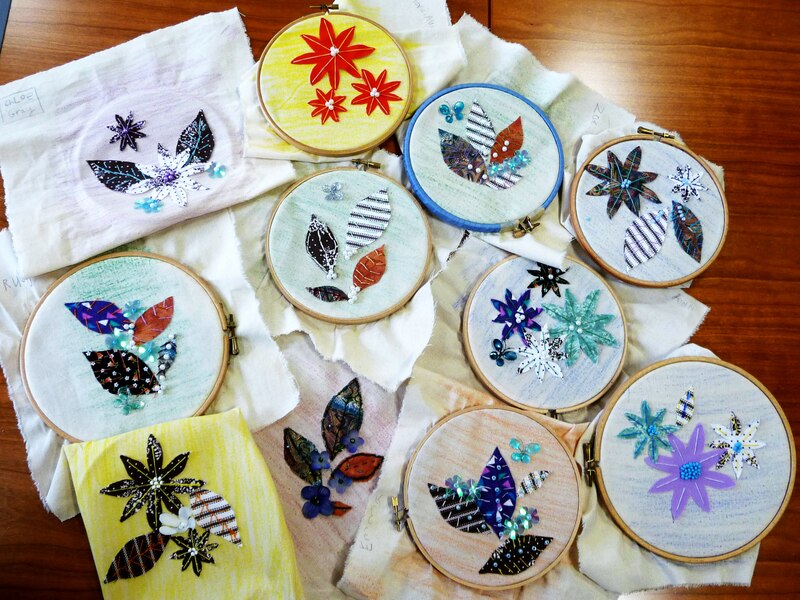 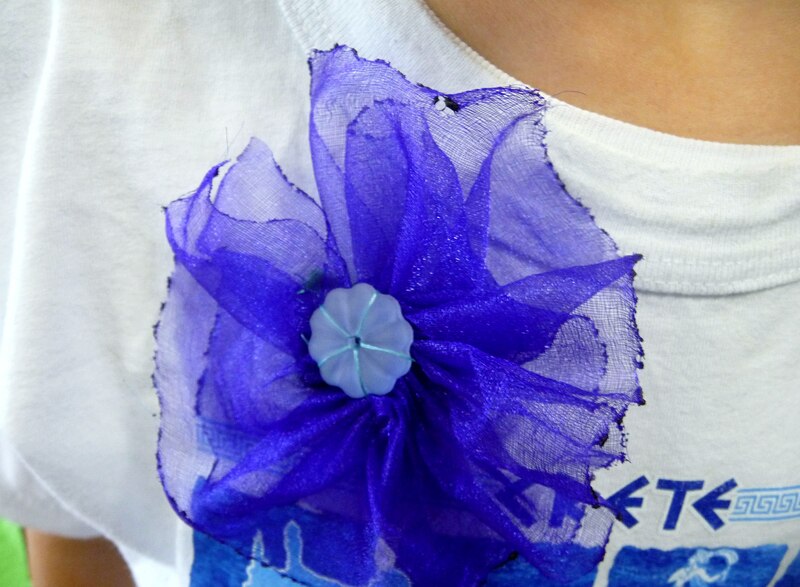 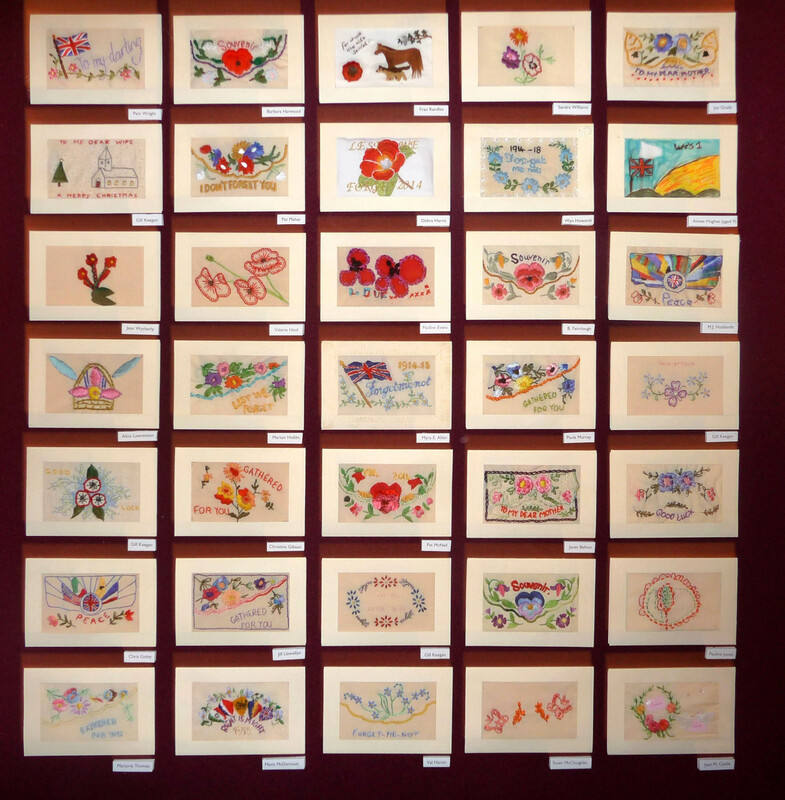 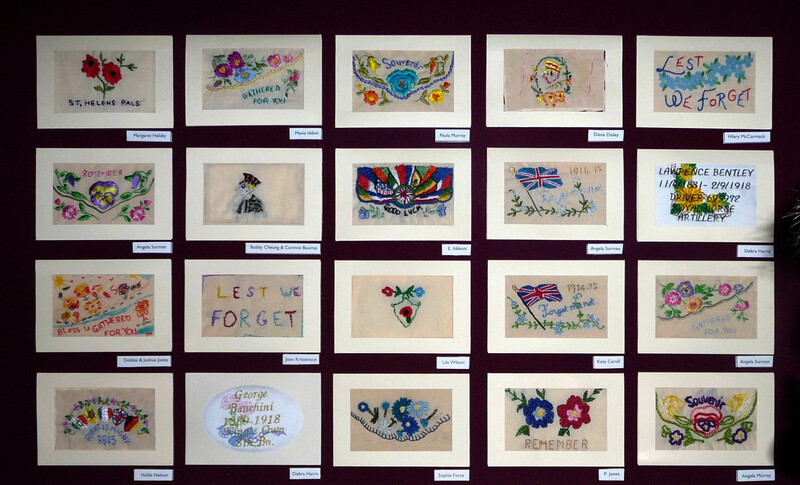 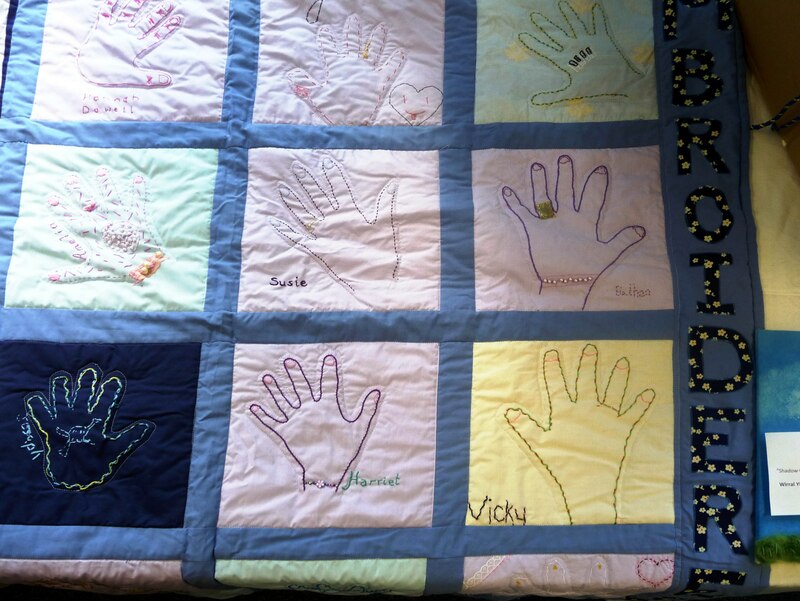 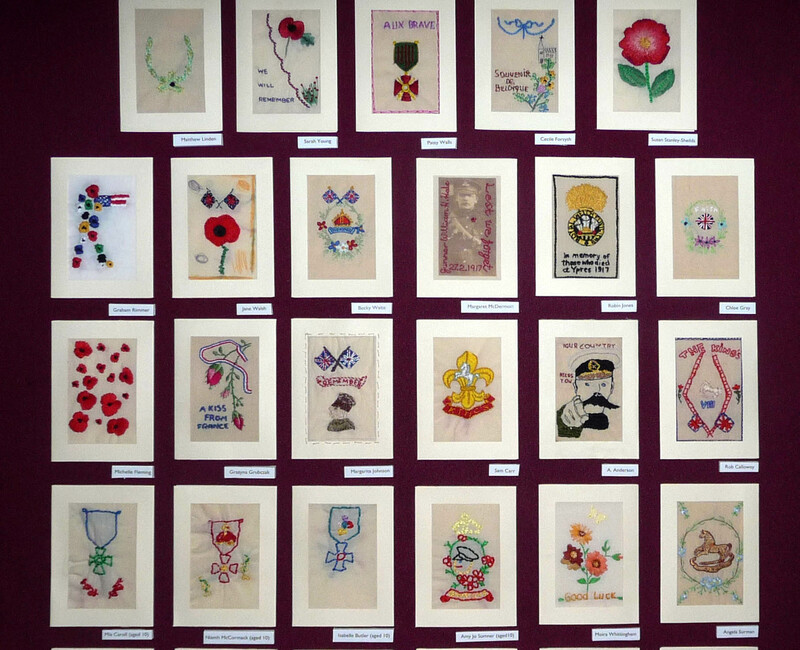 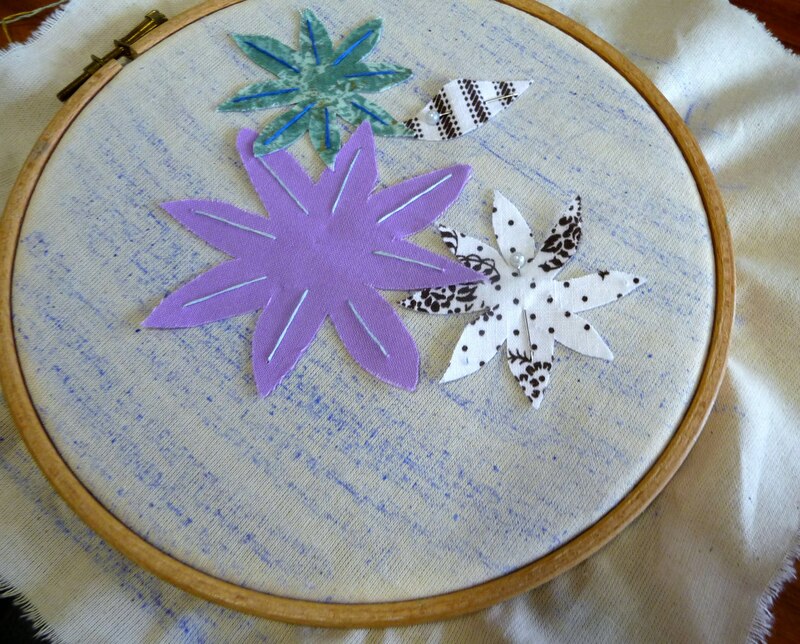 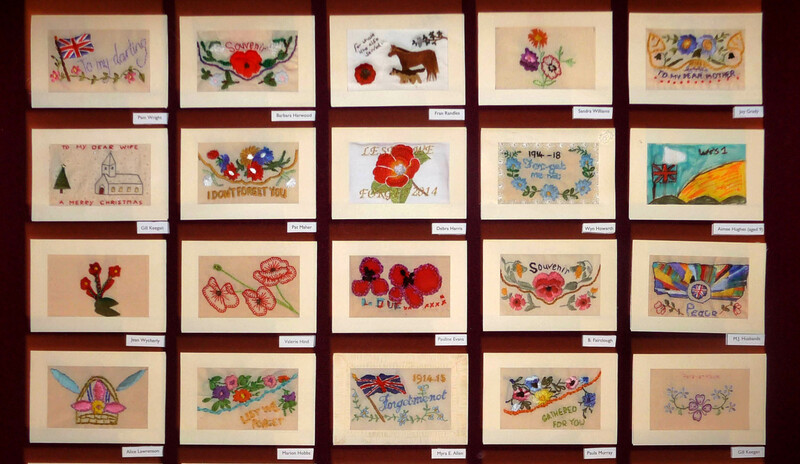 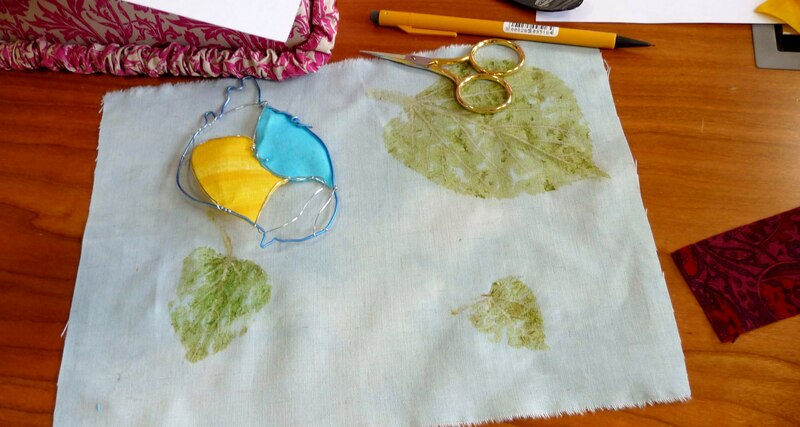 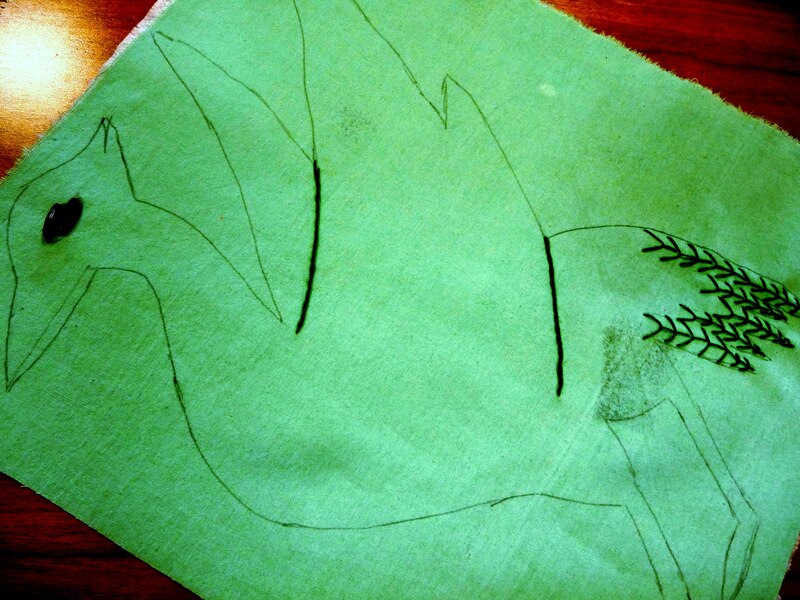 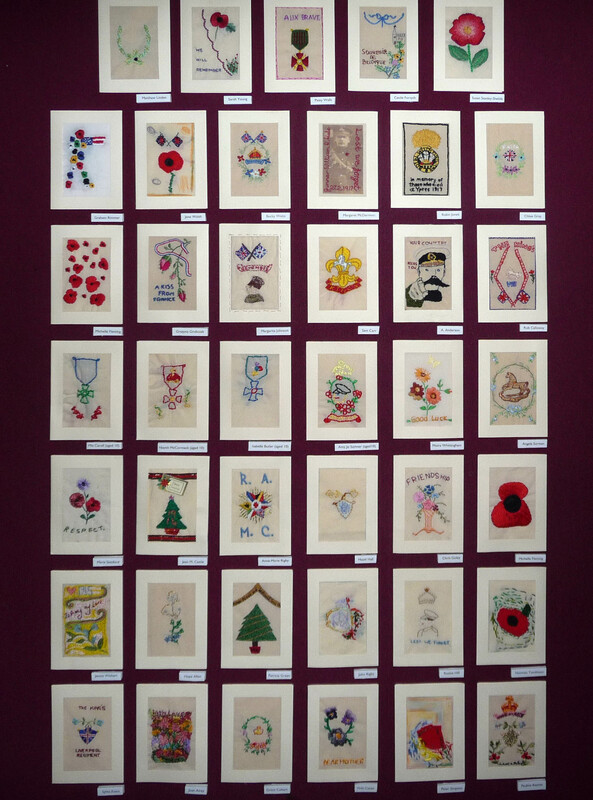 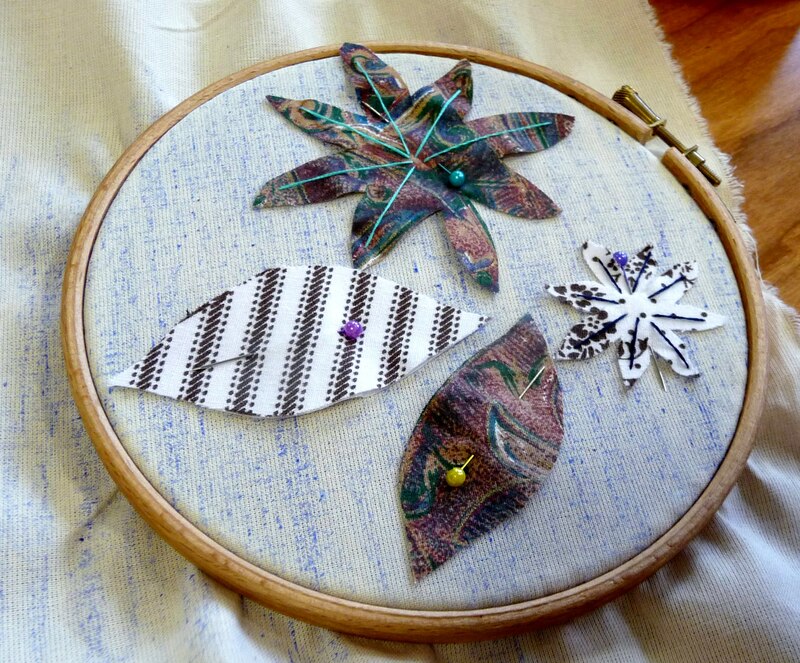 We embroidered cut out shapes of flowers and leaves with long stitches, and added beads to decorate the pictures. 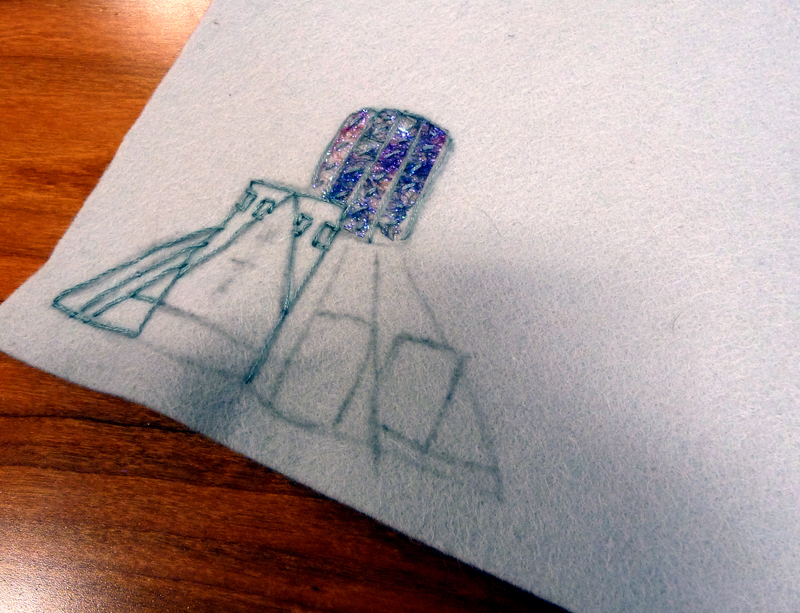 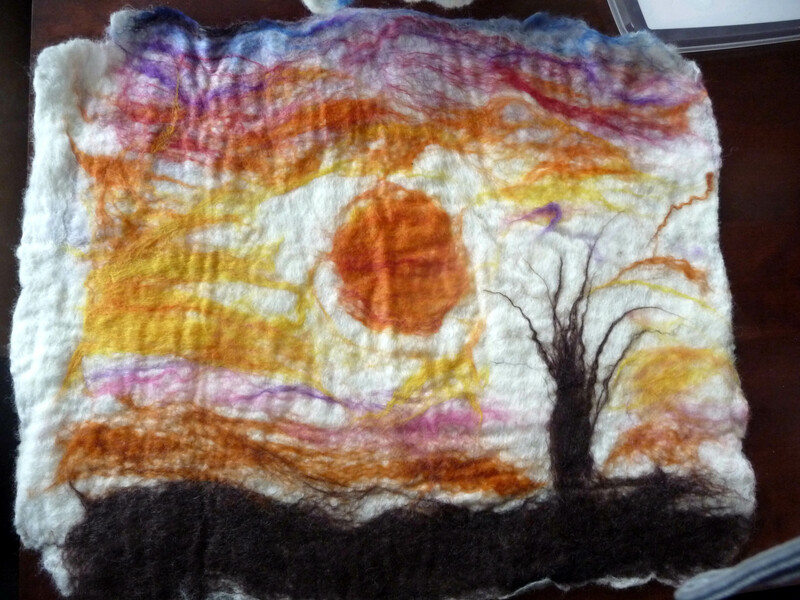 These embroideries will be mounted on to card to complete the picture. 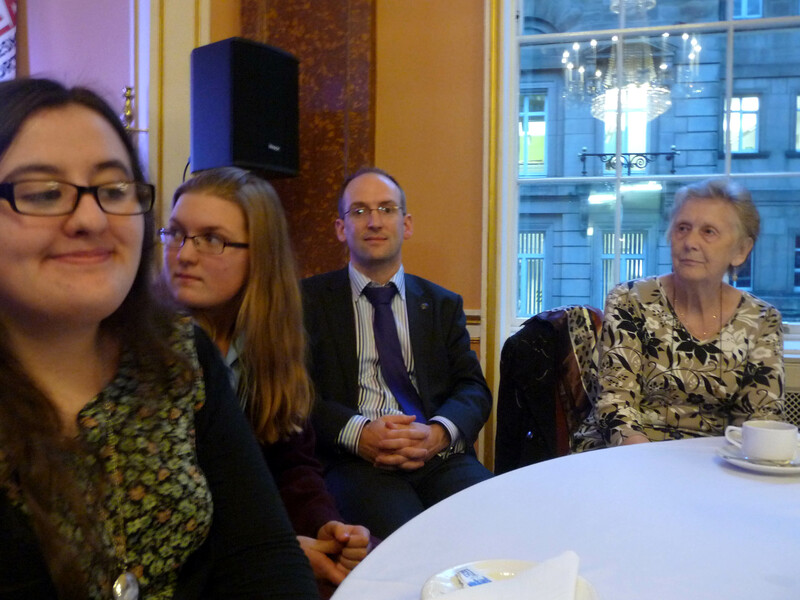 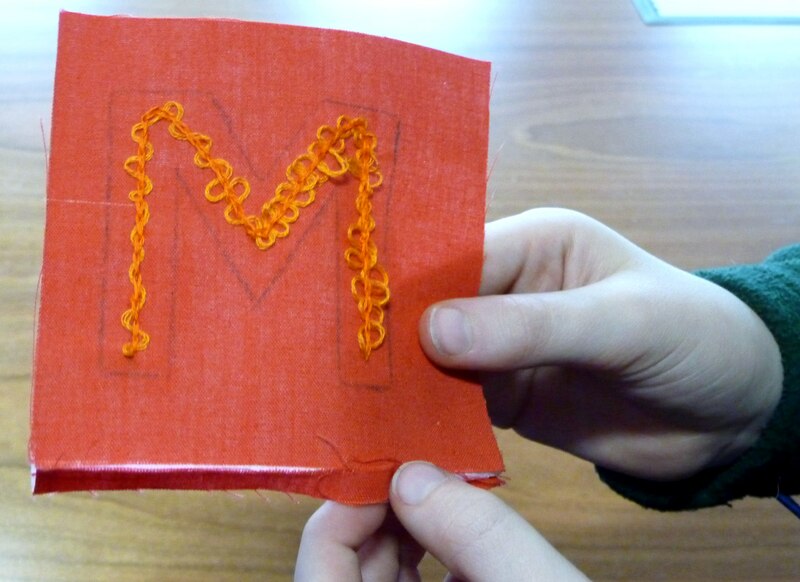 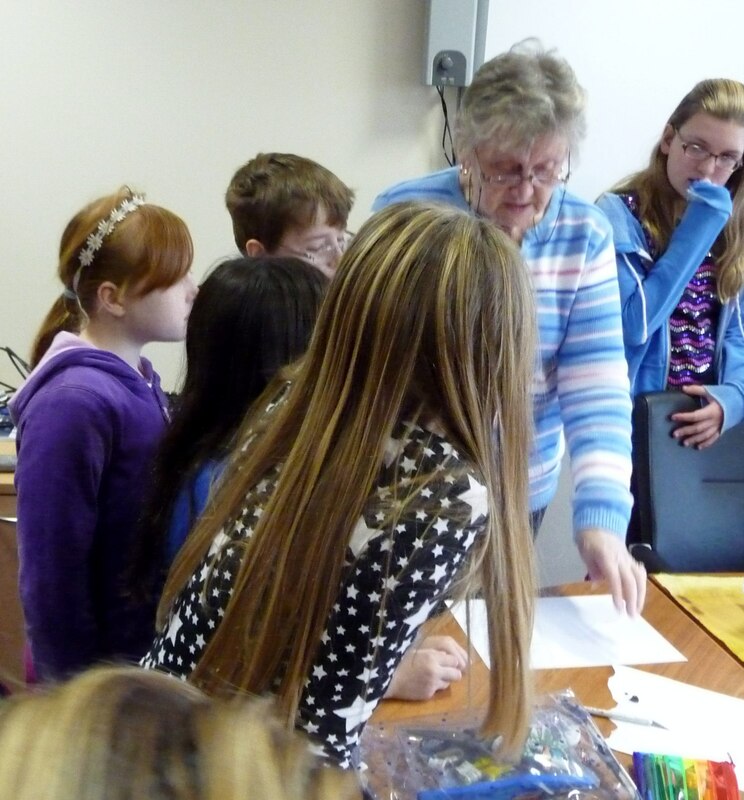 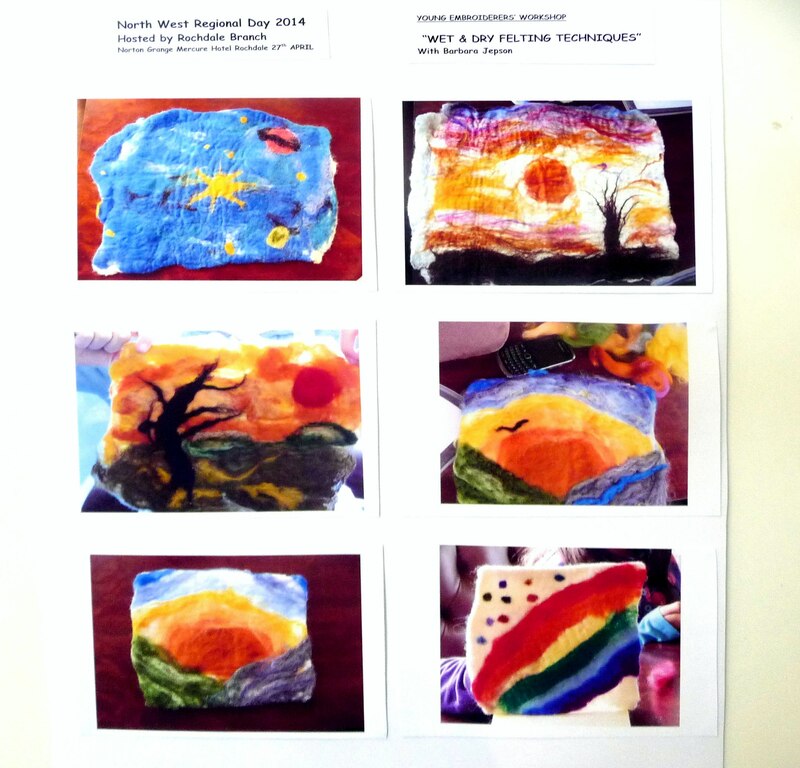 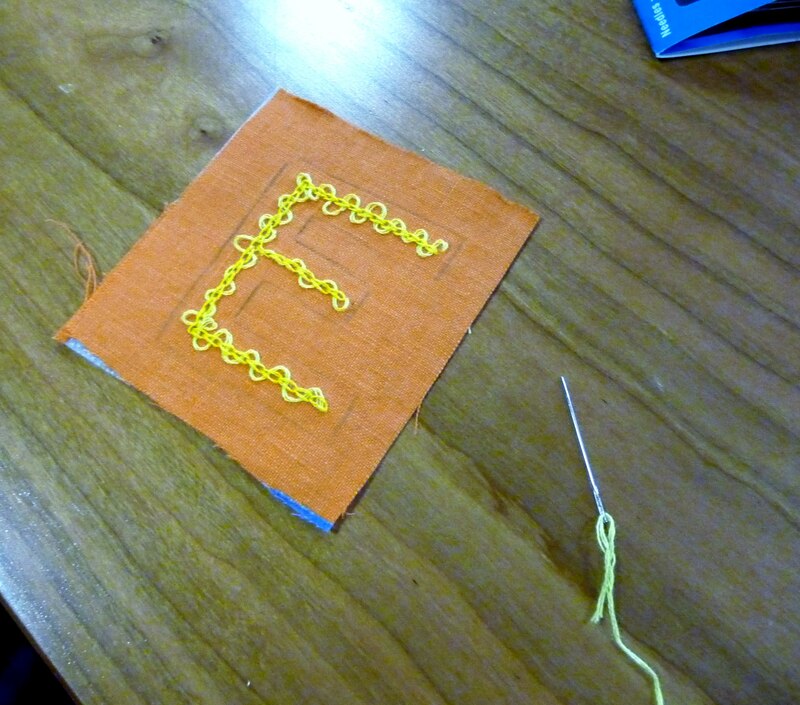 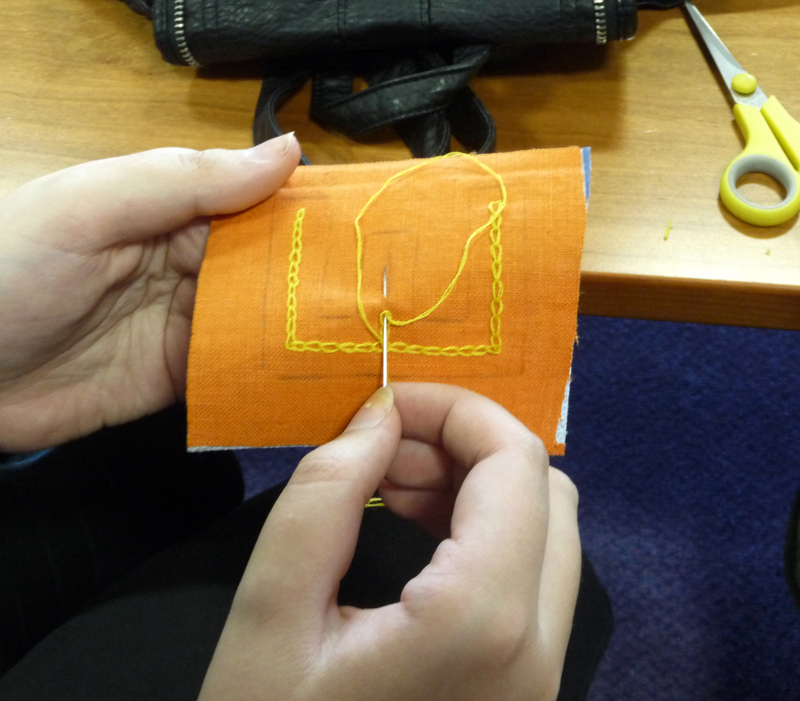 On Sunday 27th April 2014 eight of our Young Embroiderers went on a coach trip to Rochdale to attend E.G. 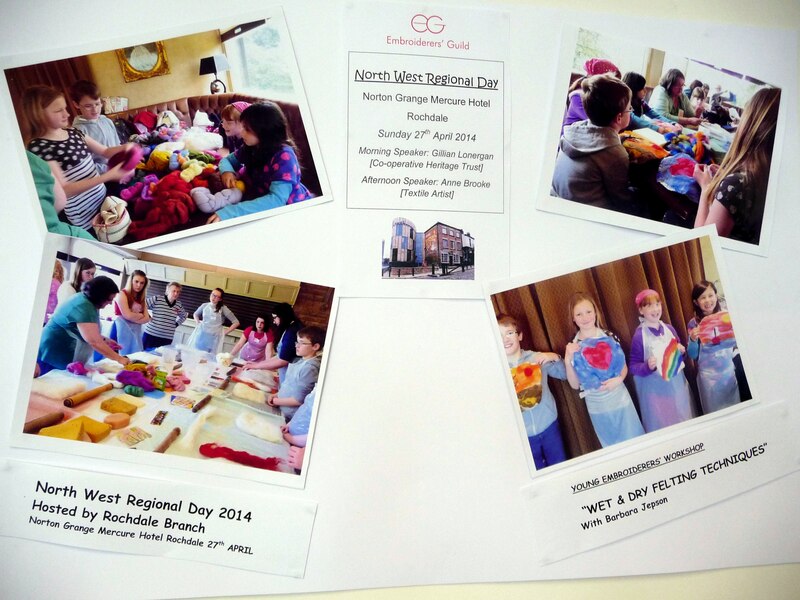 NW Regional Day. 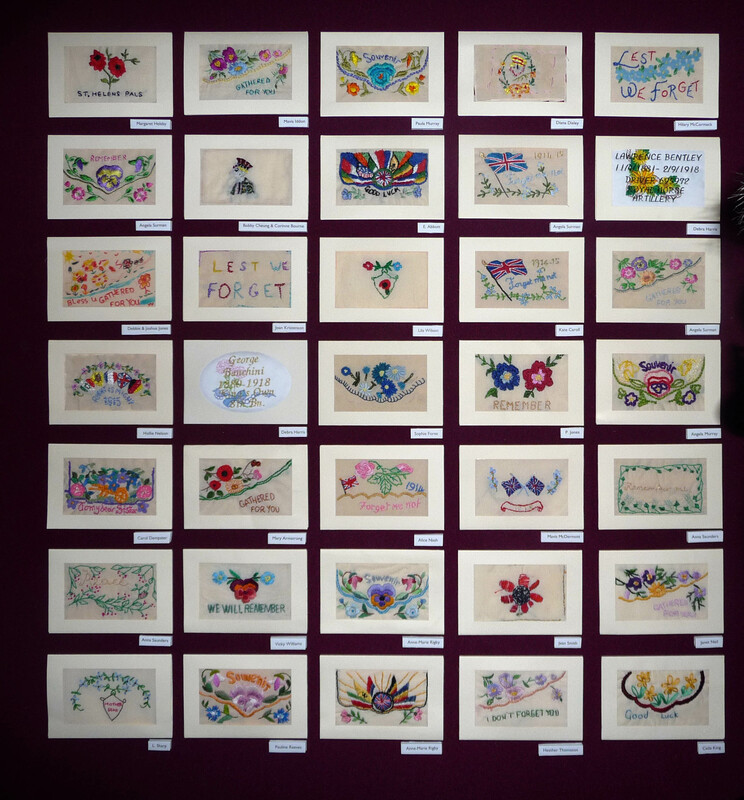 They took with them items they had embroidered at home or in class to enter into the Kathleen Mansfield Trophy competition for individual work. 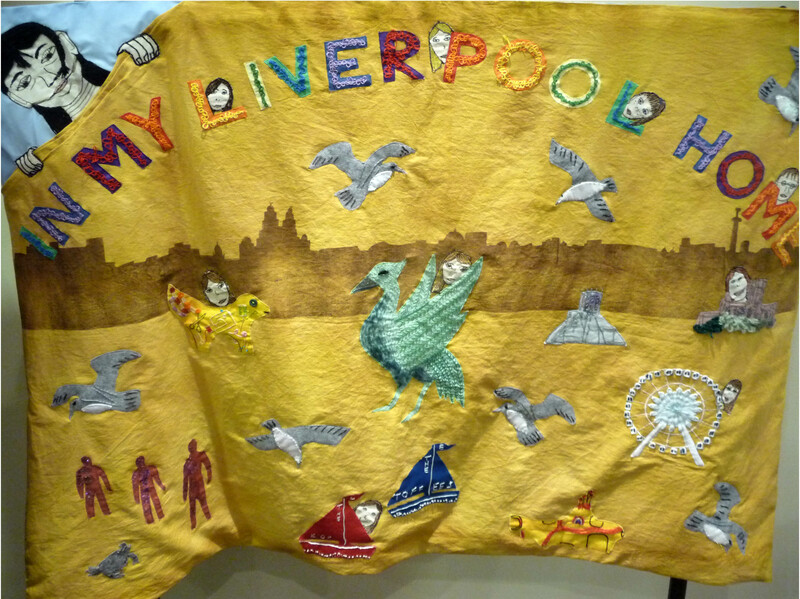 We also took our embroidered panel, “In Our Liverpool Home”, recently completed for National Association of Decorative and Fine Arts to enter into the Coats Anchor Group entry competition. 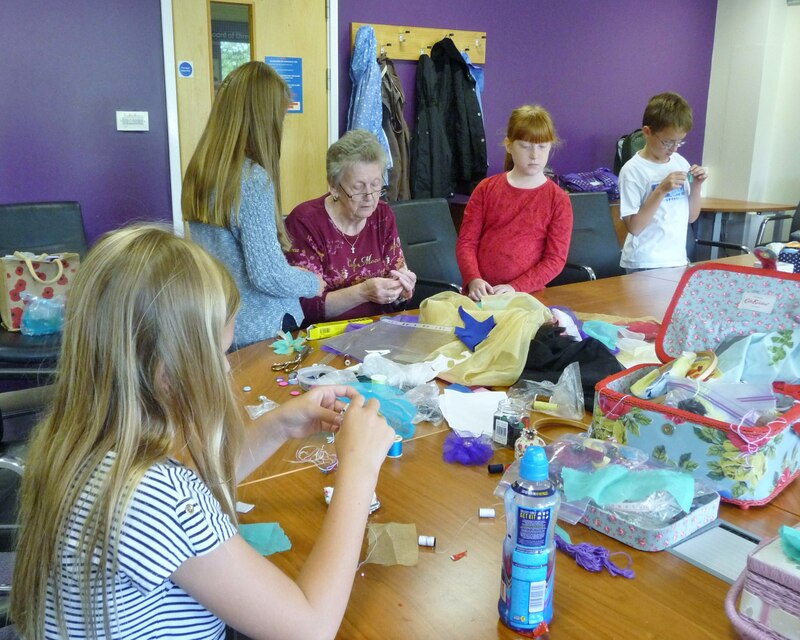 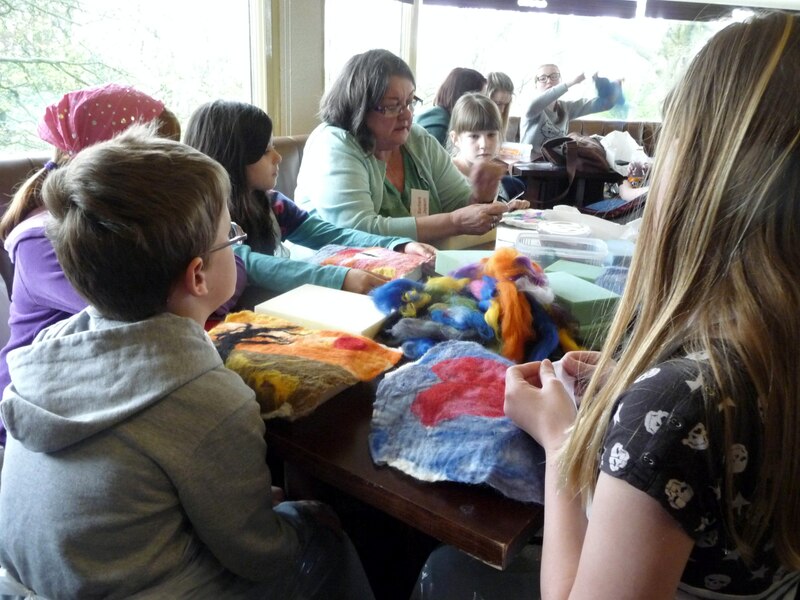 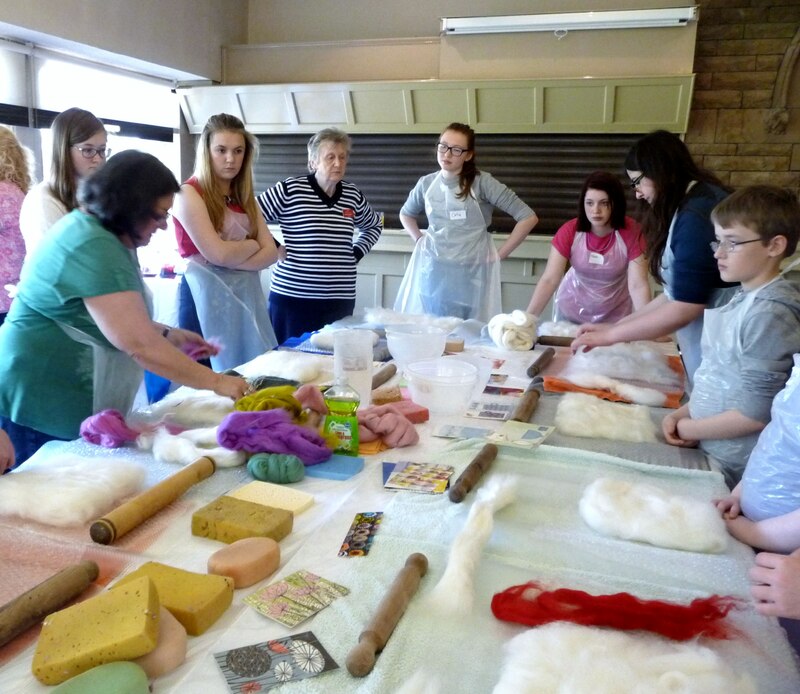 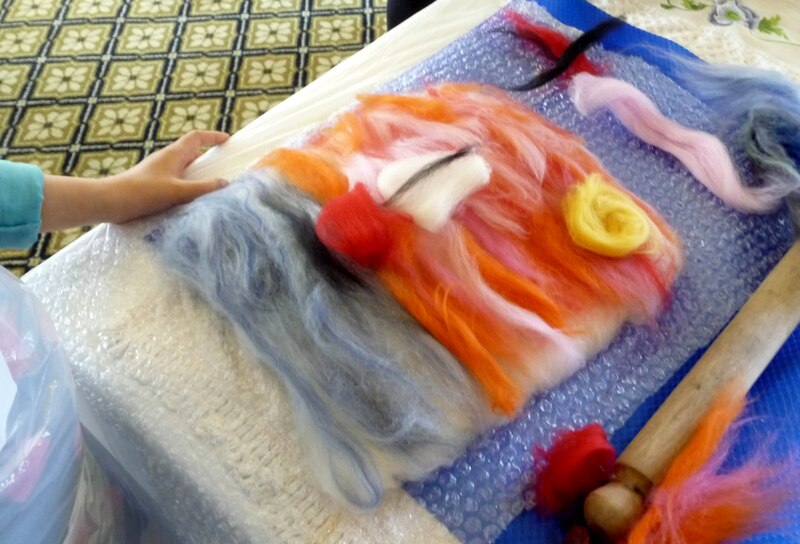 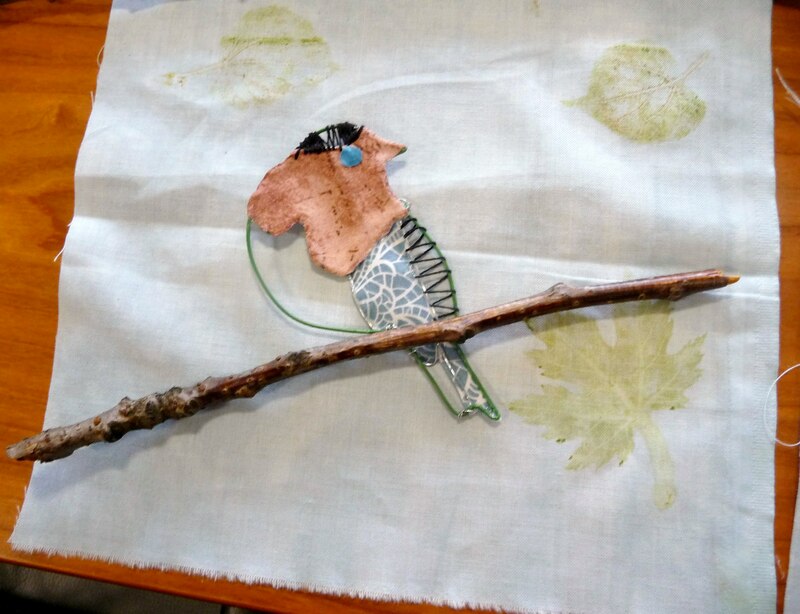 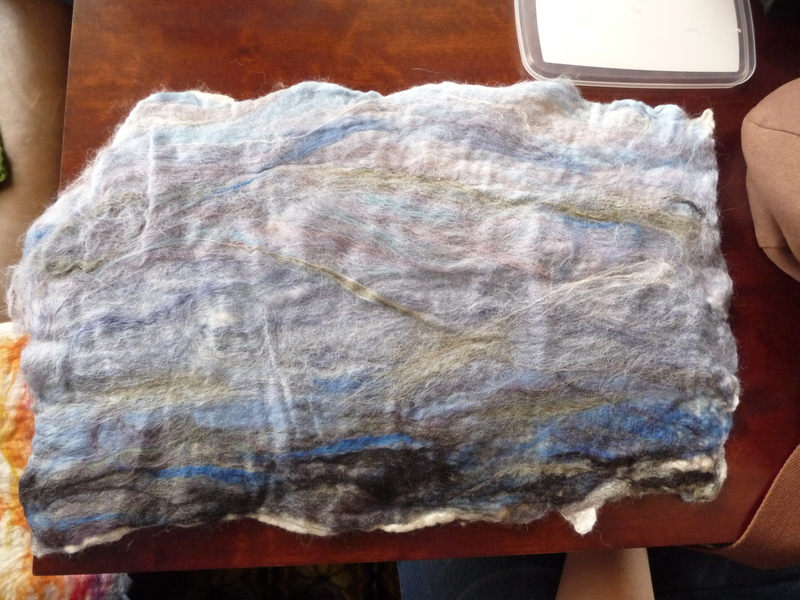 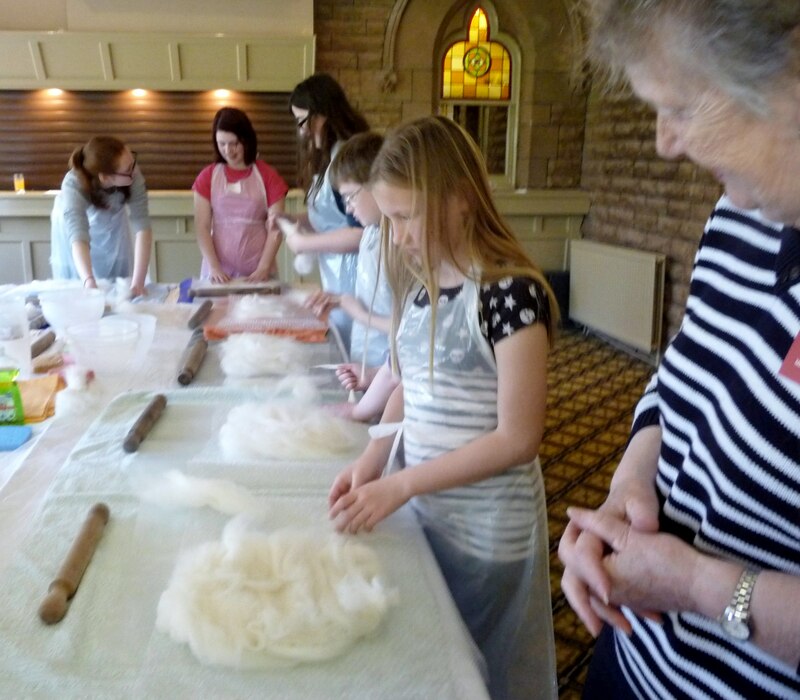 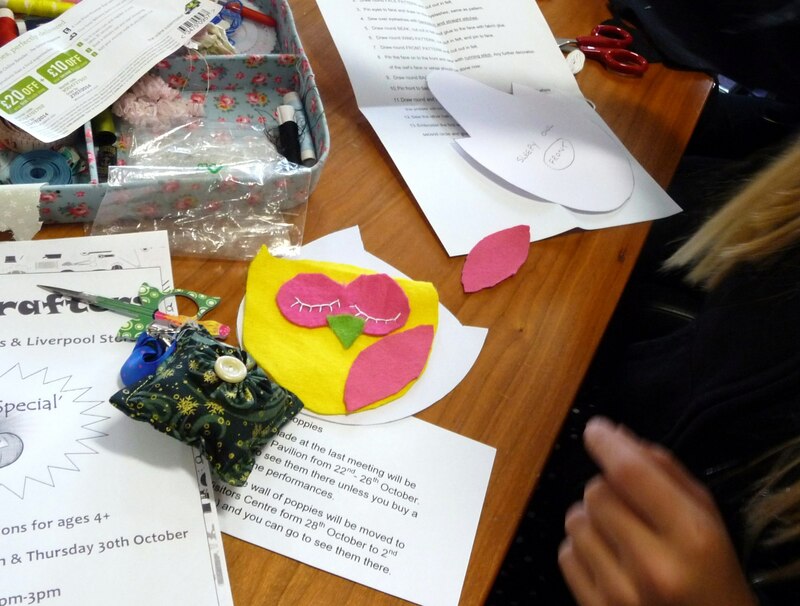 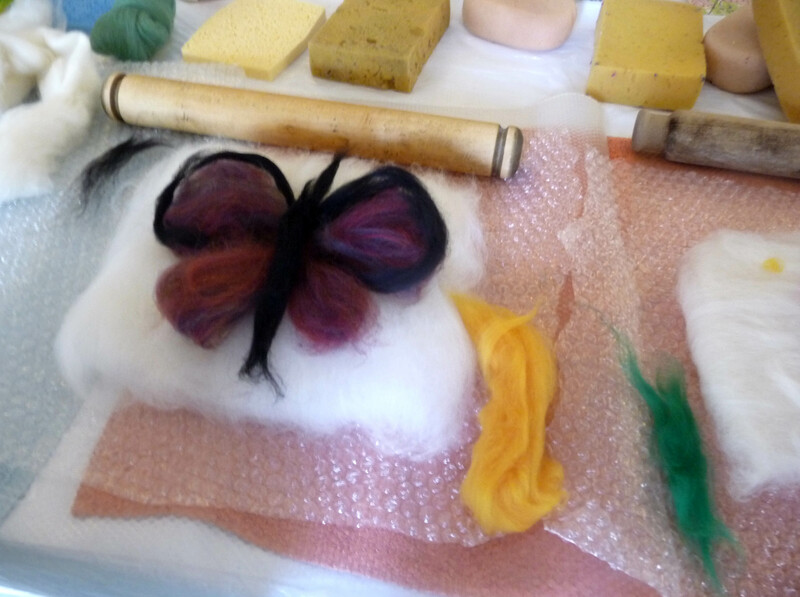 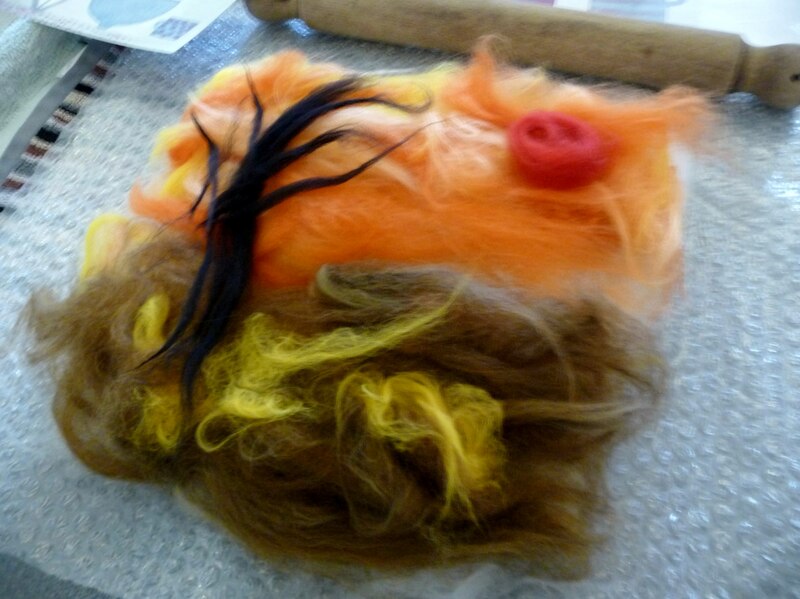 Our group of Young Embroiderers joined others from the NW Region and spent the day making felt with tutor Barbara Jepson. 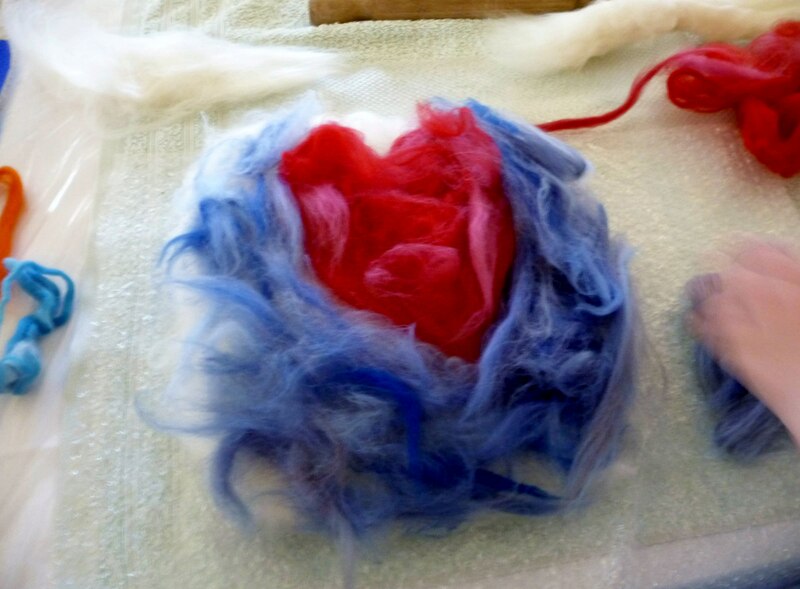 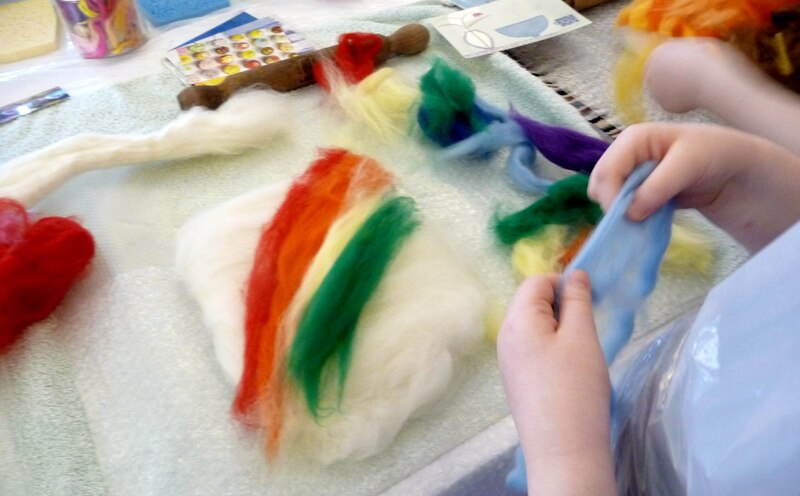 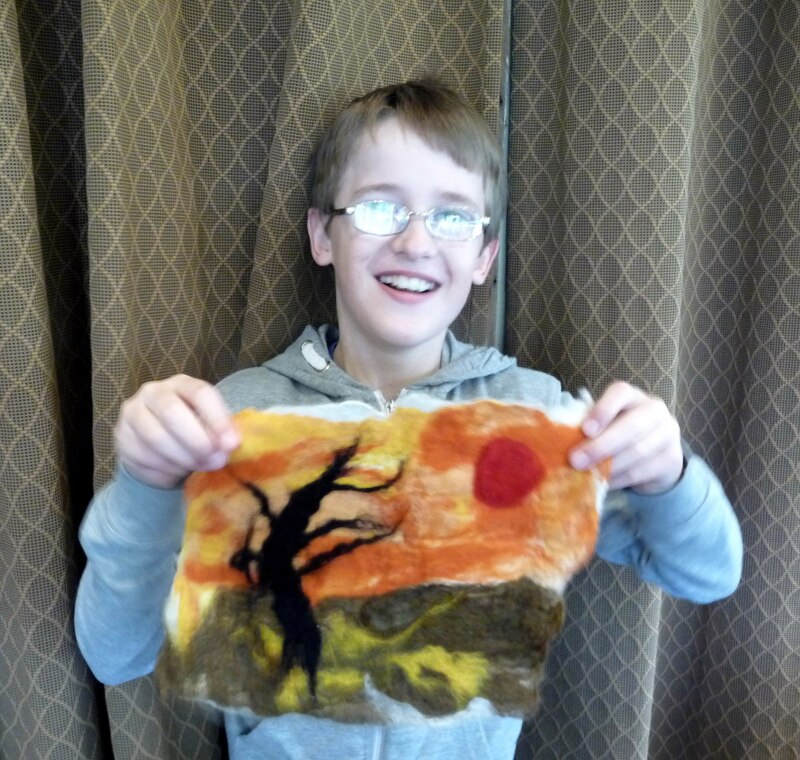 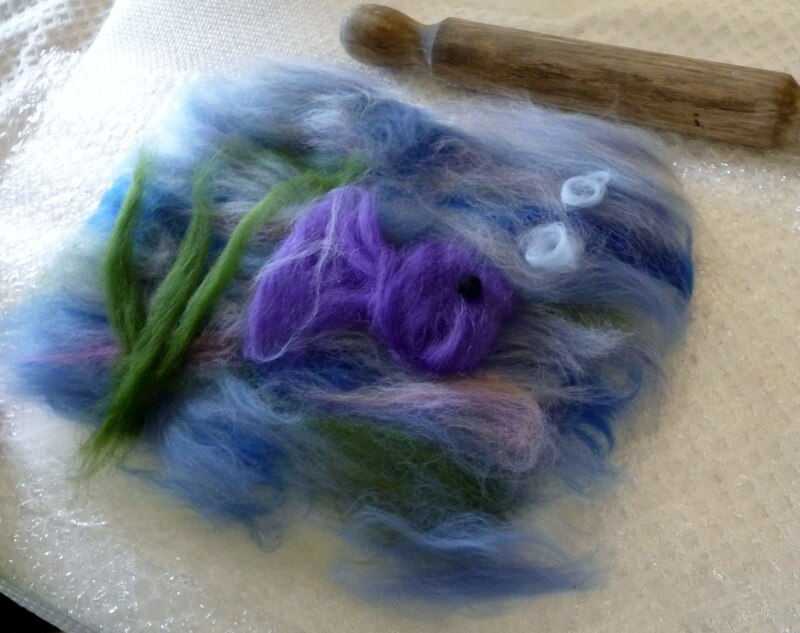 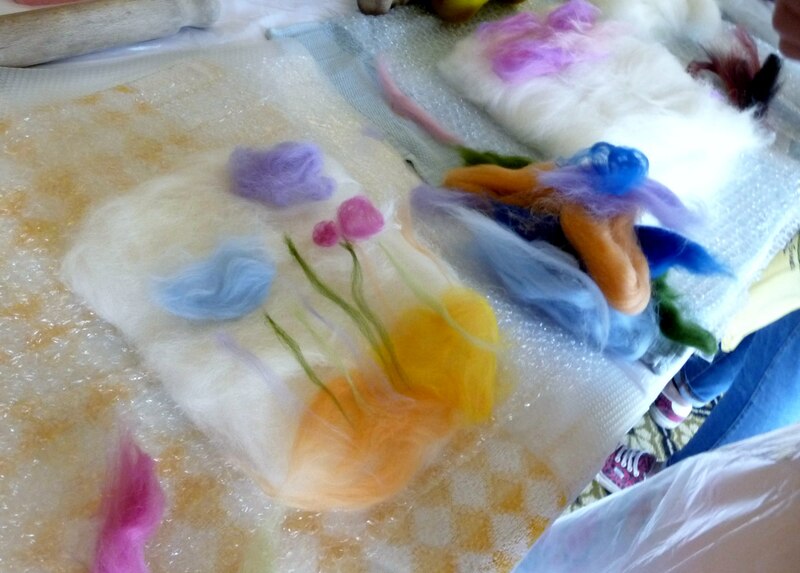 During the morning they learned how to make wet felt, then after lunch, Barbara showed them how to use needlefelting to further embellish their pictures. 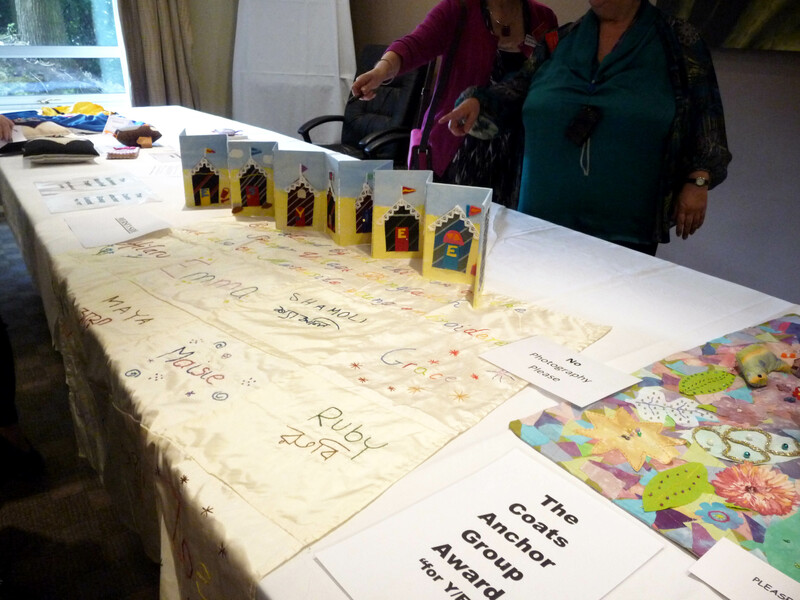 After all that we were called into the main NW Regional meeting for prizegiving and discovered that we had won several prizes. 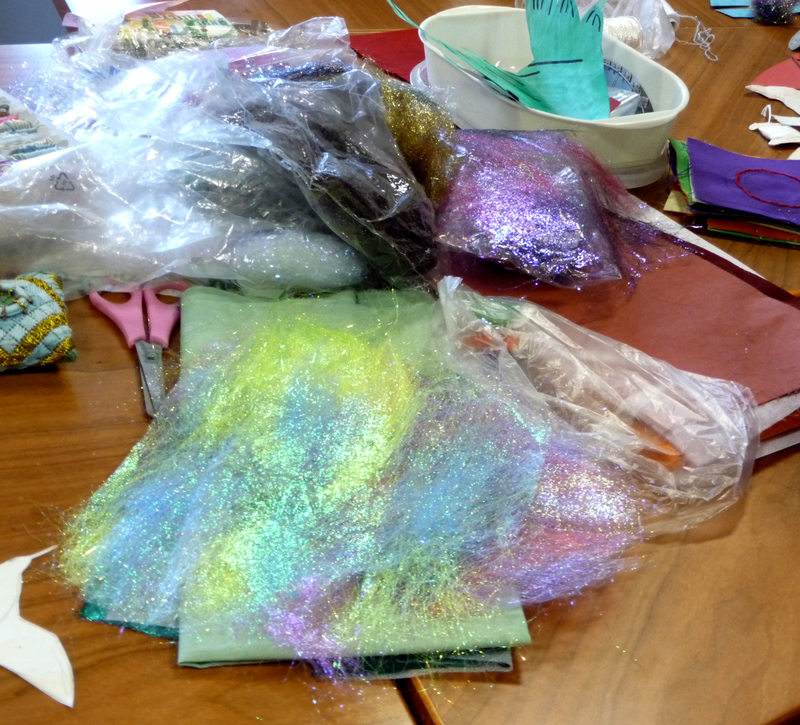 We had a special day to celebrate YE’s 40th Birthday. 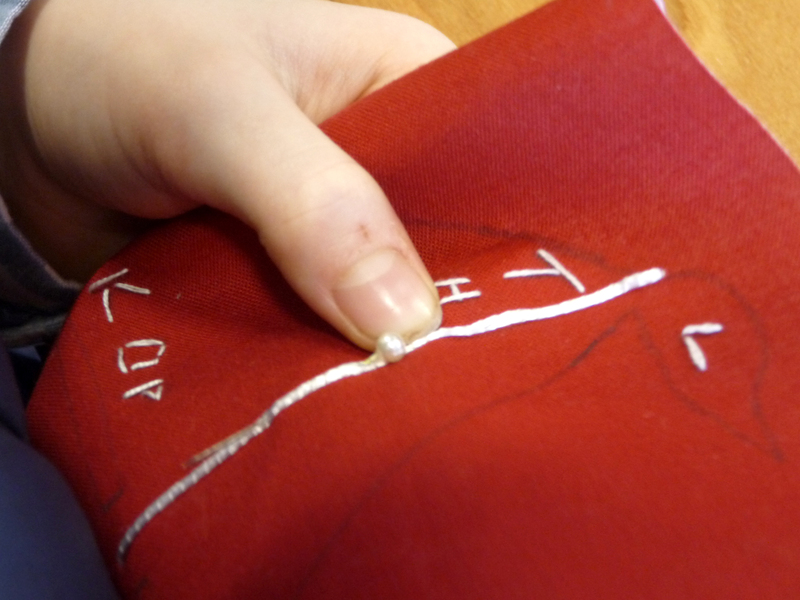 No sewing at all today! 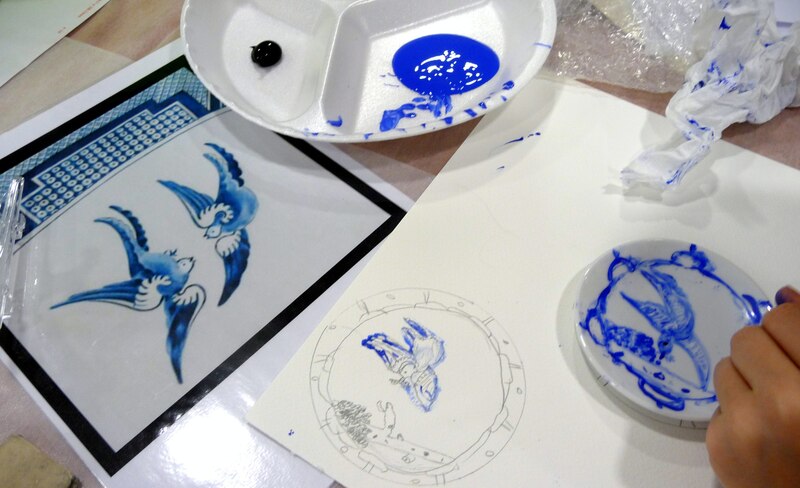 We had Artist Educator Juliet Staines to lead the class in a plate painting activity. 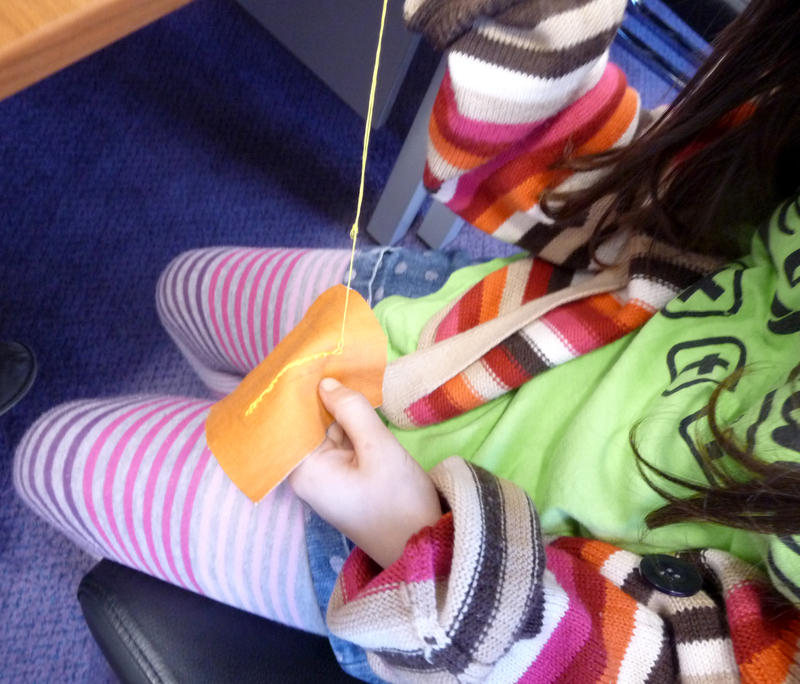 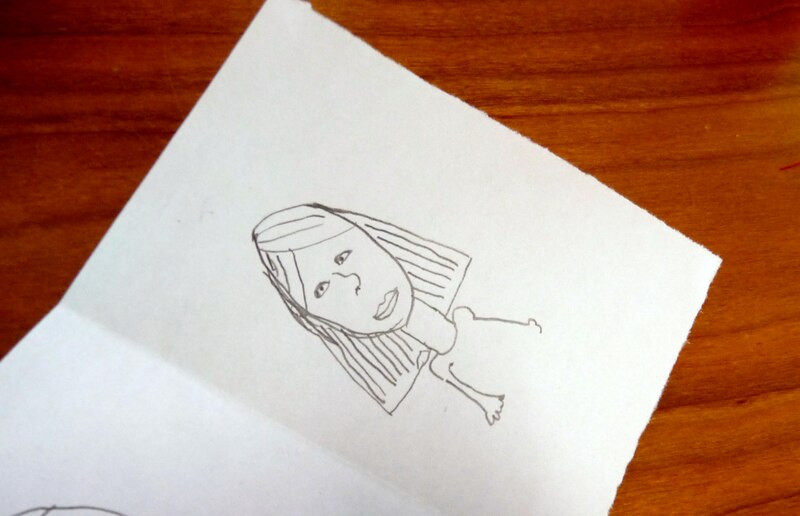 She began with some warm up exercises to loosen our creativity. 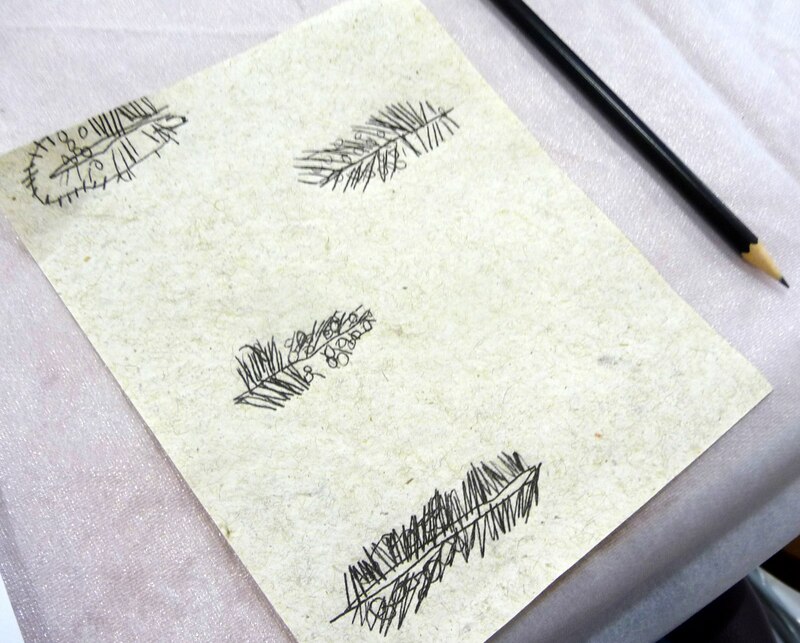 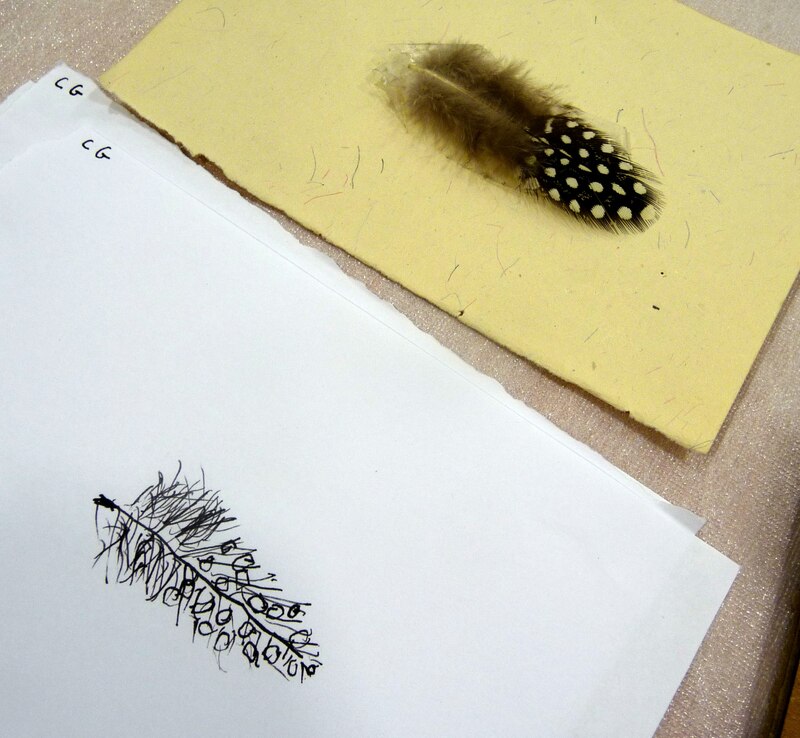 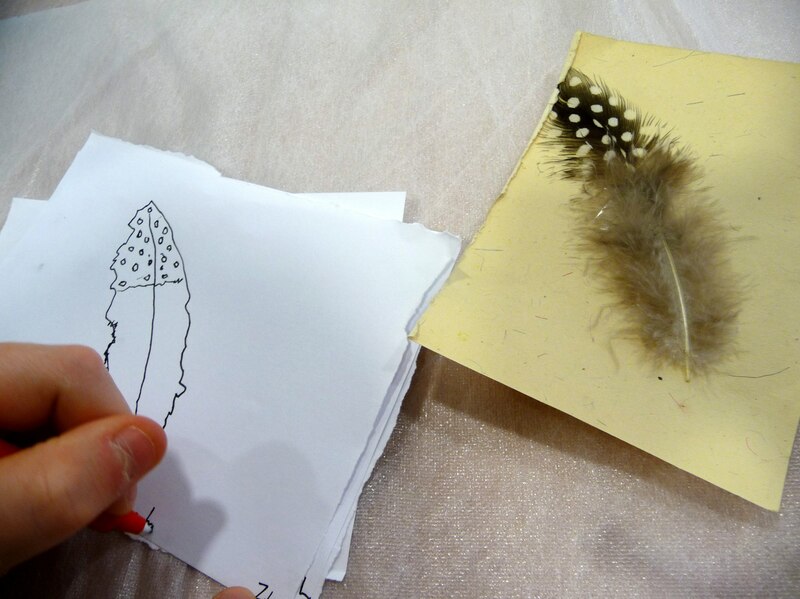 We had to draw a feather at speed, then without looking at our work, then with the hand we do not normally use, then in our usual style. 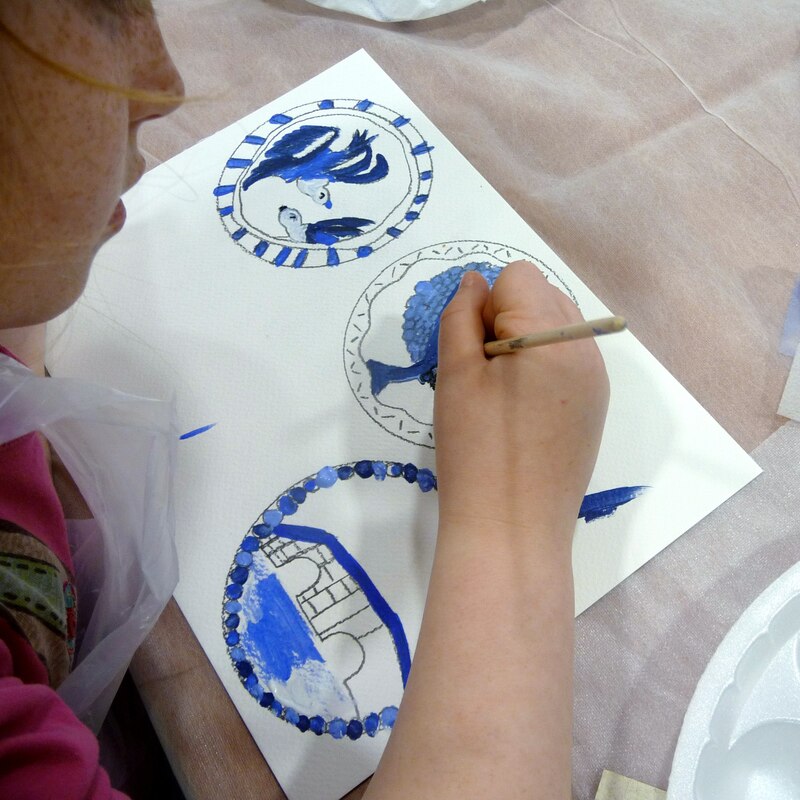 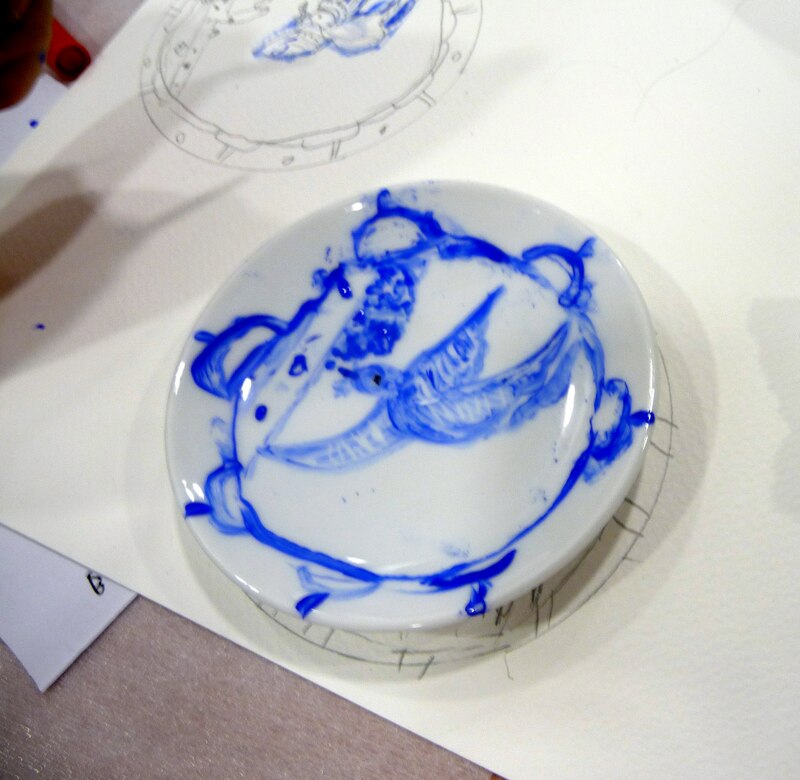 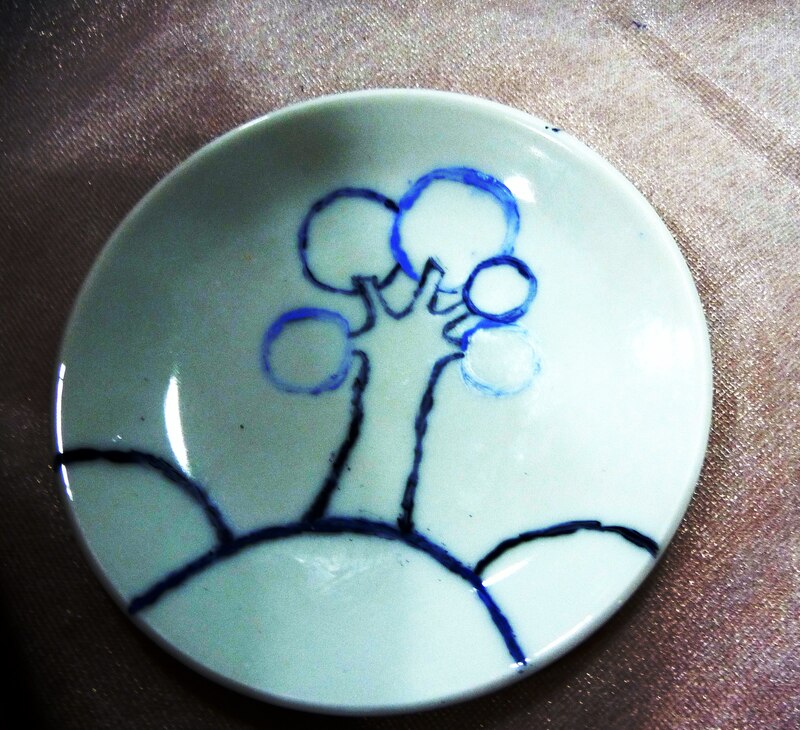 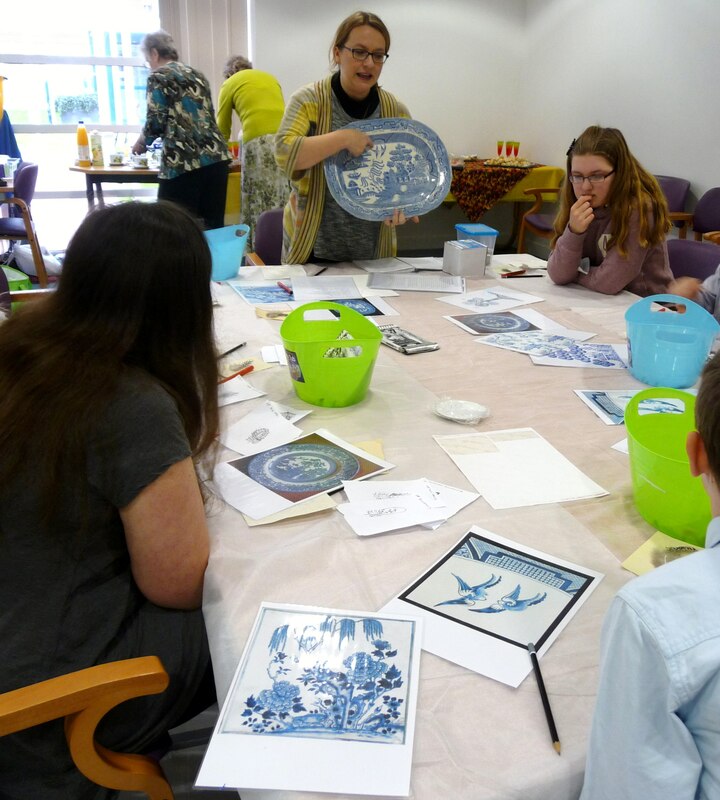 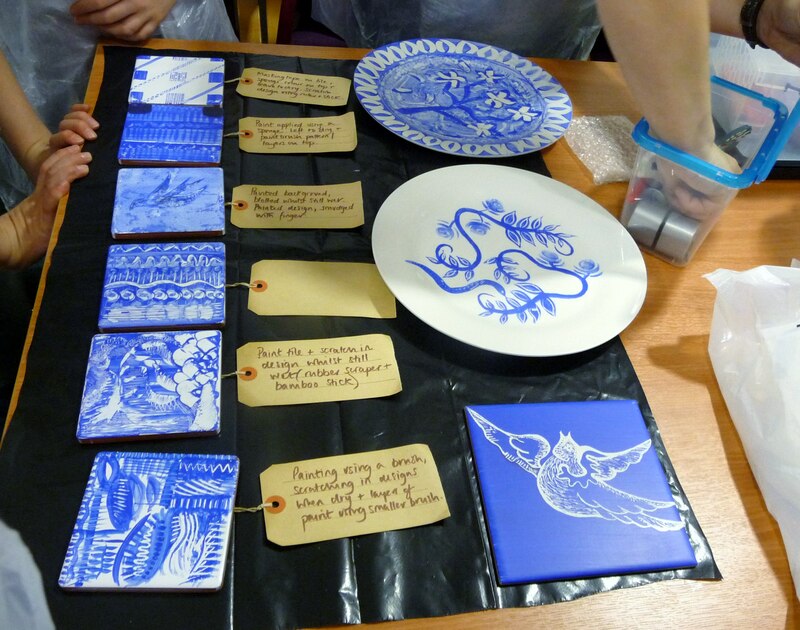 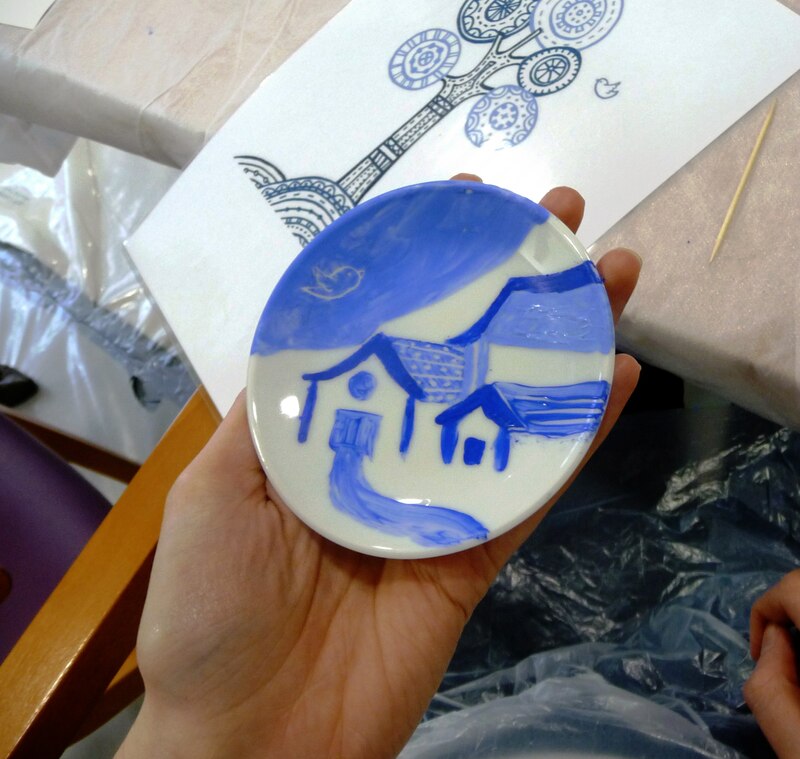 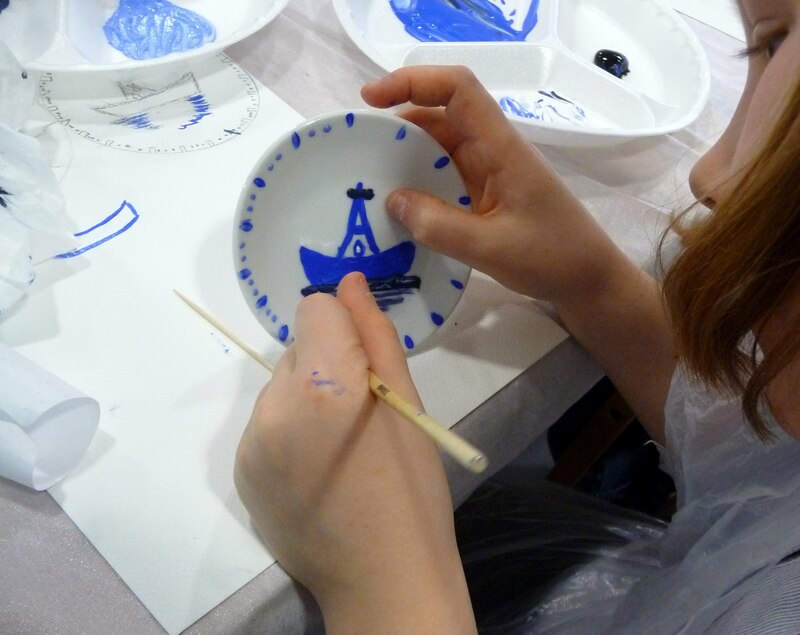 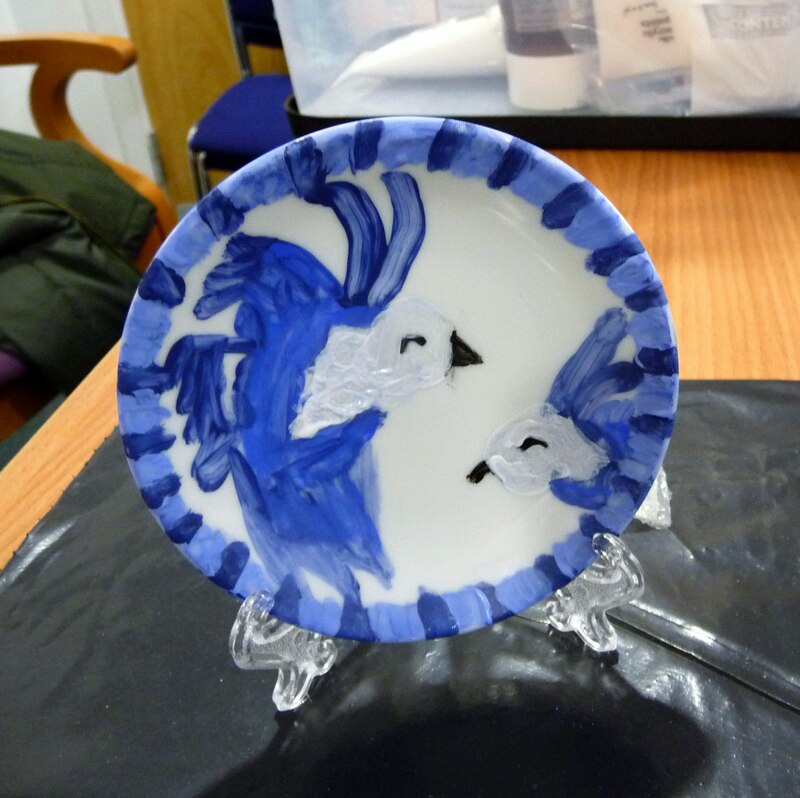 After that Juliet told the group the story of the Chinese willow pattern and gave everyone acrylic paint and small plates to paint. 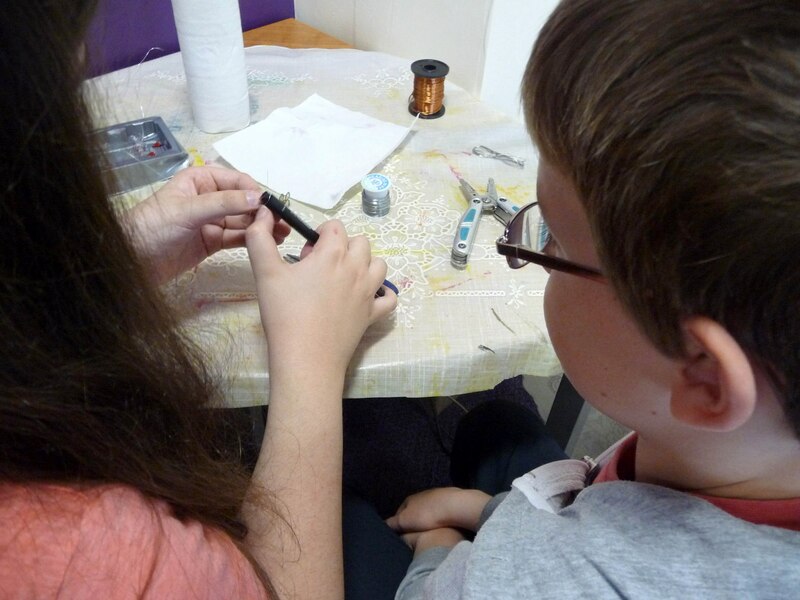 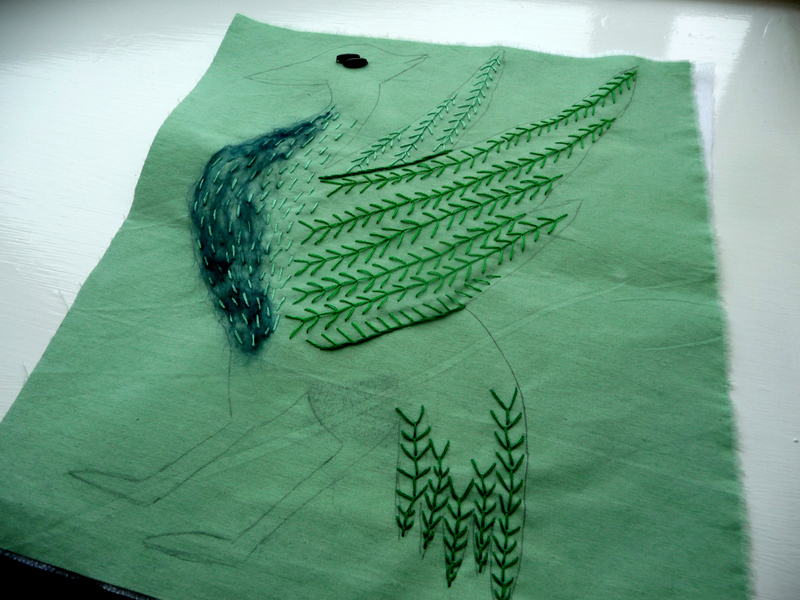 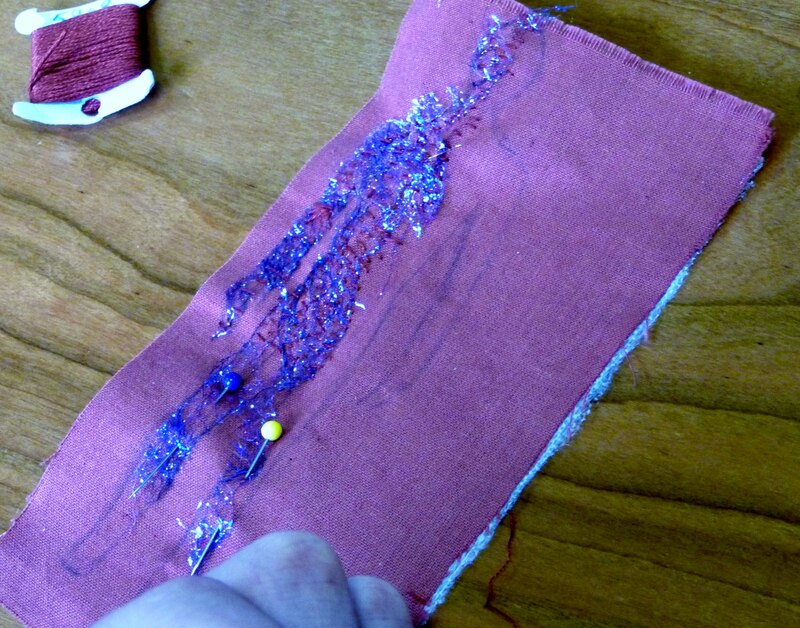 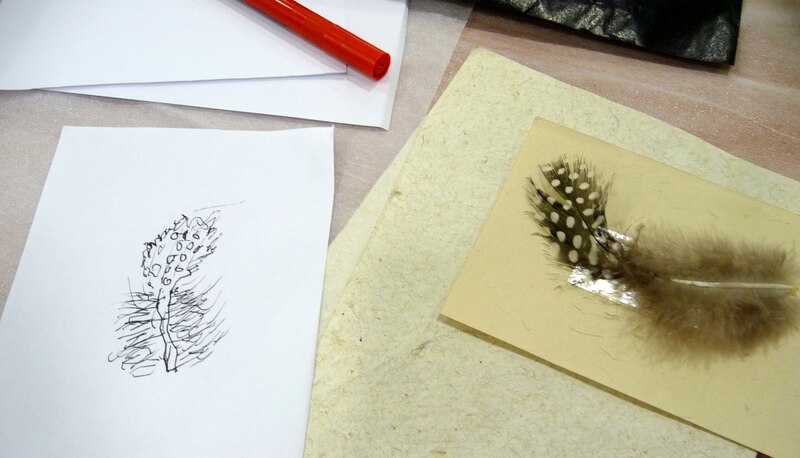 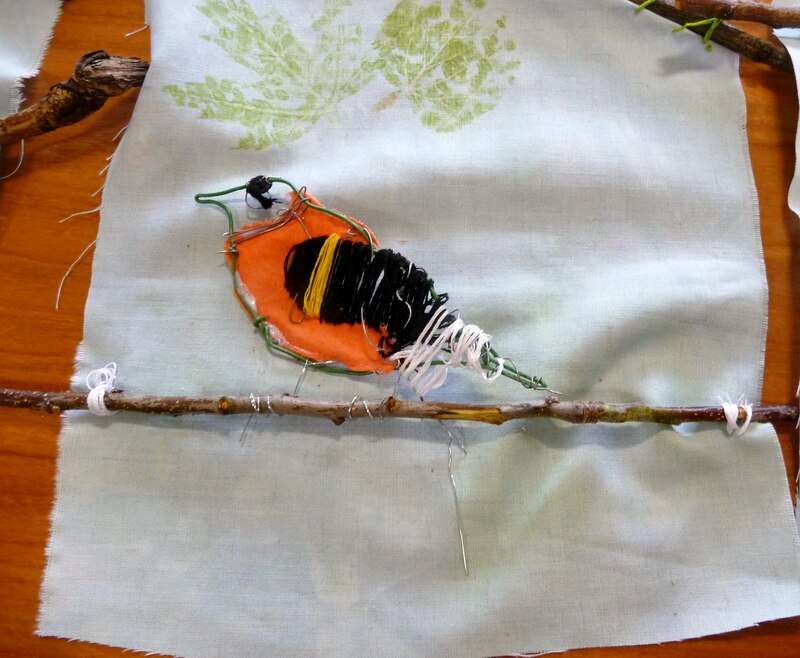 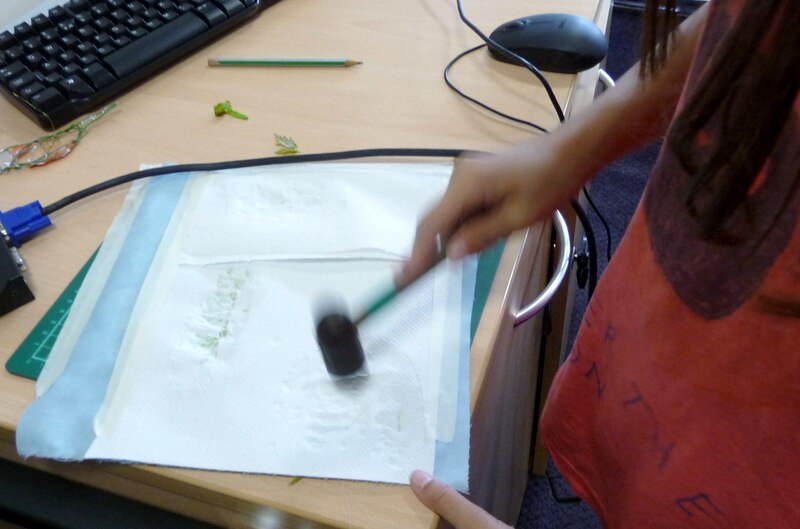 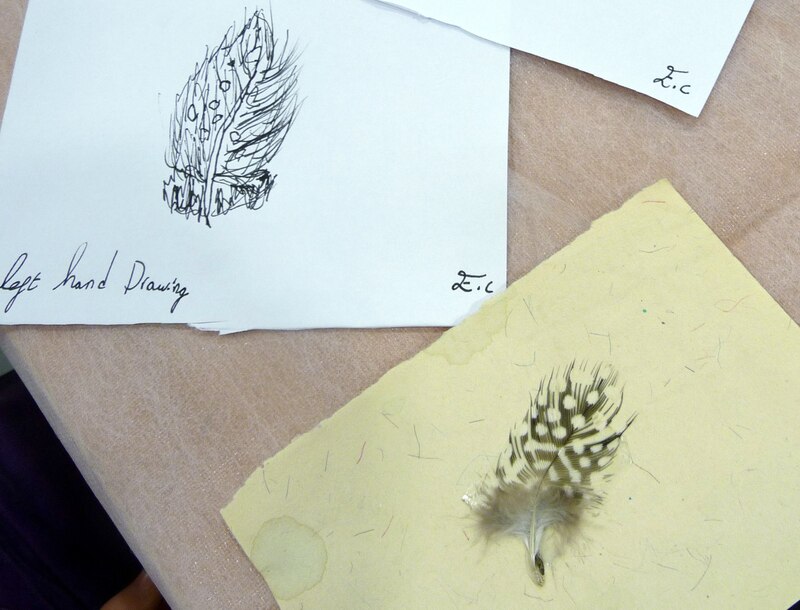 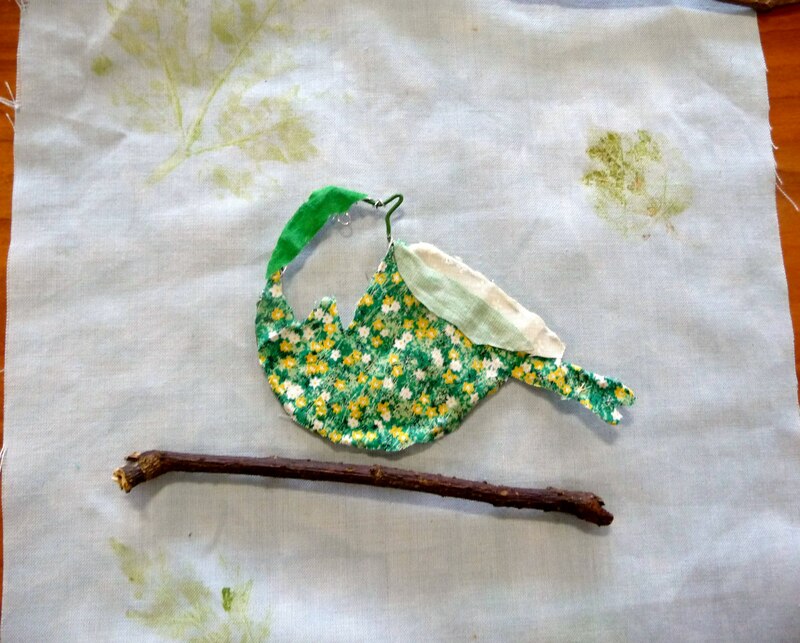 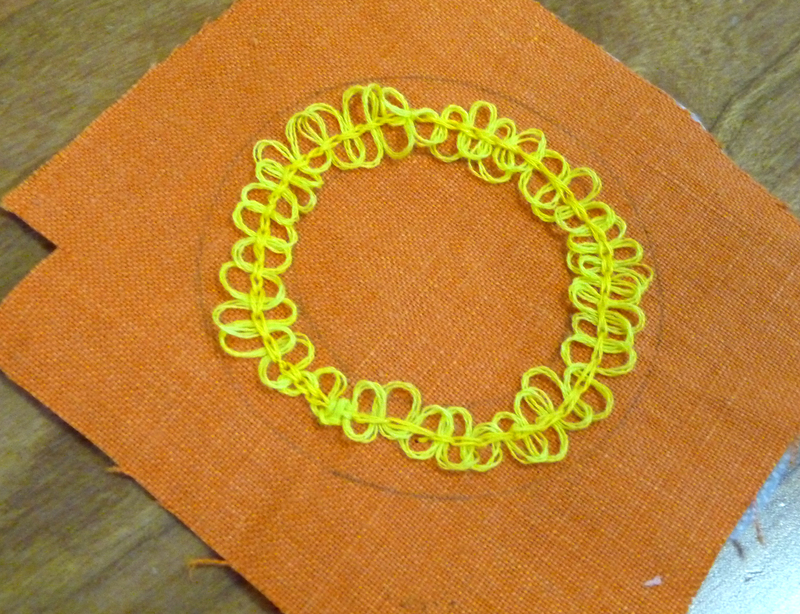 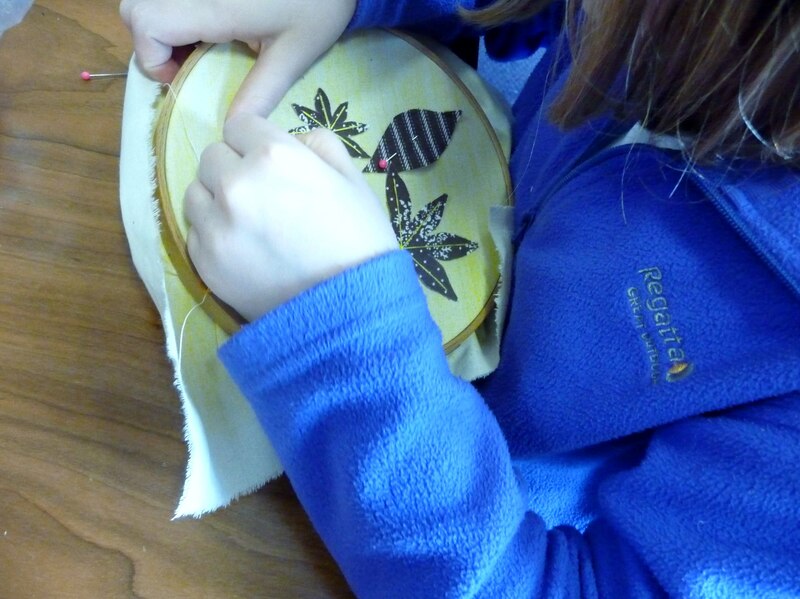 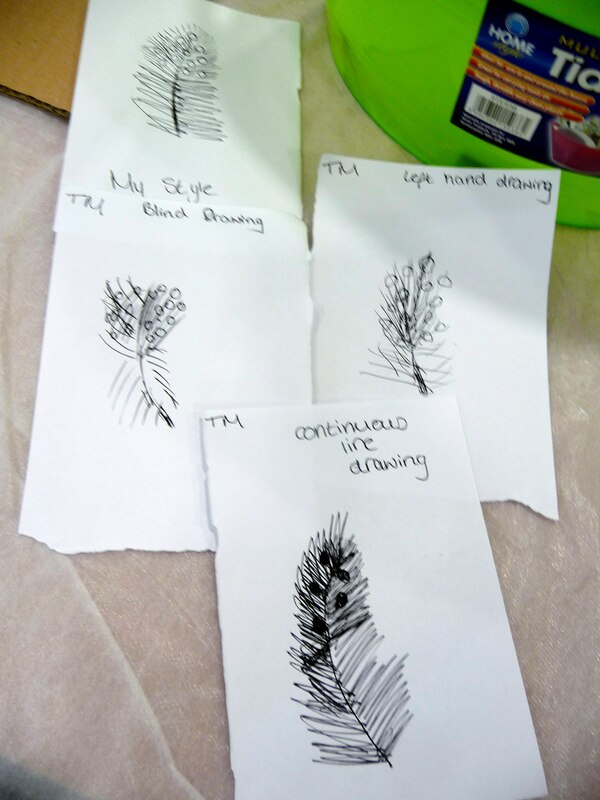 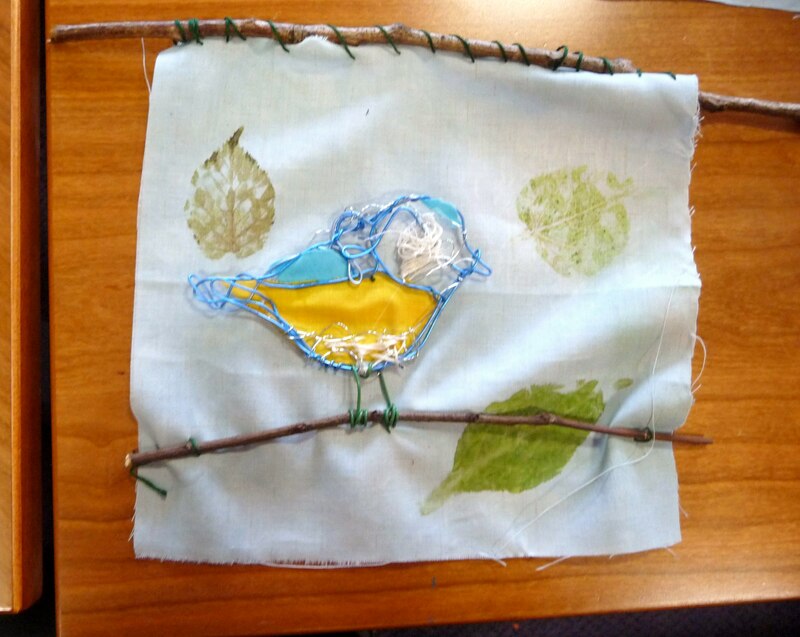 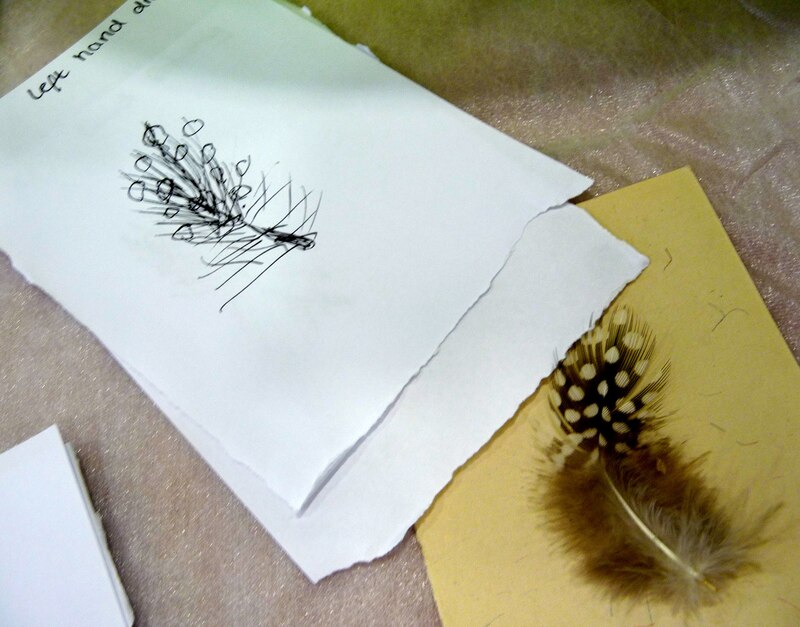 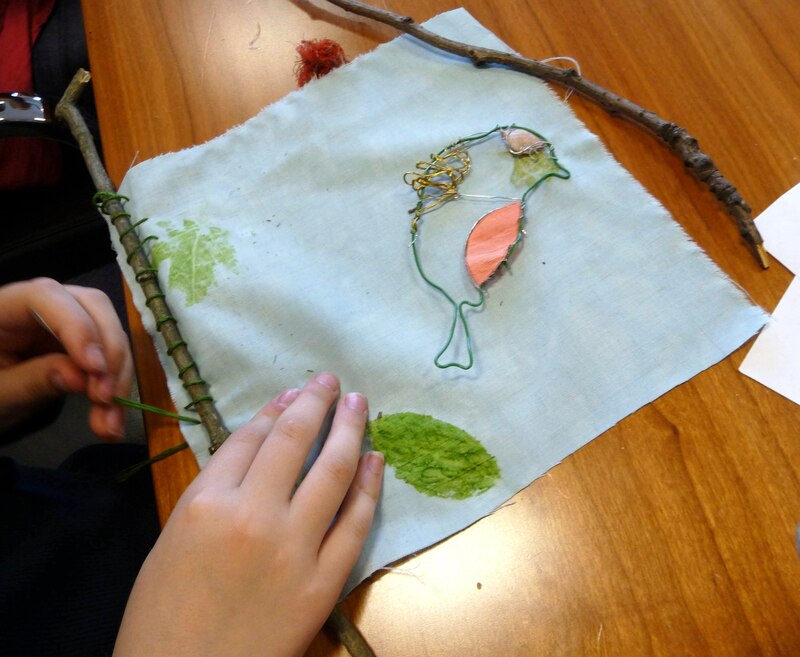 The results were fantastic and our Young Embroiderers really enjoyed the morning. 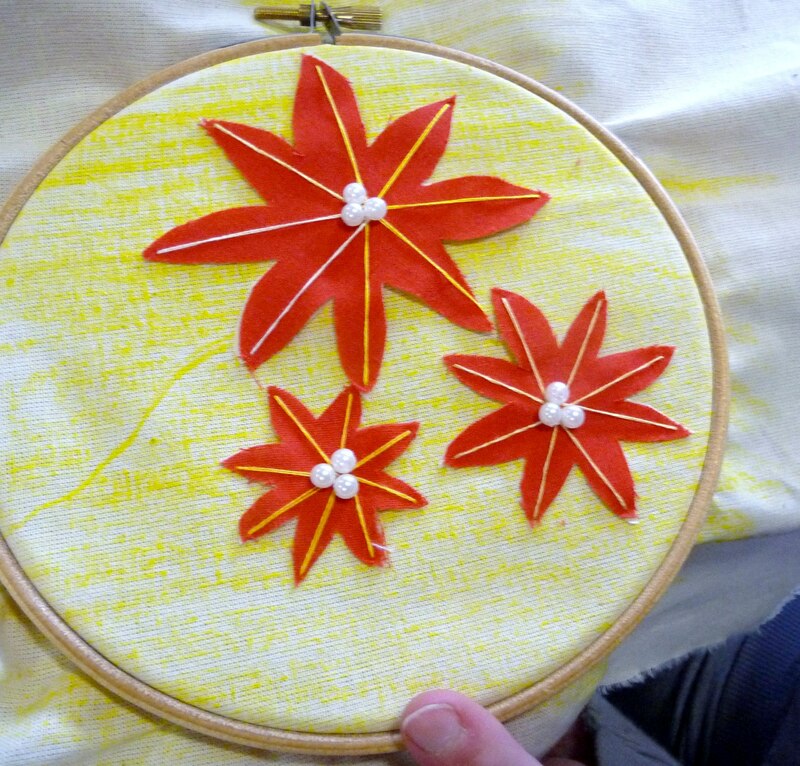 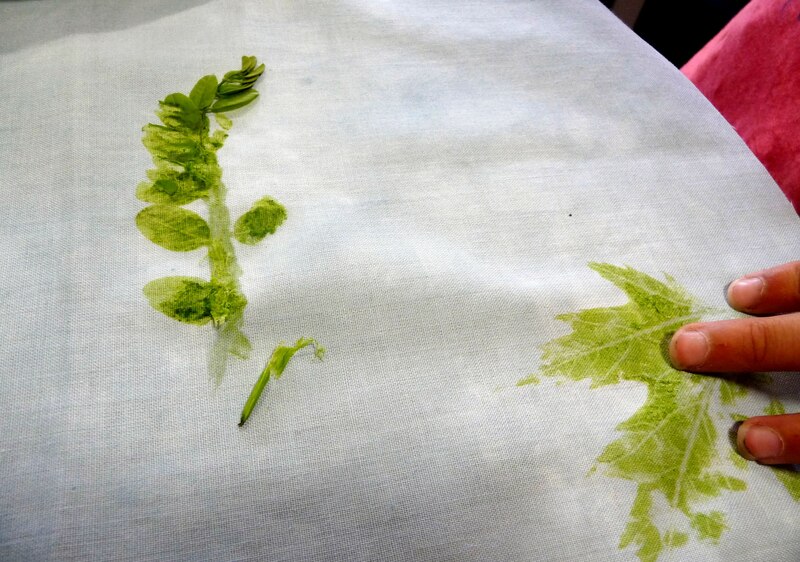 We will use these designs in the future to create embroideries. 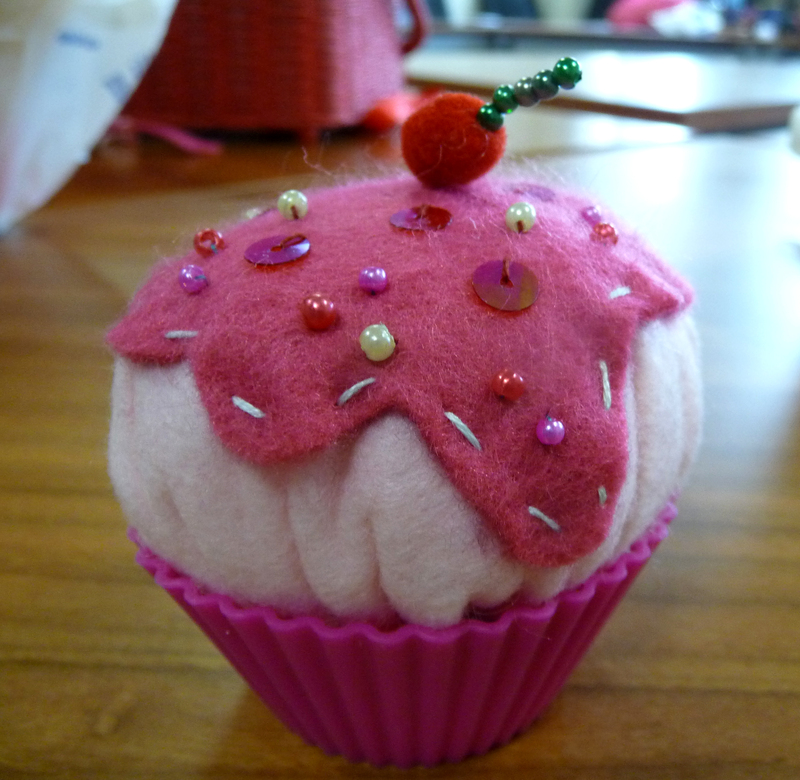 The afternoon was party time!. 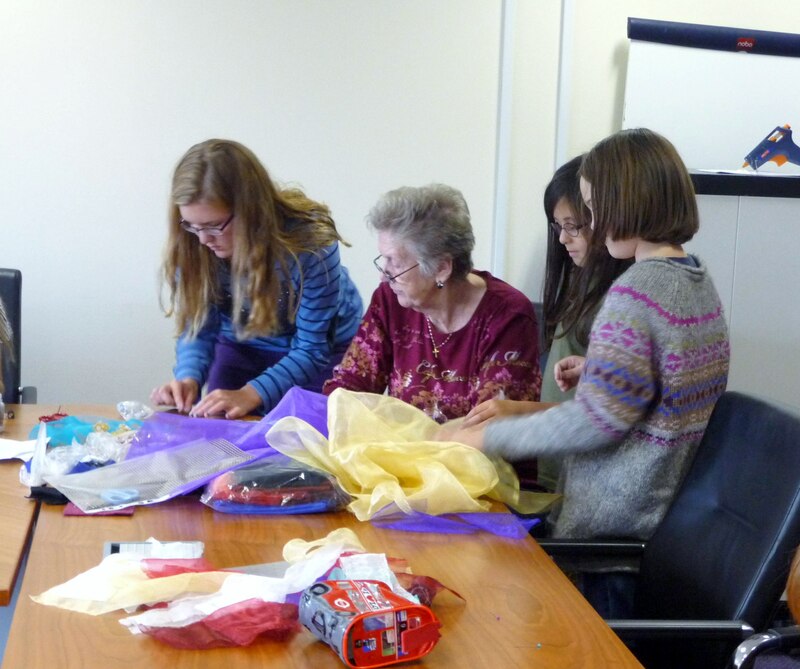 We invited some guests who have worked with our Young Embroiderers in the past, we had a wonderful buffet which was enjoyed by all, we had a fun quiz with prizes for all, and best of all we had a very impressive birthday cake to mark the occasion. 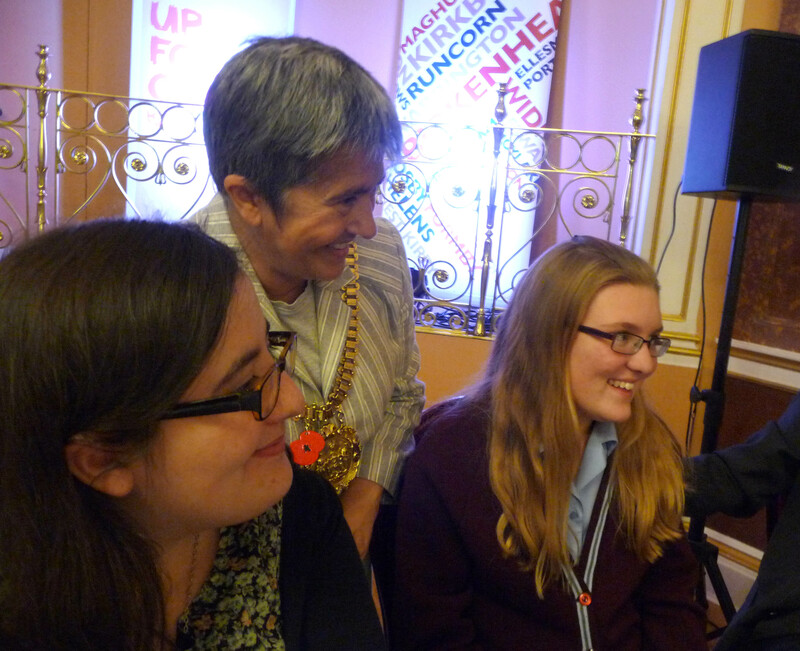 Our ‘oldest’ Young Embroiderer, Sophie, presented Val Heron, our YE Leader with a beautiful bouquet to thank her for all the work she does towards making Merseyside YE so successful. 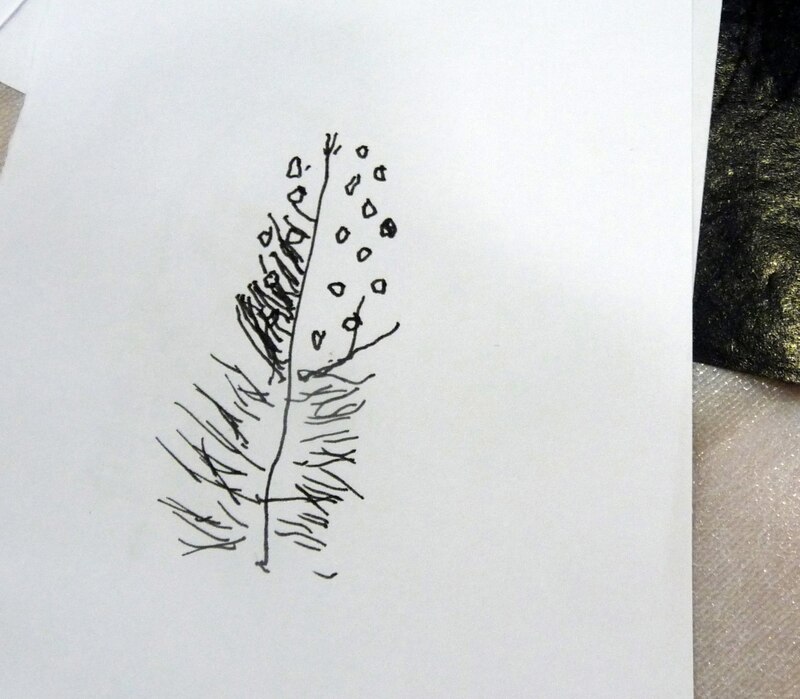 Happy Birthday YE! 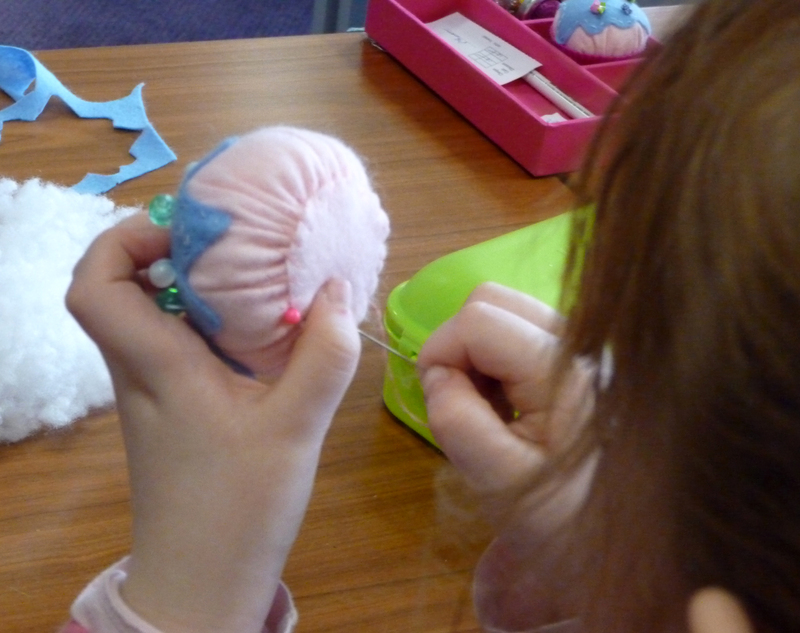 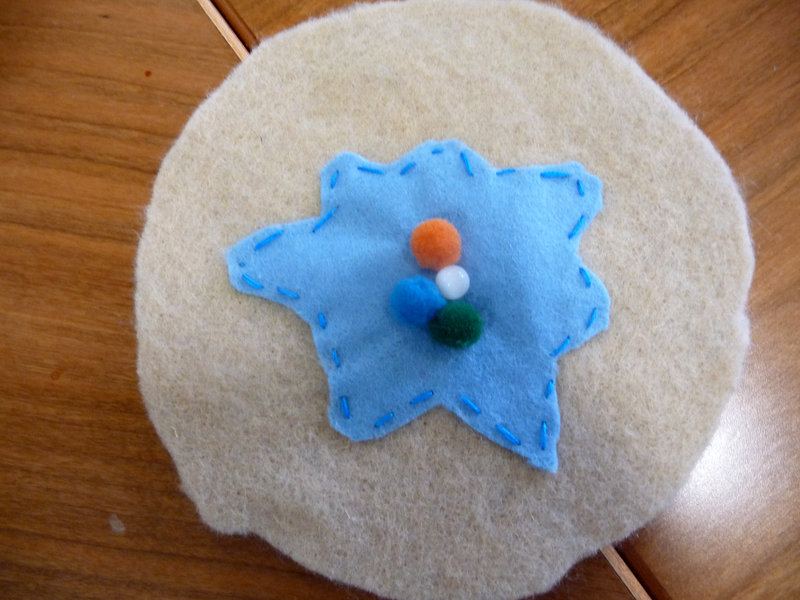 Our special project, the embroidered panel titled “In Our Liverpool Home” is nearing completion so today most of our Group spent the day making felt cupcake pin cushions for Mothers Day, which is on 30th March this year. 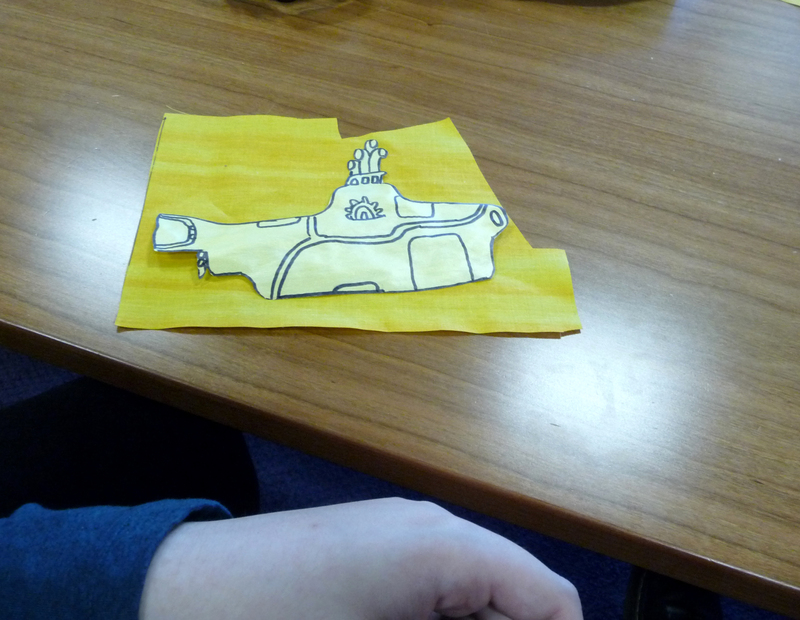 The children cut out felt shapes for cupcake, icing and base. 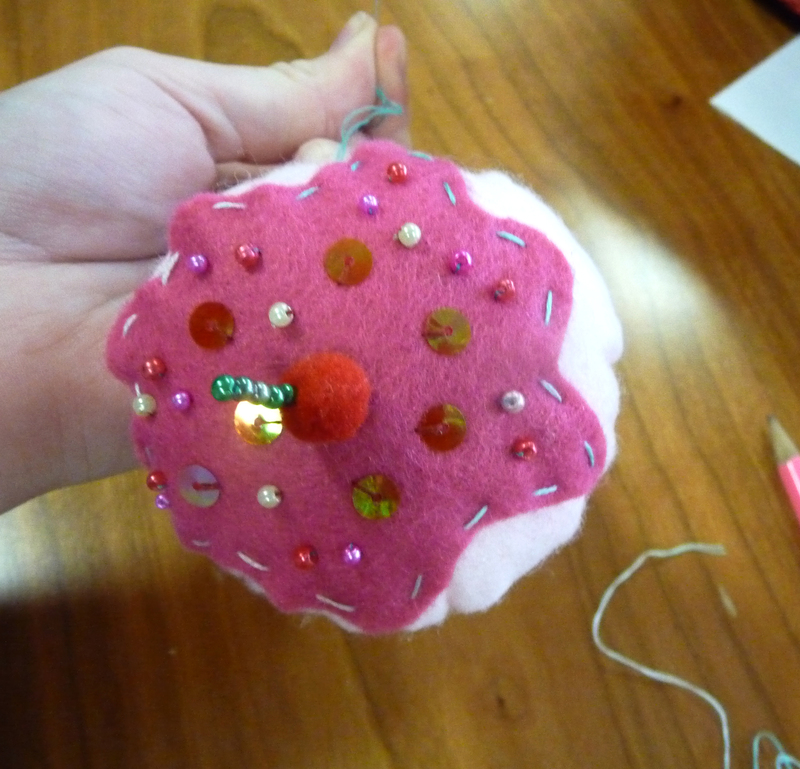 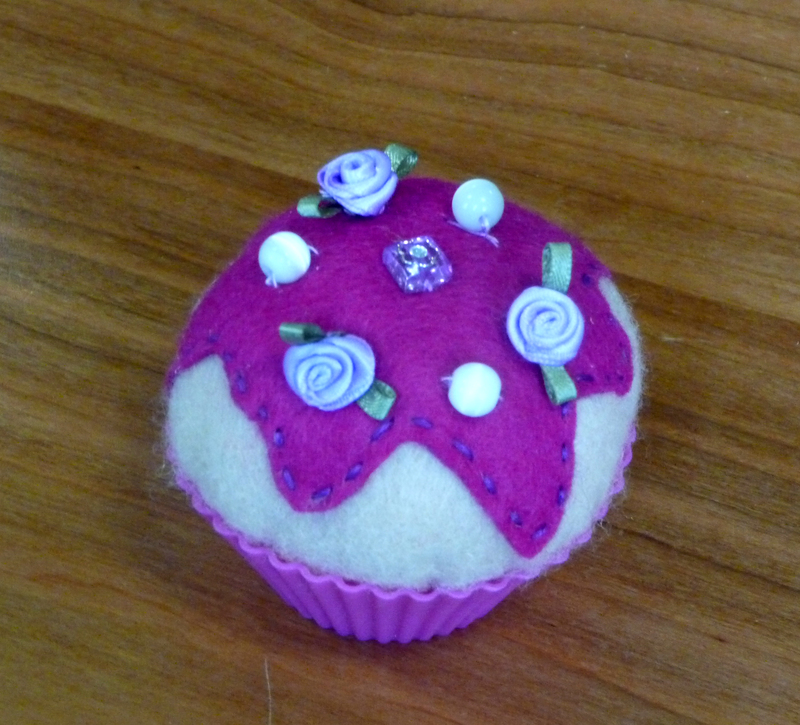 Then they sewed on the icing with running stitch, decorated the tops with all sorts of beads and buttons and worked some more running stitch around the base of the cupcake to gather it. 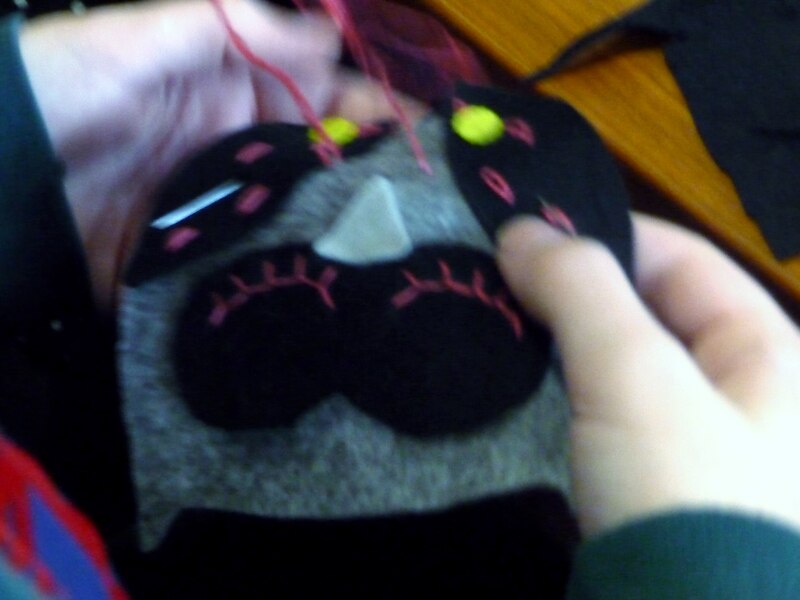 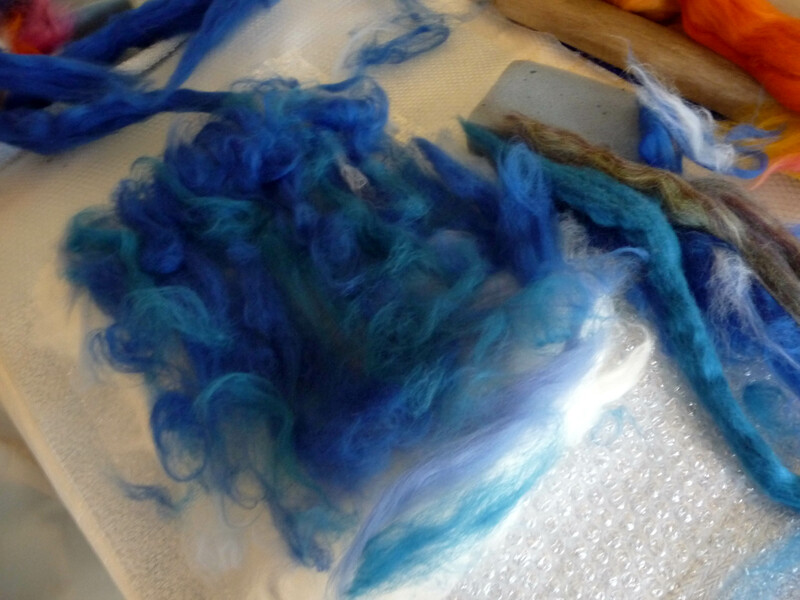 Then came the stuffing, before the base was sewn on. 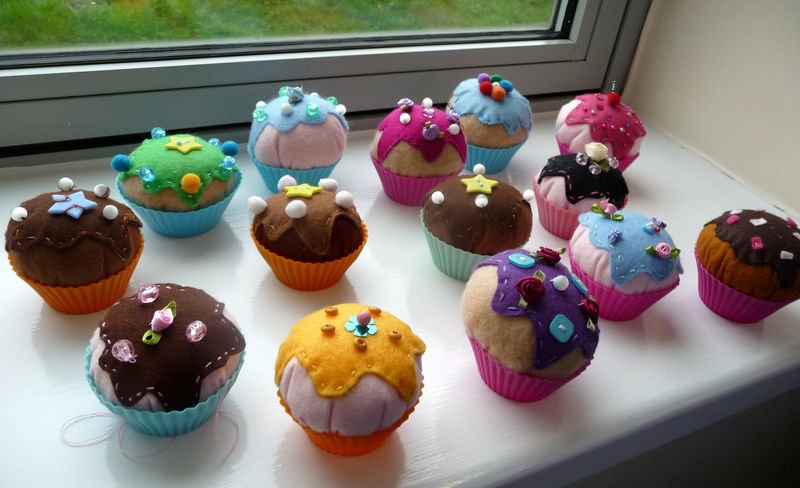 All our cupcakes look good enough to eat! 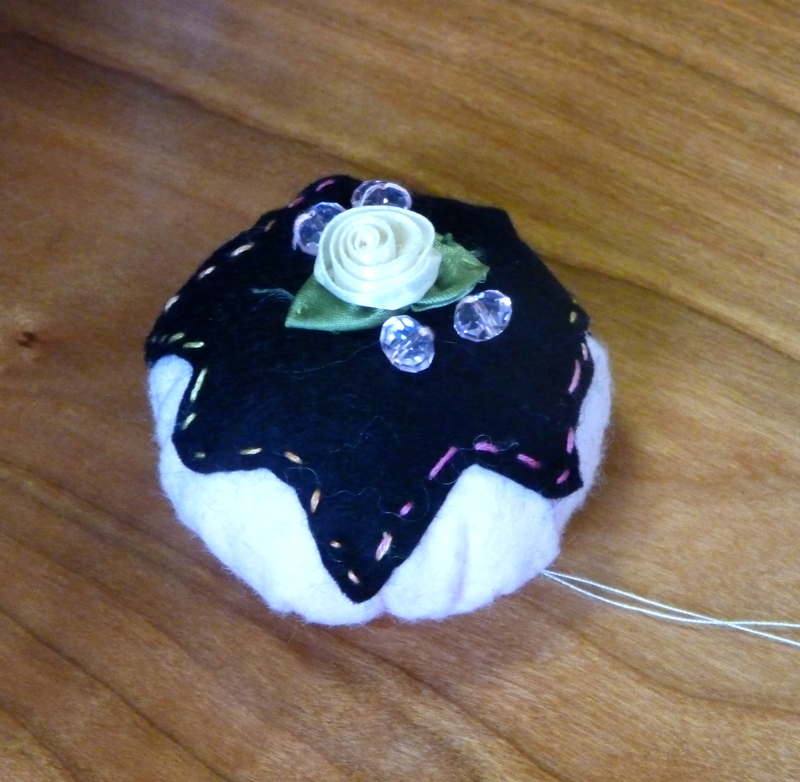 We continued with our special project this month. 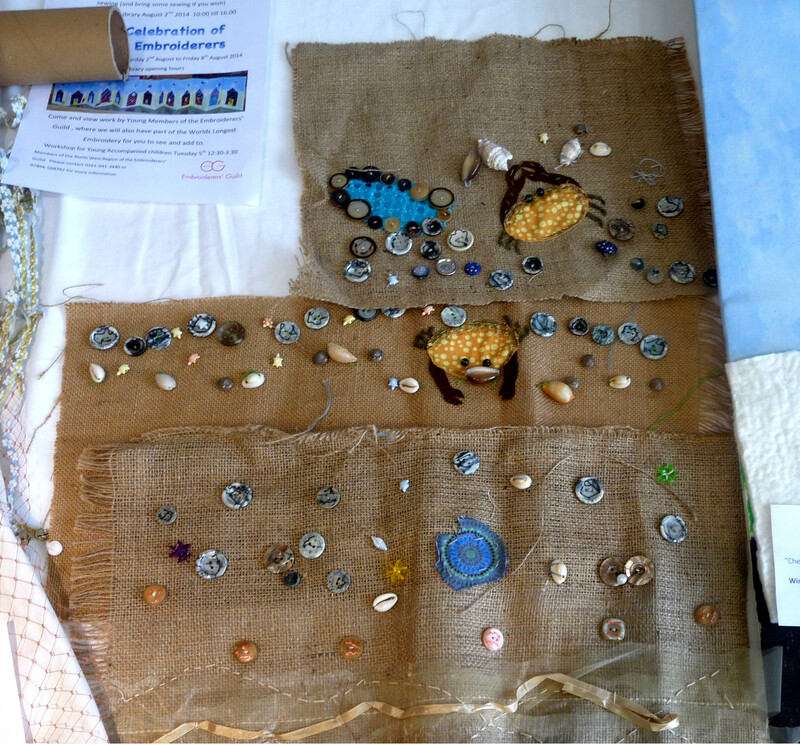 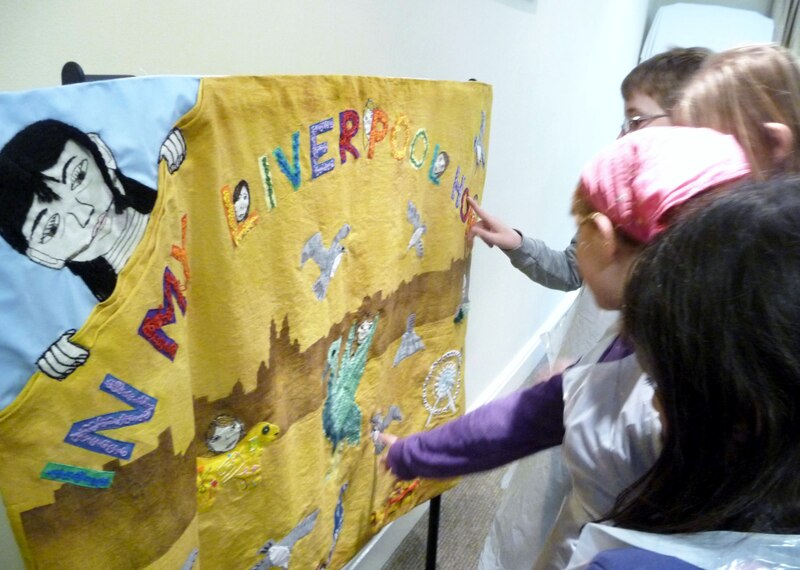 We have been commissioned by the National Association of Decorative Fine Arts in Liverpool to create an embroidered panel, which will be titled “In Our Liverpool Home”, and will show a child’s eye view of Liverpool today. 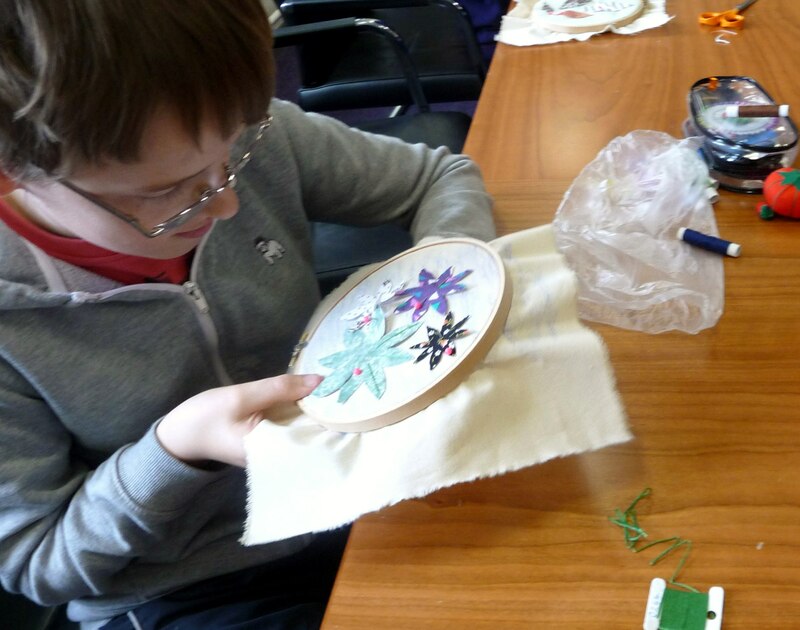 We were glad to have visitors to see our work- they were Jeremy Patterson-Fox, Liverpool NDFAS Young Arts Representative and two of his colleagues.I think our visitors liked the progress we have made with our embroidered panel. 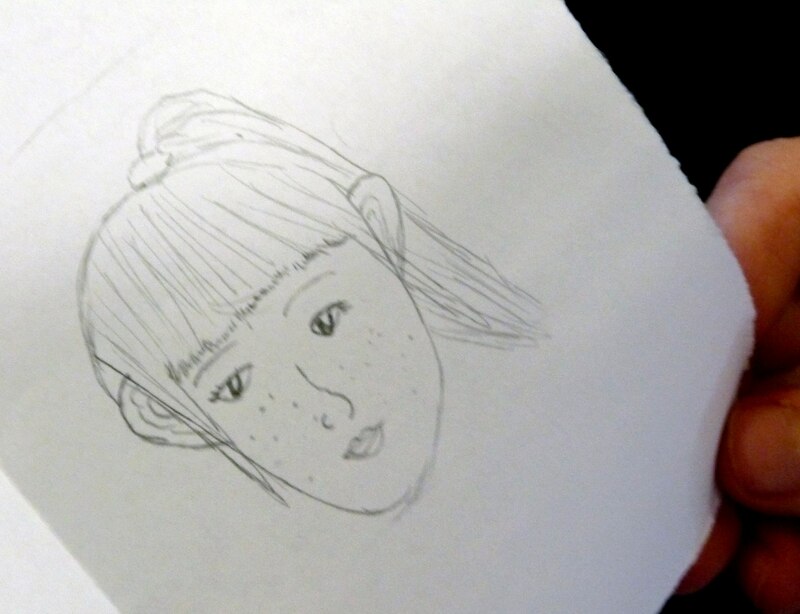 Welcome back, everyone. 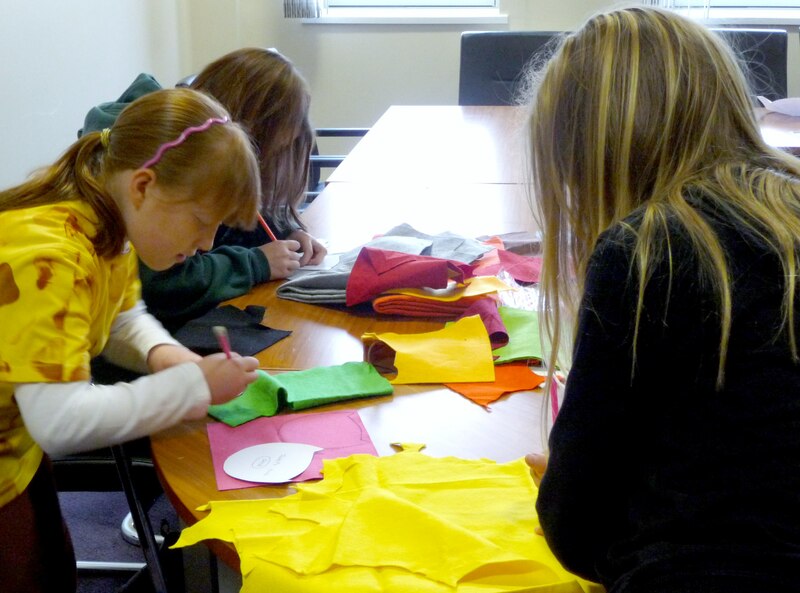 This is the first meeting of Merseyside Young Embroiderers this year, and we have an exciting project to start the new year. 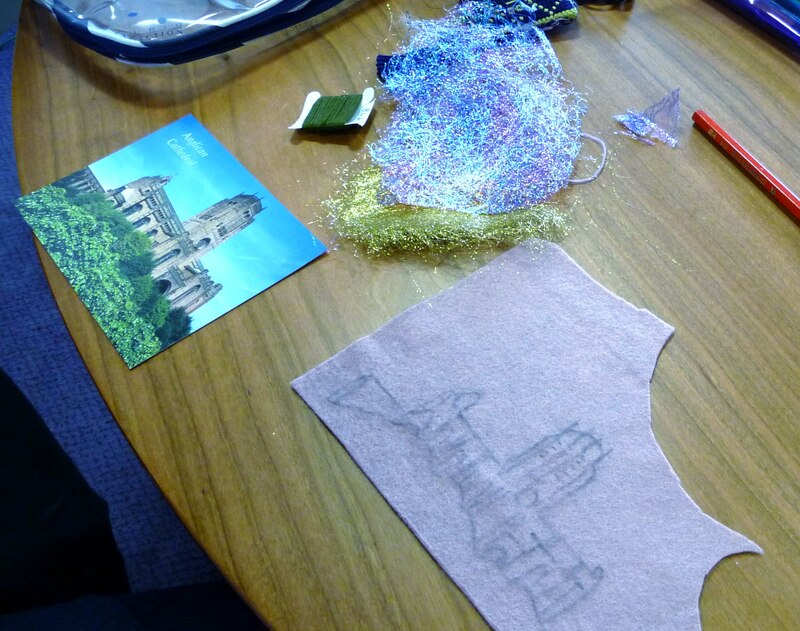 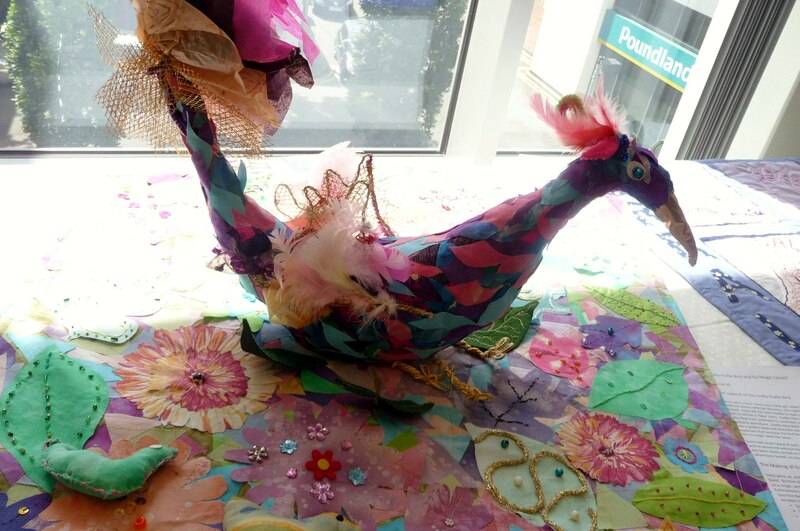 The National Association of Decorative and Fine Arts in Liverpool have commissioned Merseyside Young Embroiderers to design and embroider a panel which will show a child’s eye view of Liverpool today. 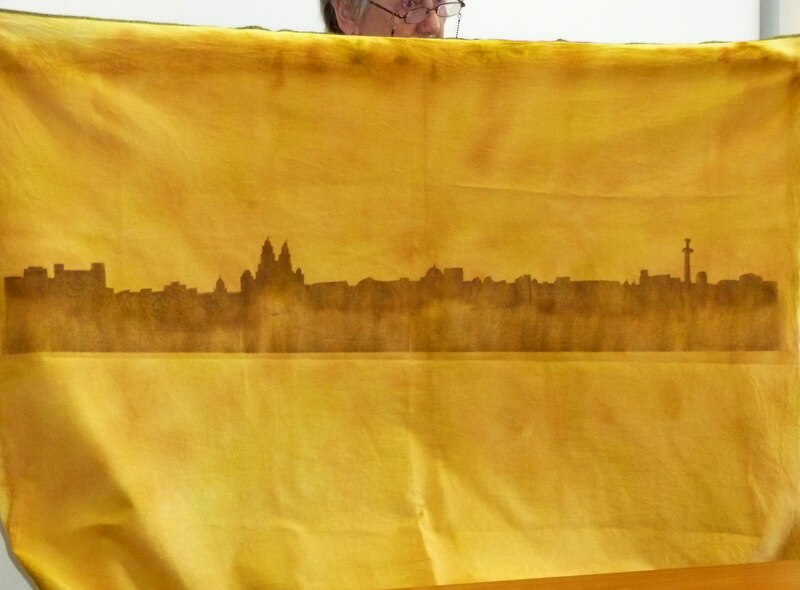 When completed this panel will hang in Liverpool’s new Museum of Liverpool, Pier Head, L3 1DG. 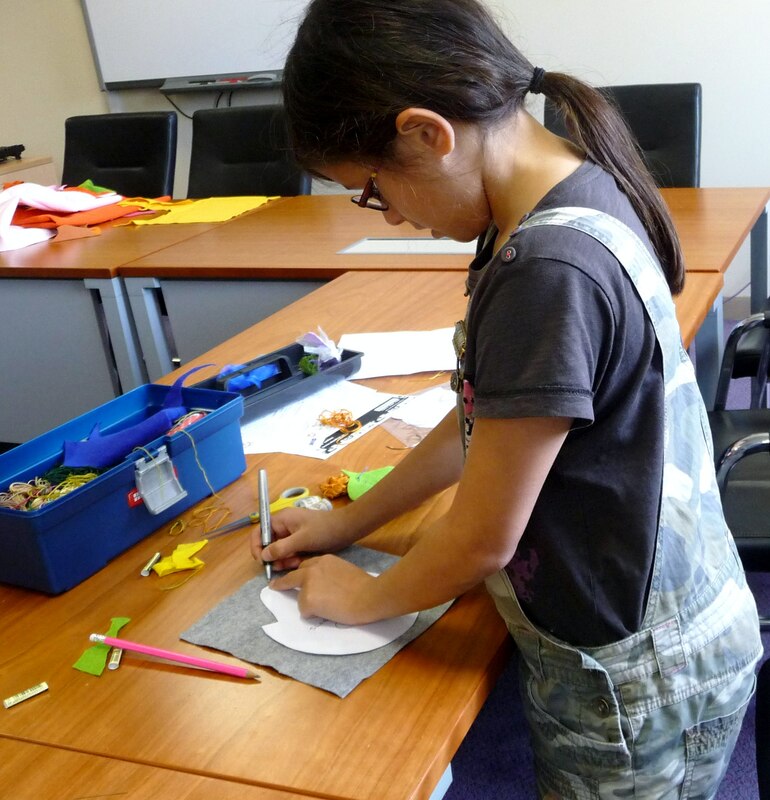 Before the Christmas break we asked each child to draw something that represented Liverpool to them, and they came up with some good suggestions and drawings, which will be included in the panel. 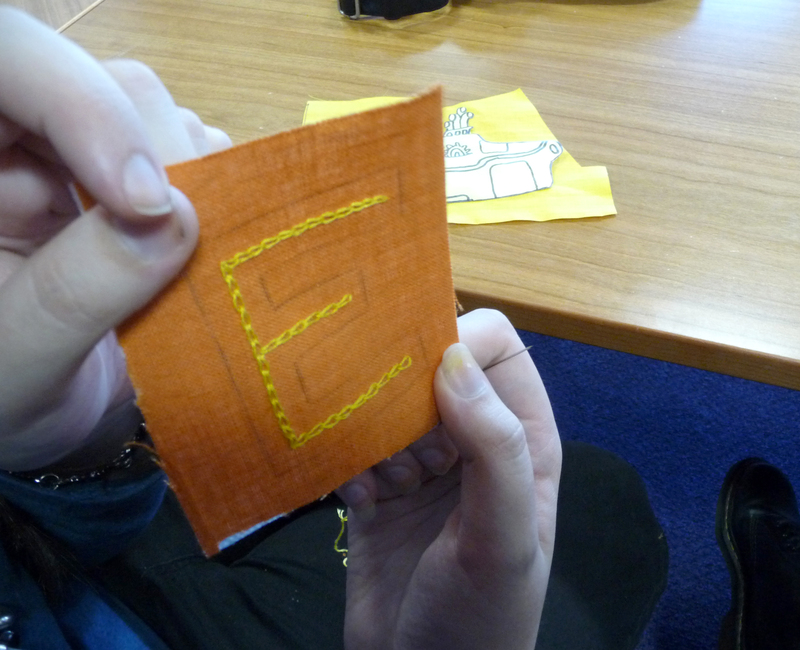 Today we started with some basic letters, and some seagulls, also Sophie has begun to embroider the Yellow Submarine which she drew. 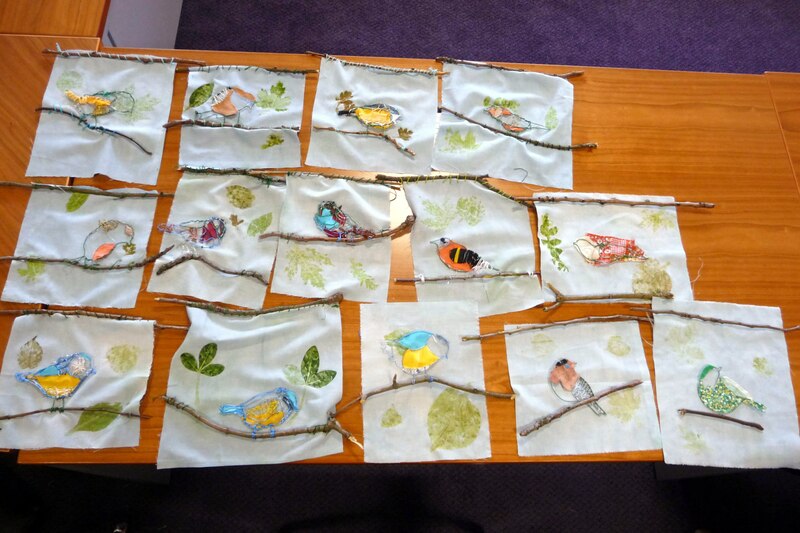 Next month we will place them all on the background and watch our mural take shape.